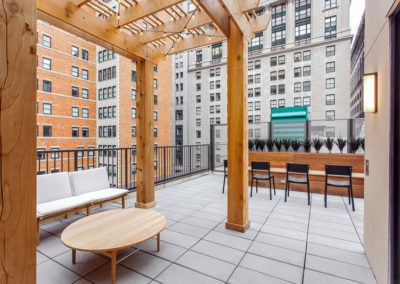 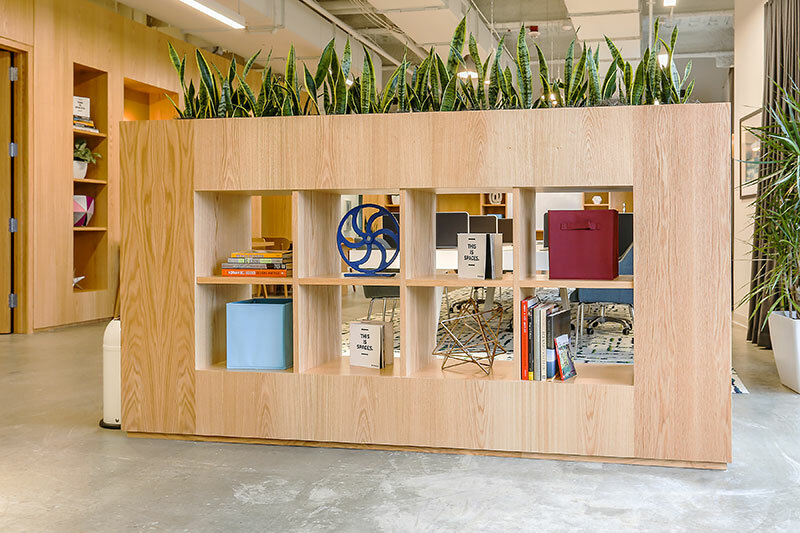 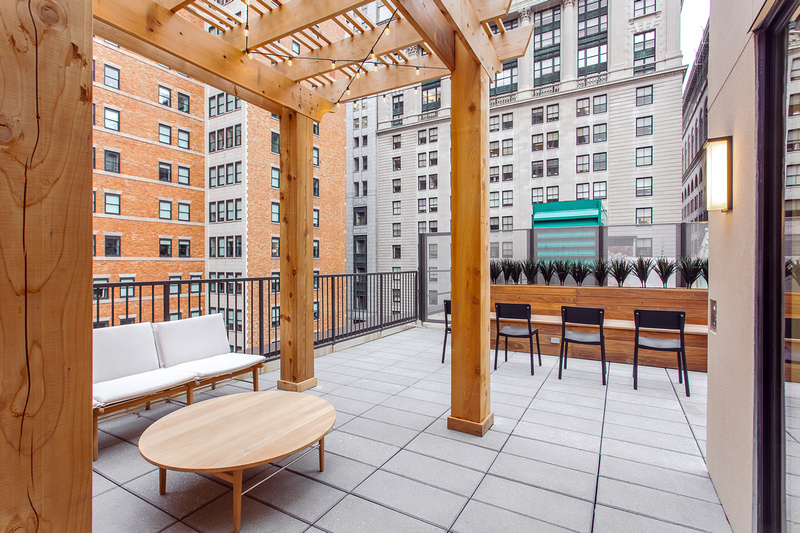 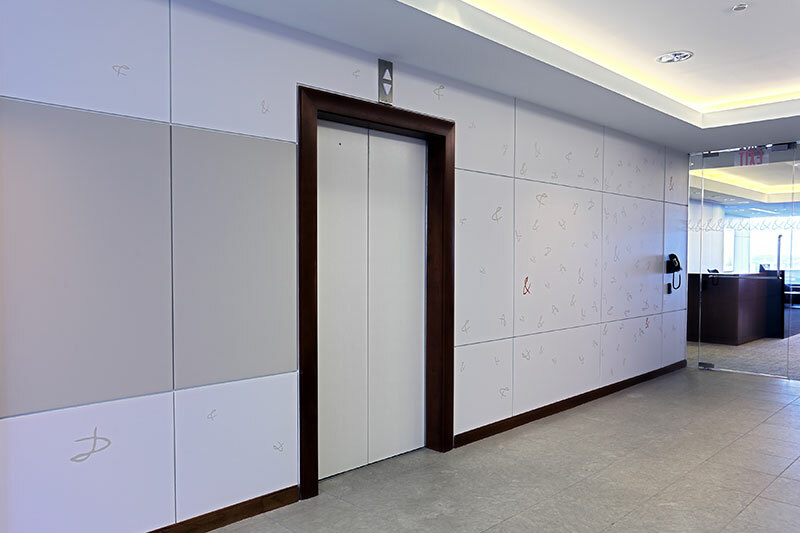 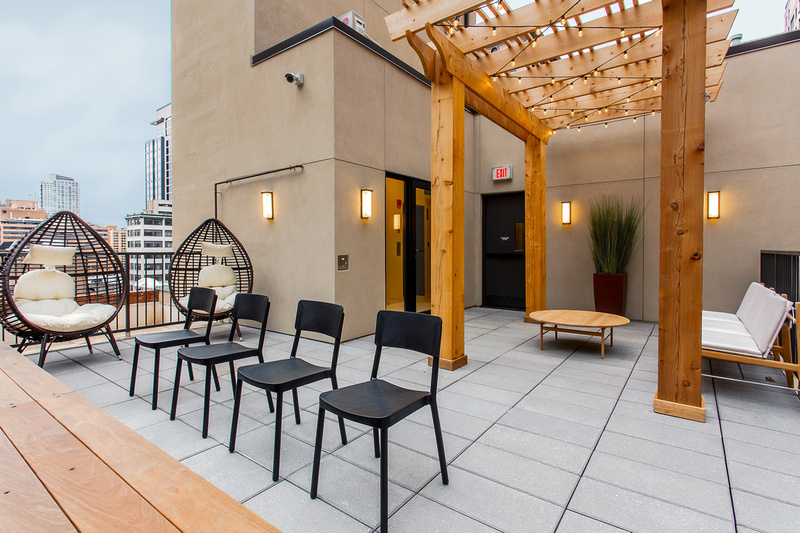 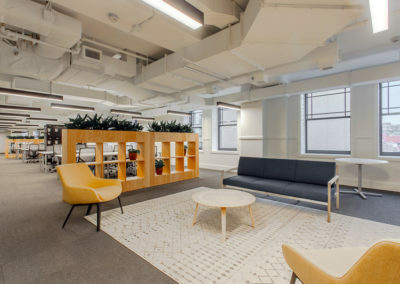 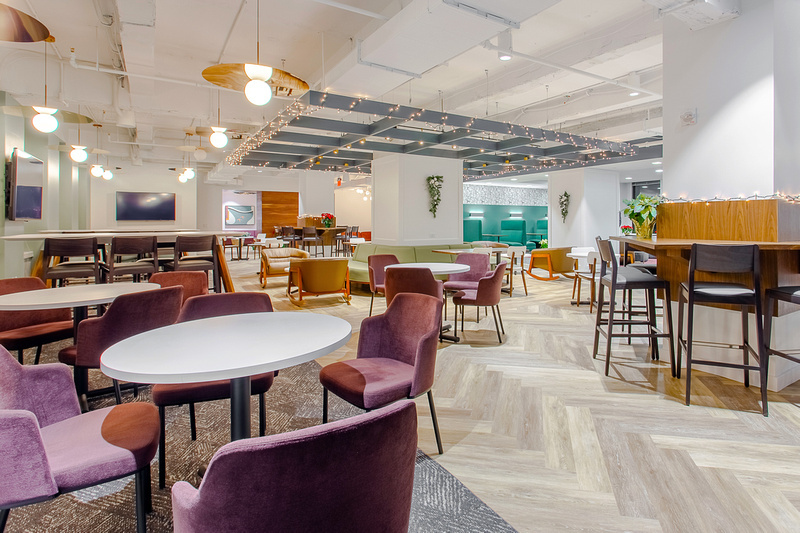 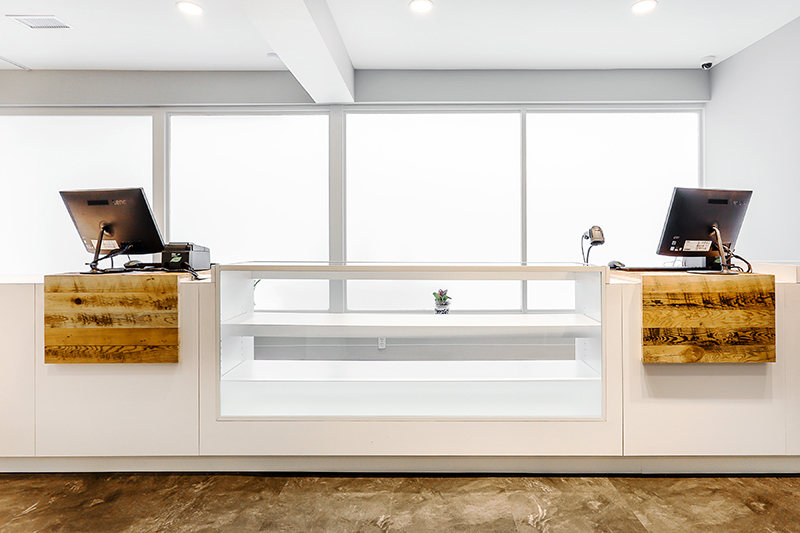 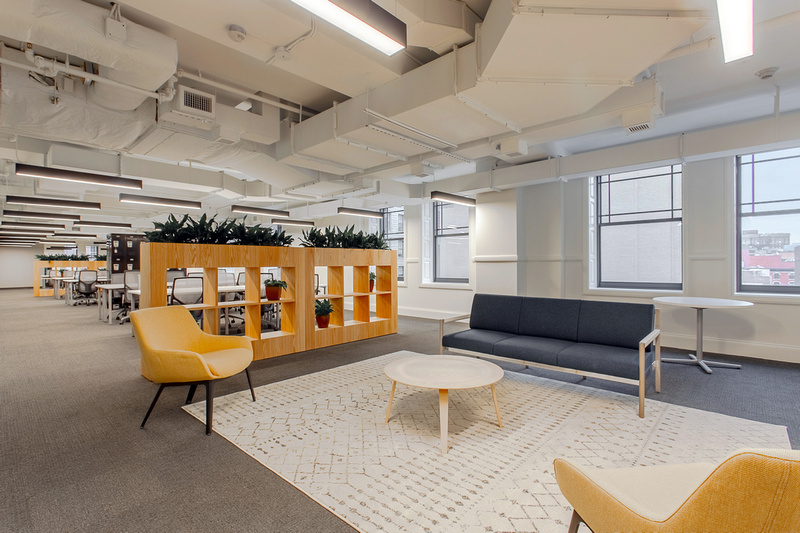 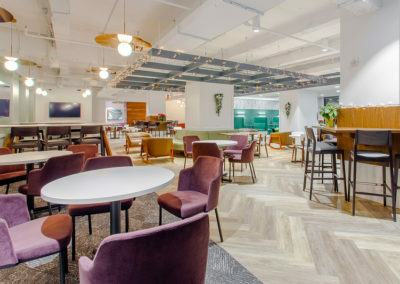 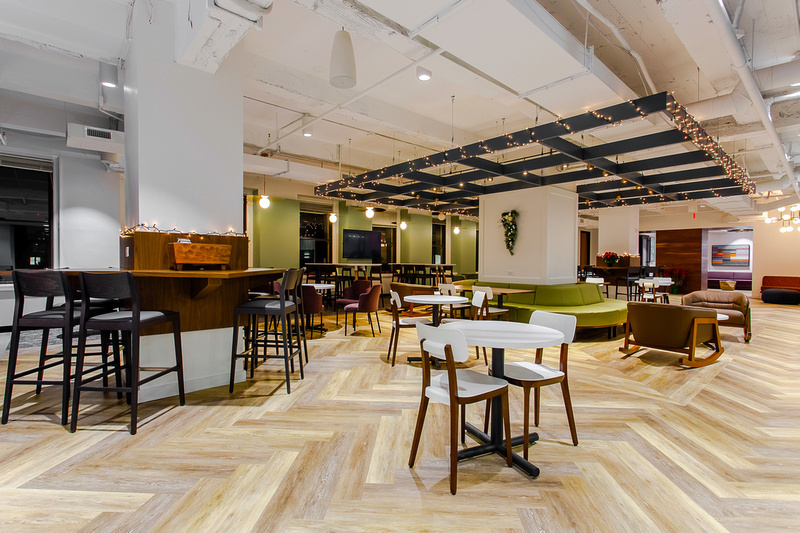 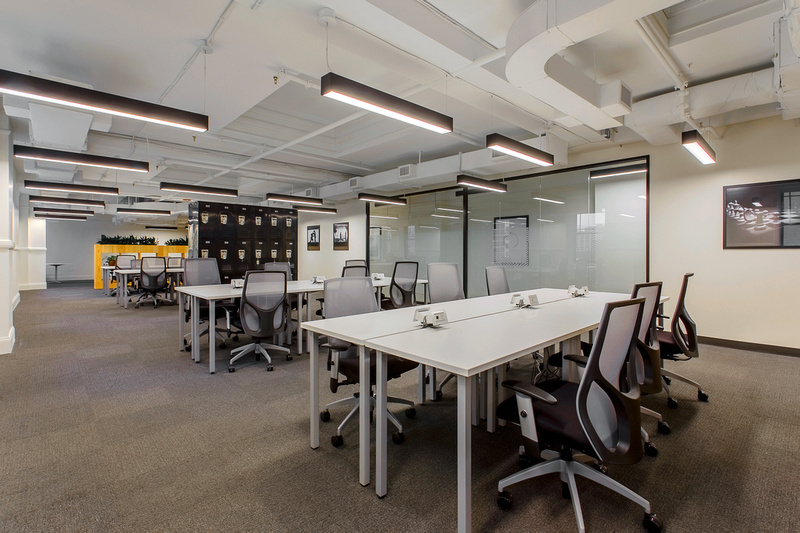 Interior fitout of approximately 33,800sf consisting of 6 floors and a roof top terrace. 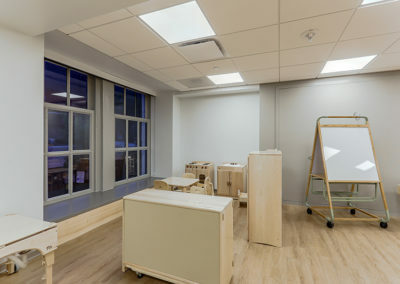 This project was located at the Hale Building which was built in 1887. 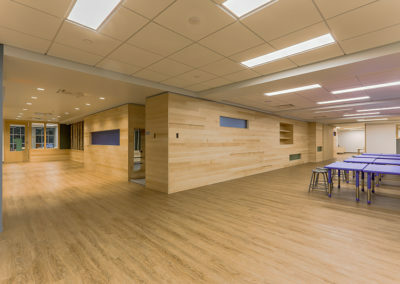 It was originally built by W.G. 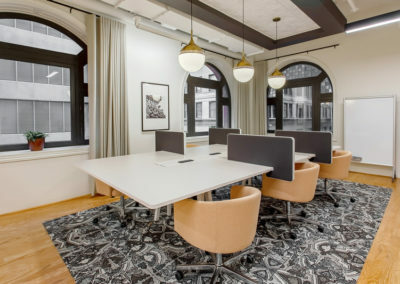 Hale who also designed the Divine Lorraine. 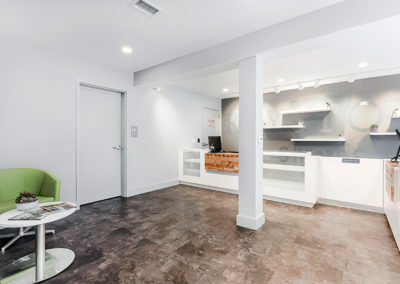 Once the home of the Garrick Theater in the early 1900’s and in the 50’s and 60’s was used as a Turkish bath house. 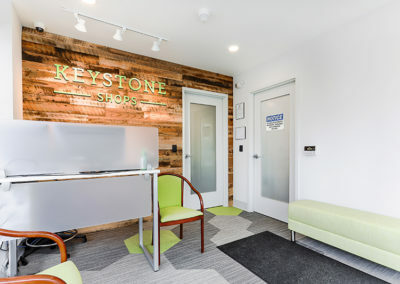 The property was purchased and developed by Brickstone Realty. 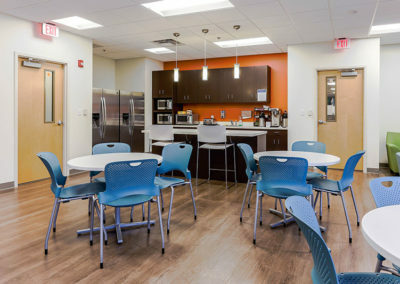 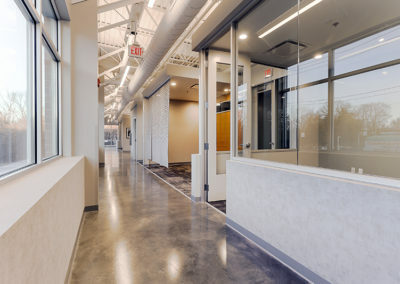 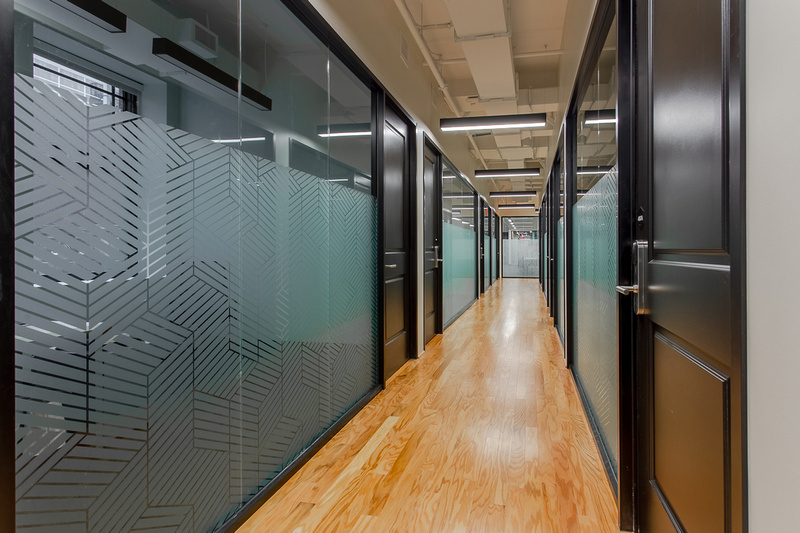 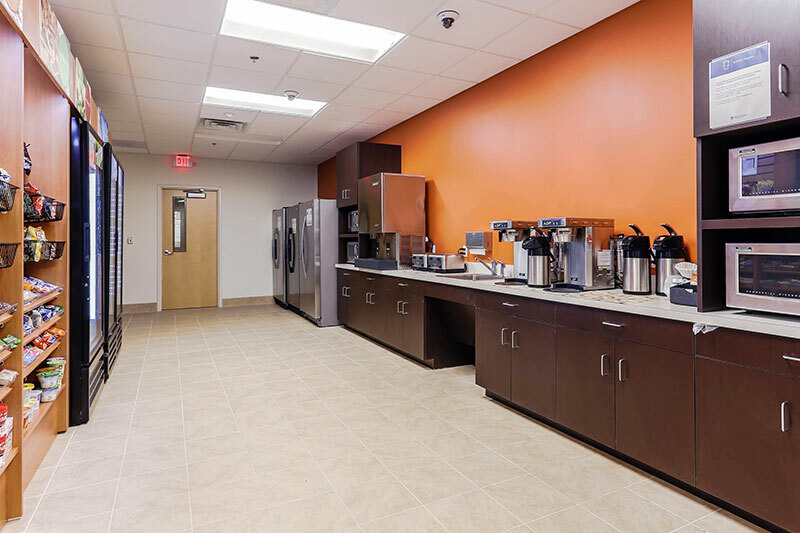 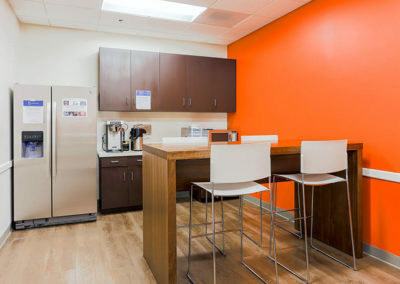 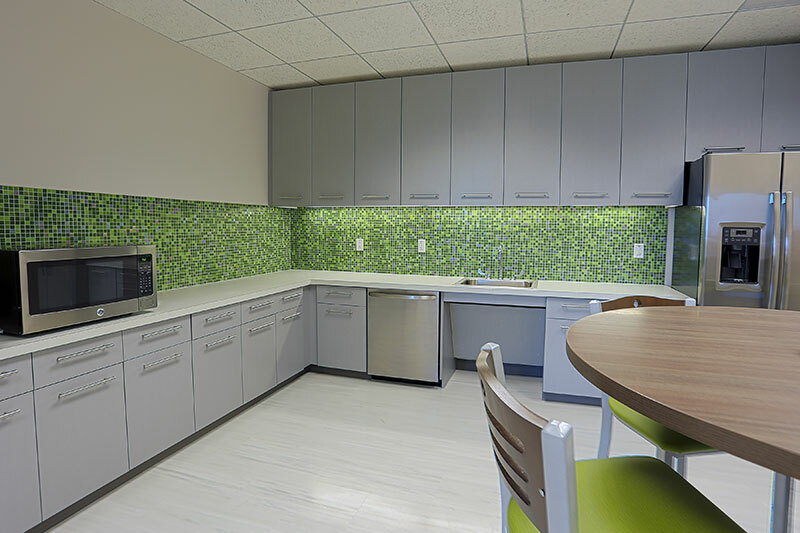 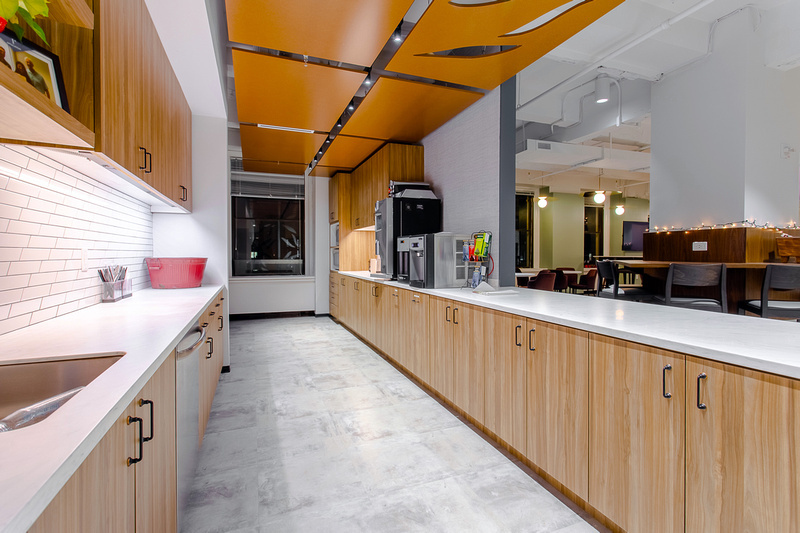 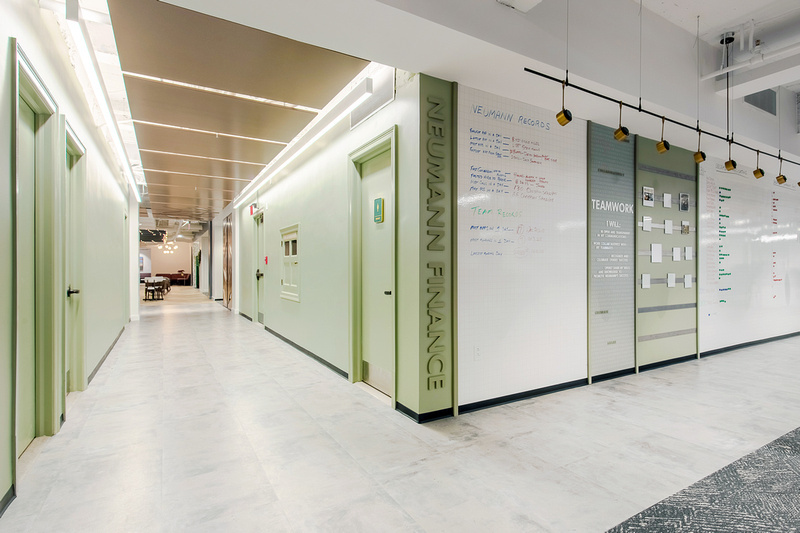 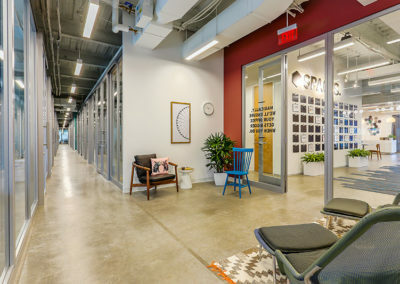 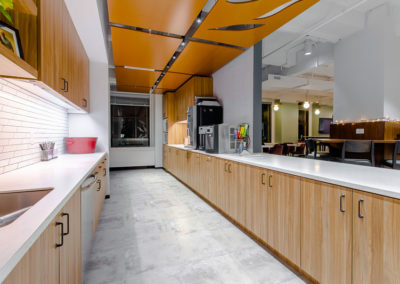 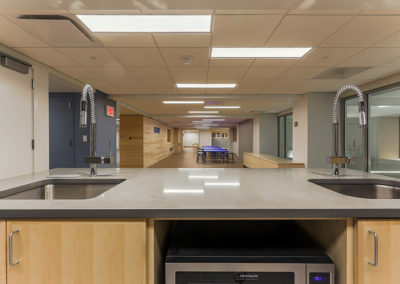 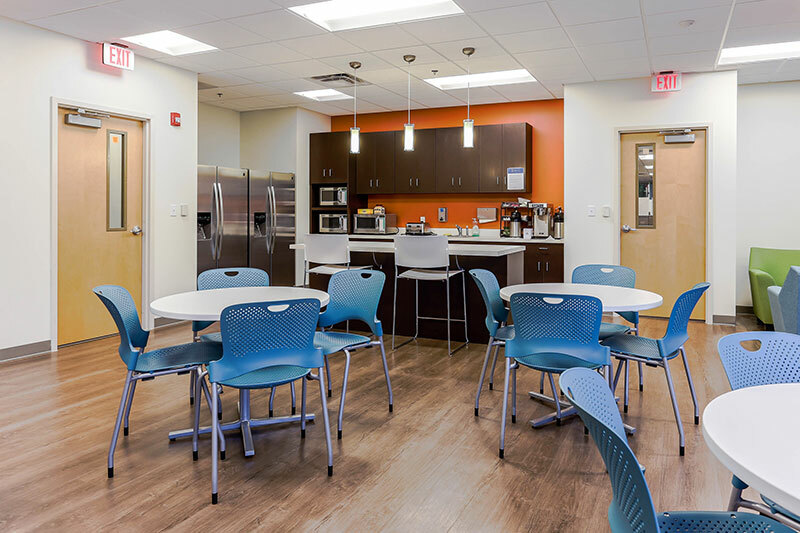 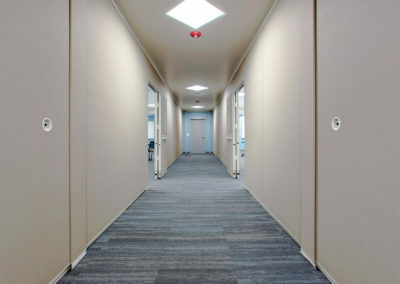 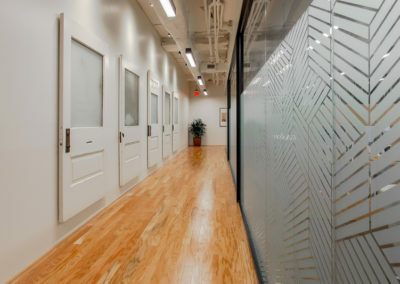 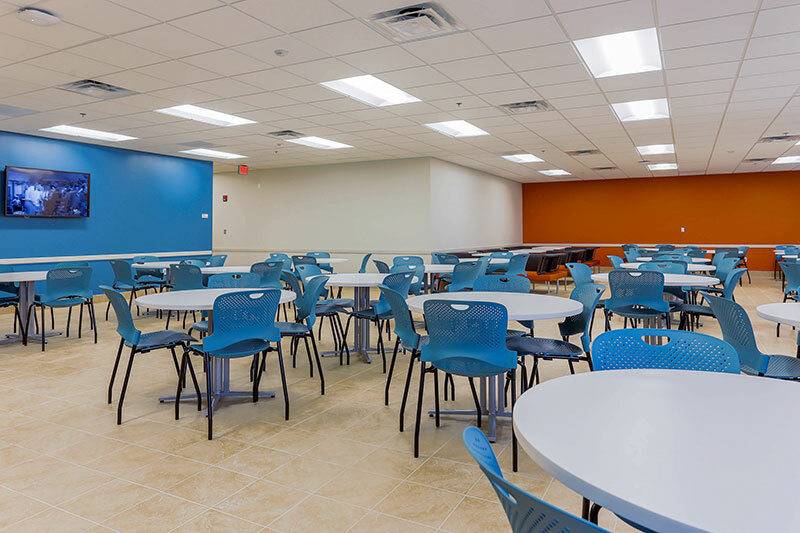 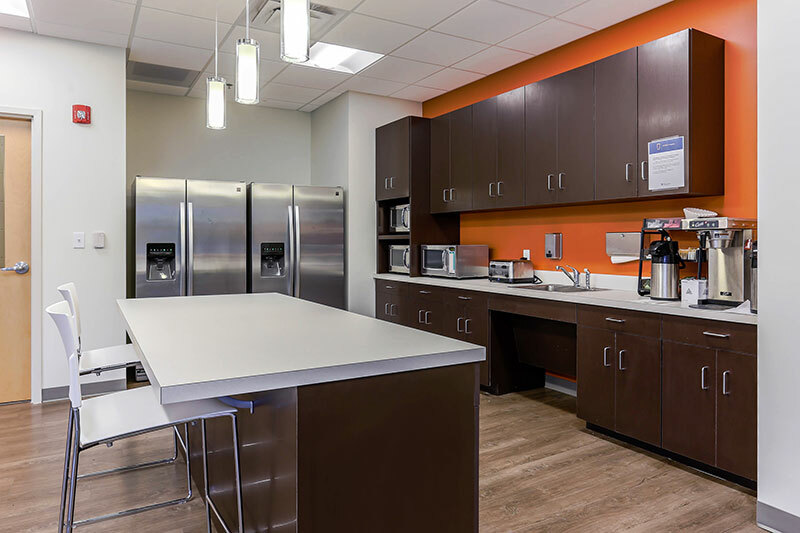 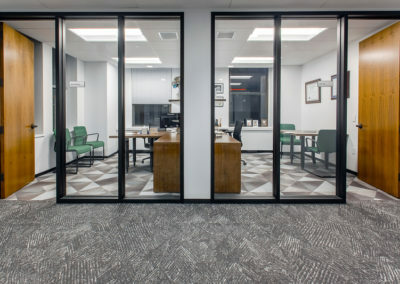 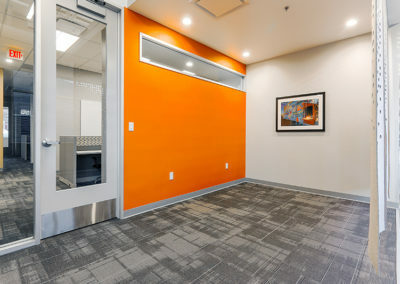 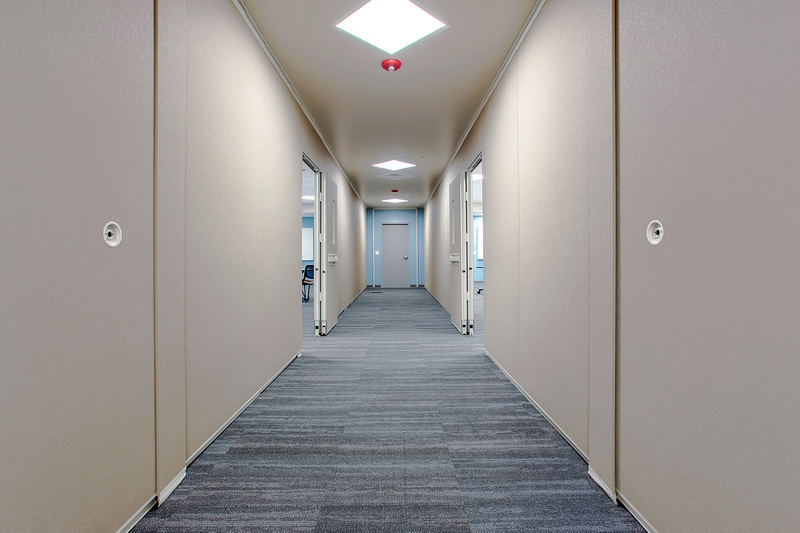 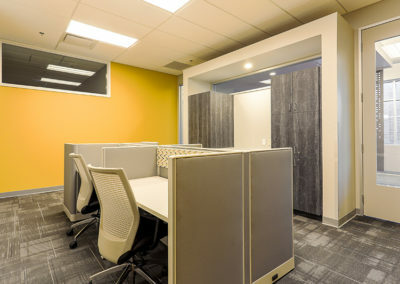 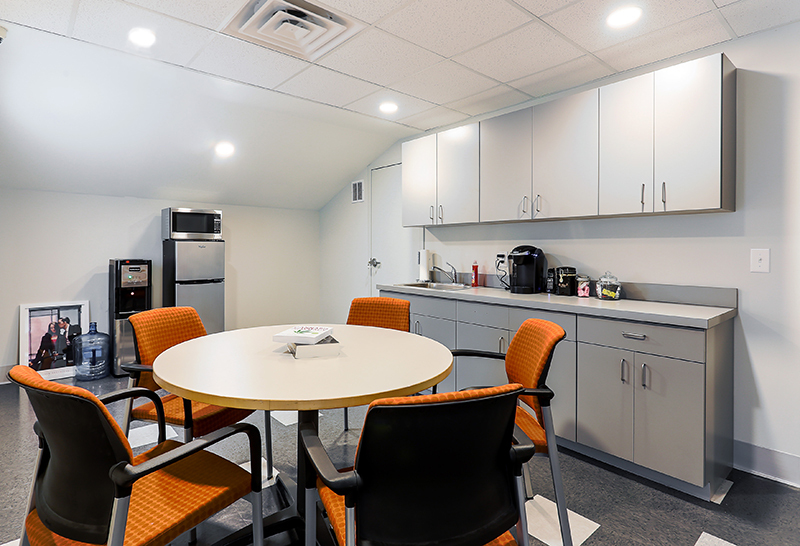 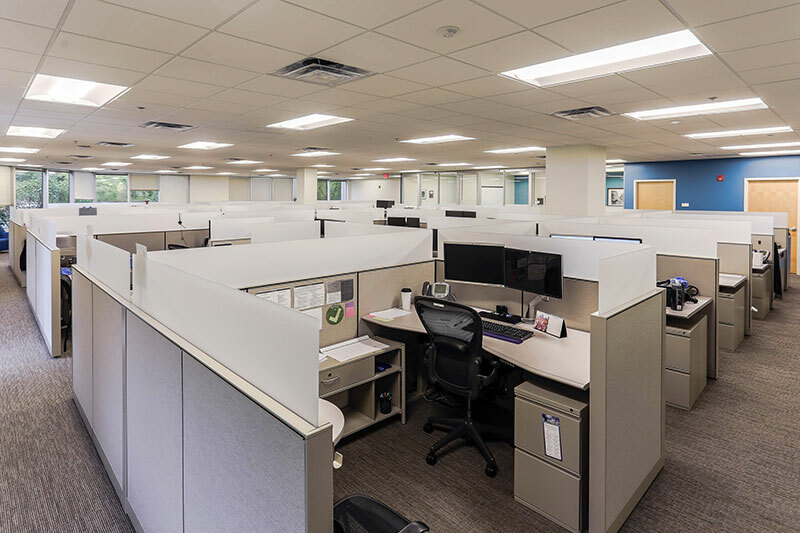 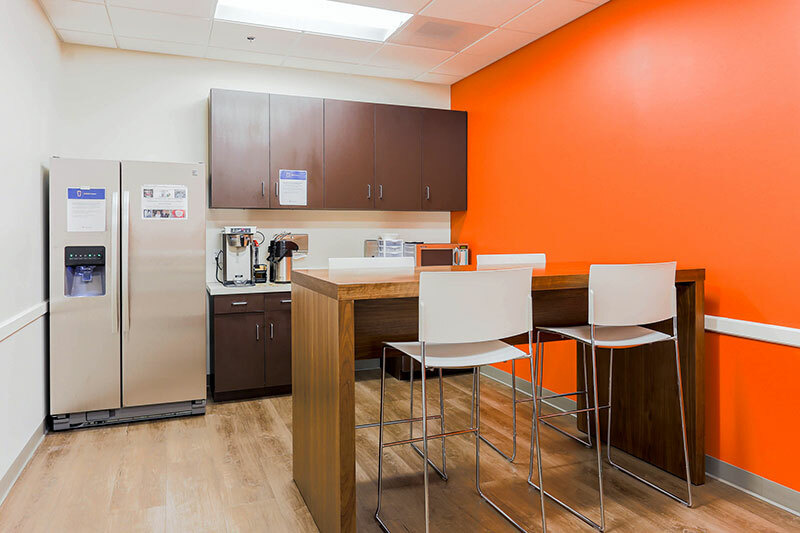 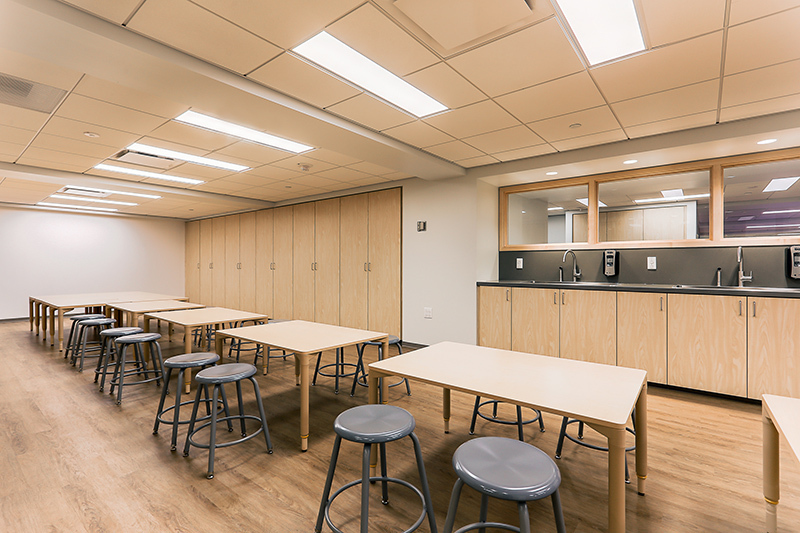 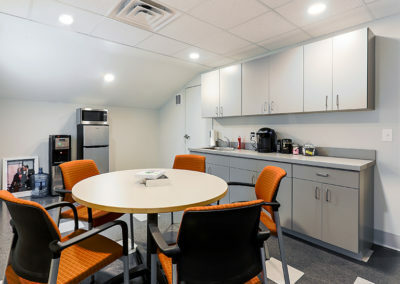 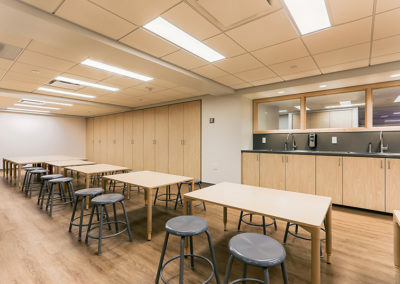 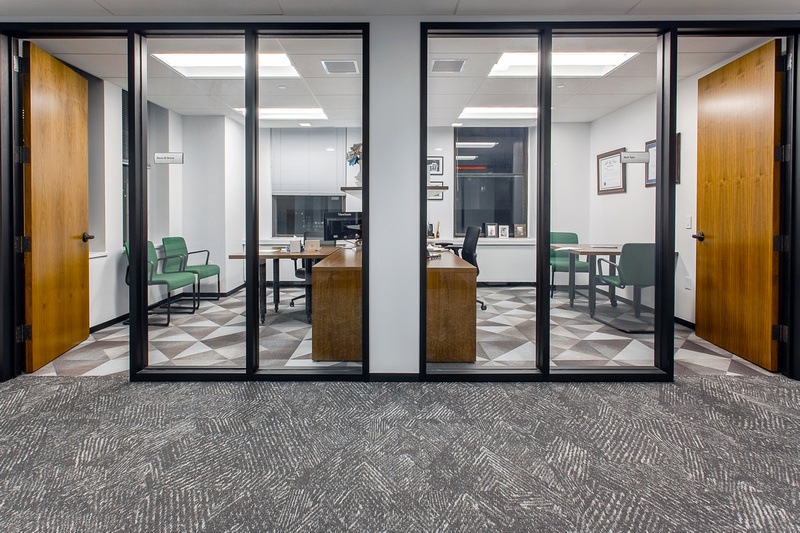 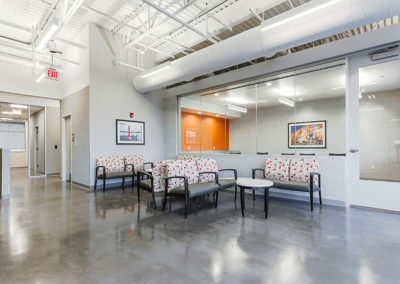 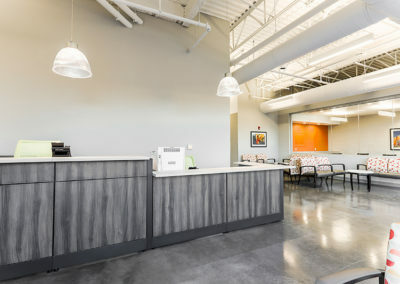 This project involved constructing a new office area consisting of Training Rooms, Open Office Areas, Huddle Areas, Pantry, Game Room and a Collaboration/Lunchroom area. 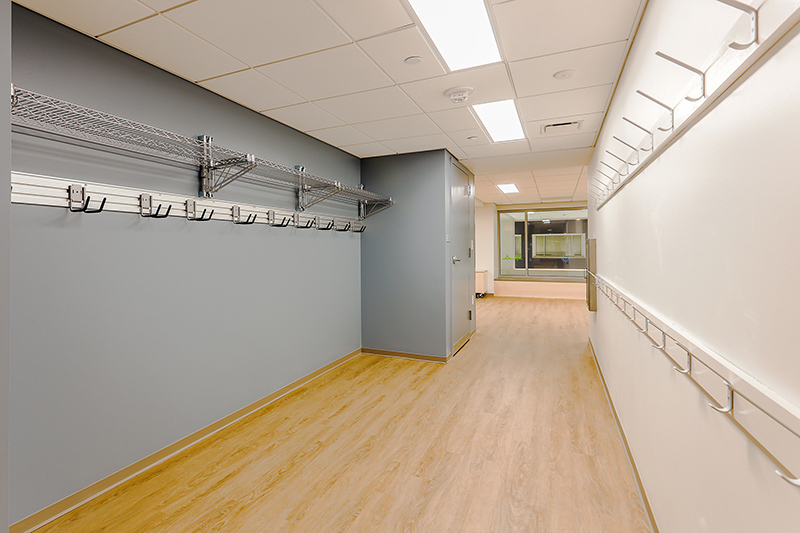 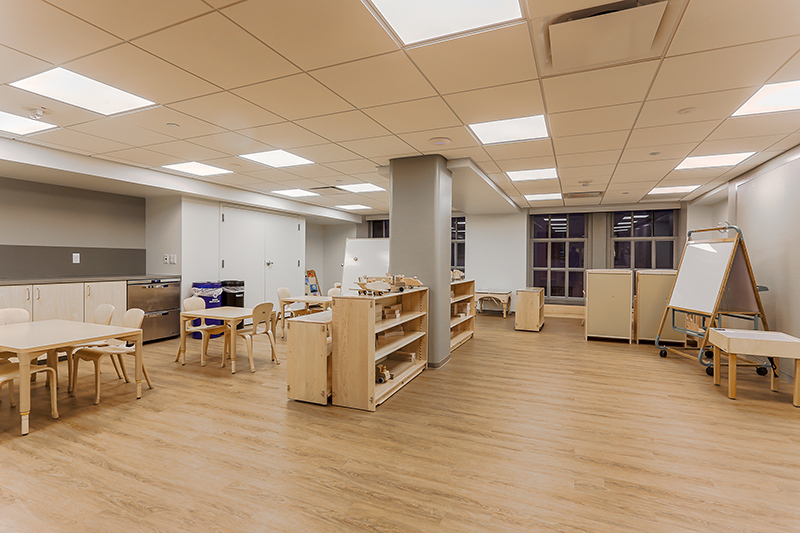 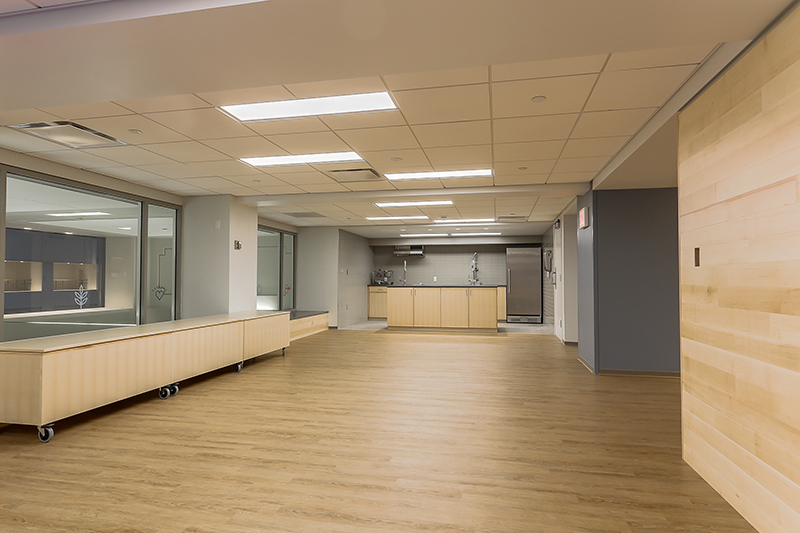 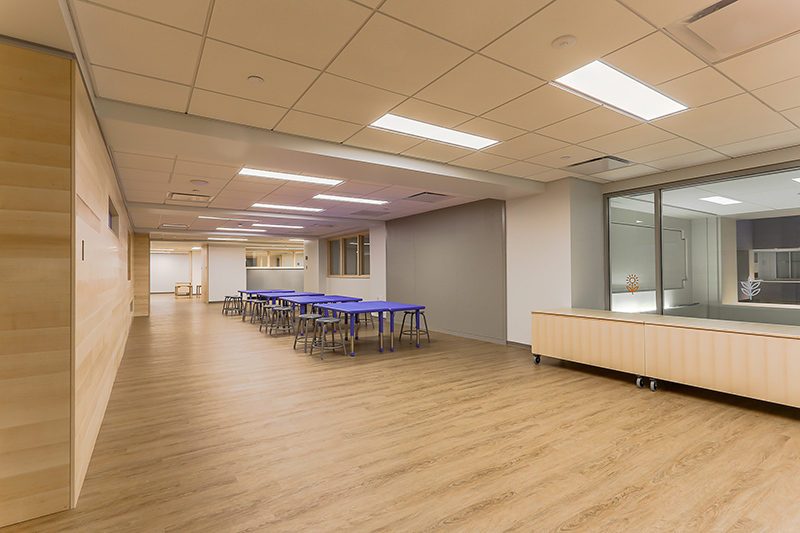 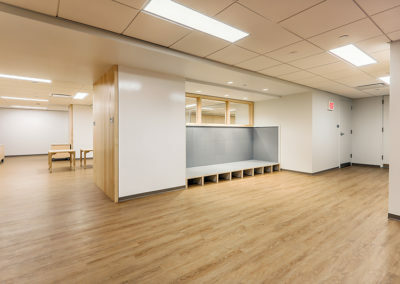 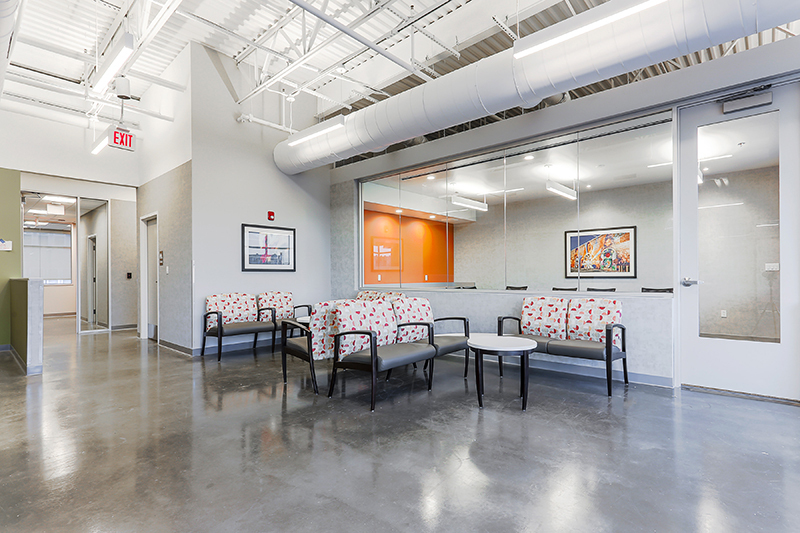 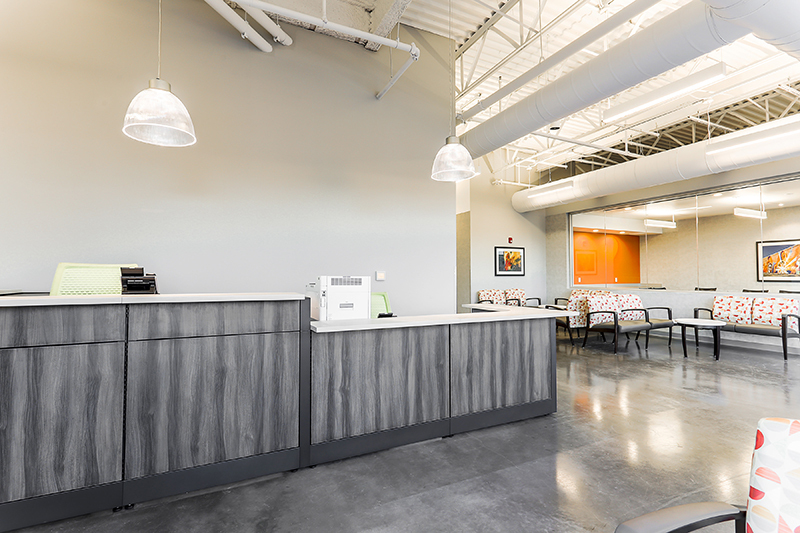 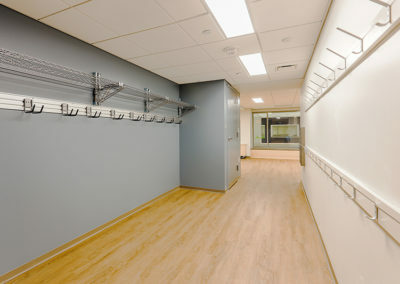 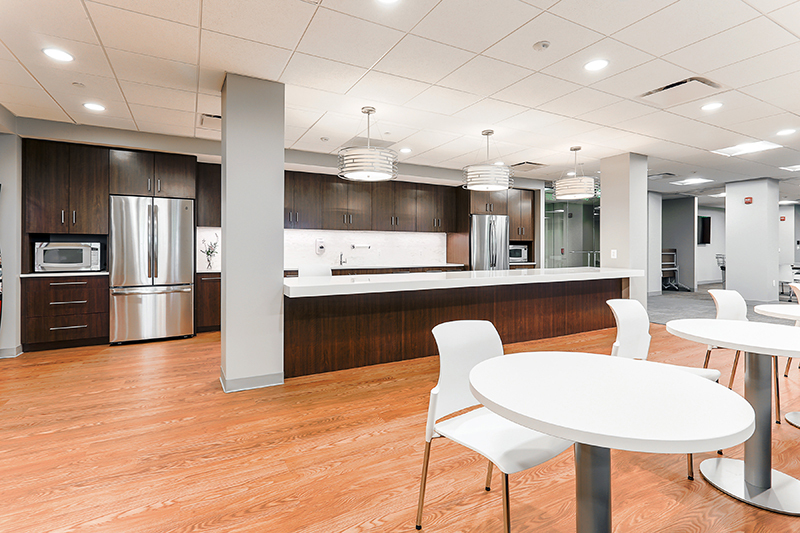 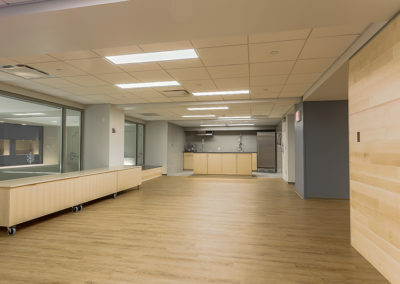 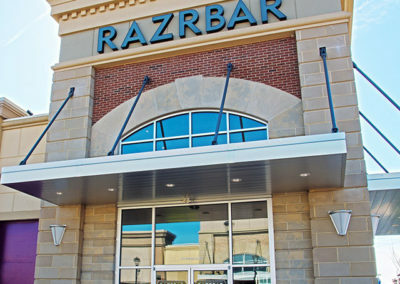 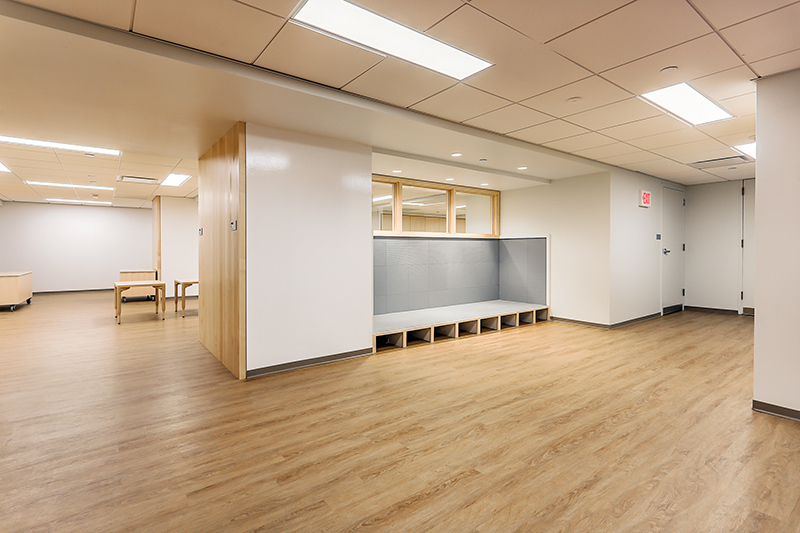 The total area of renovation was 19,690sf. 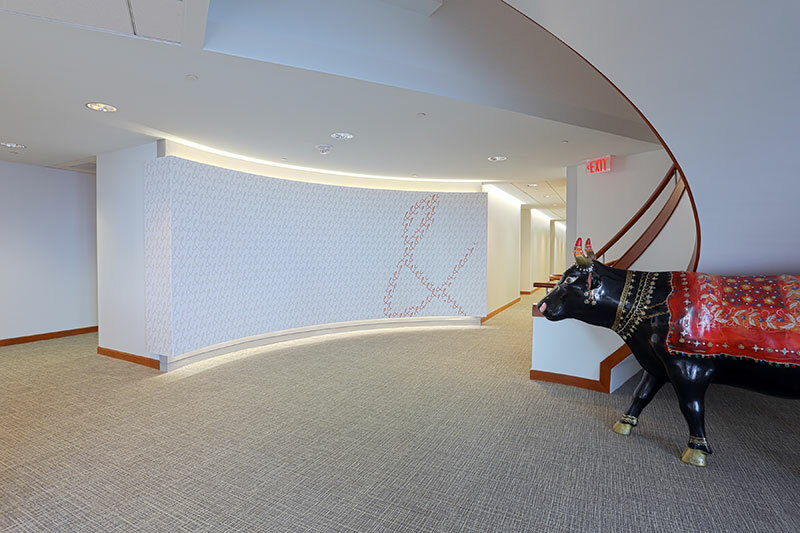 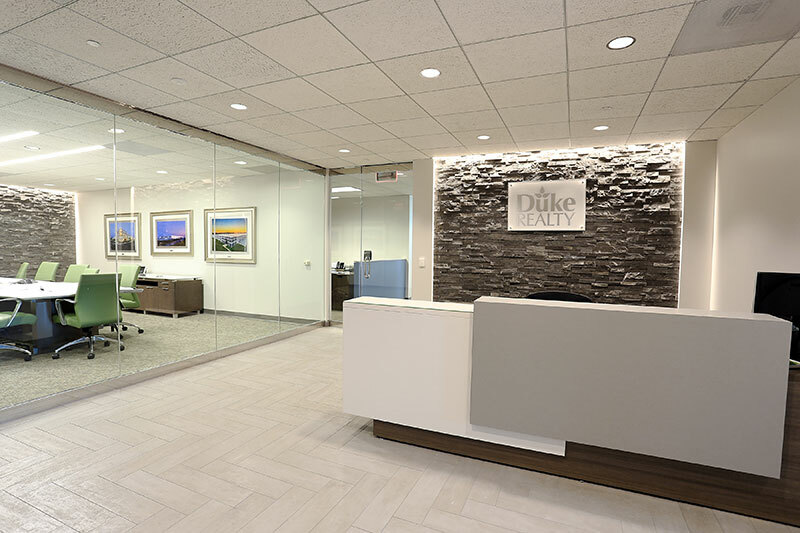 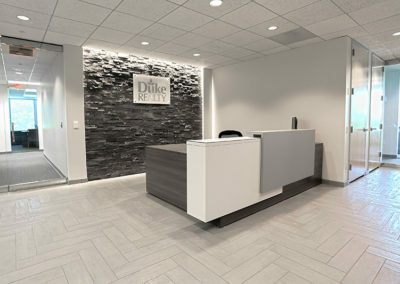 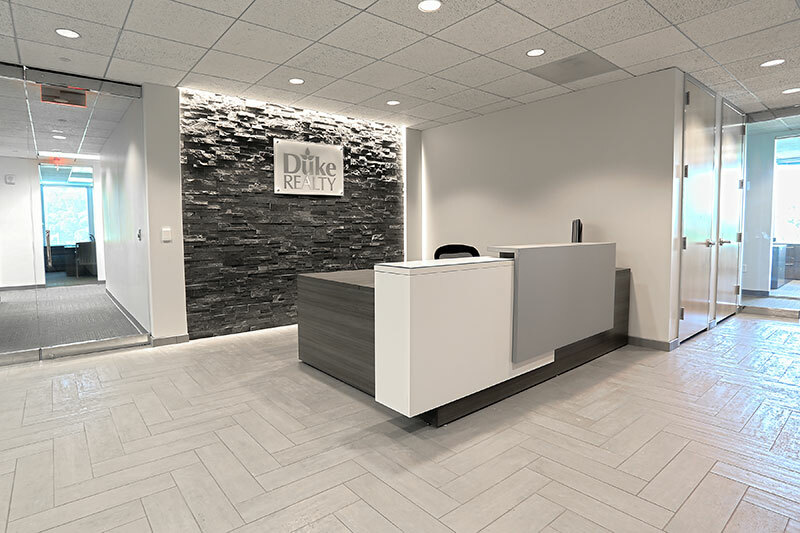 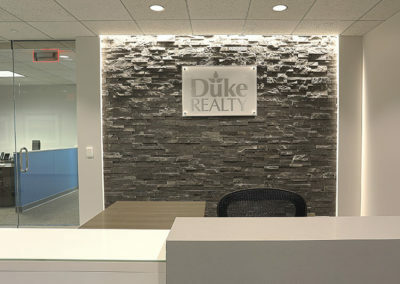 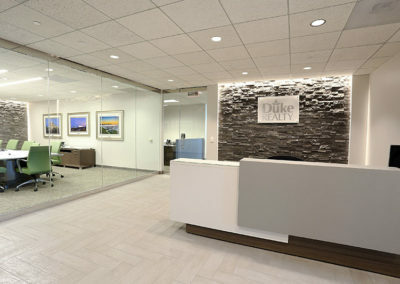 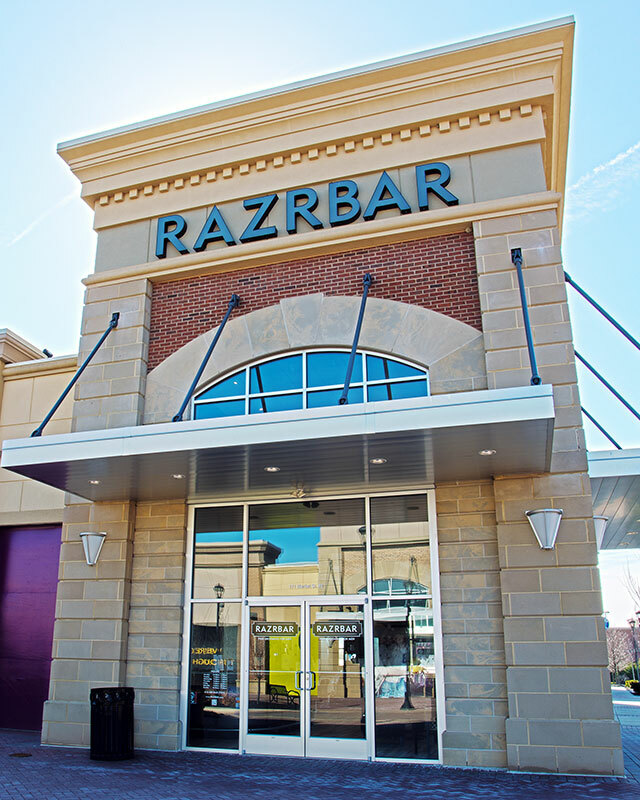 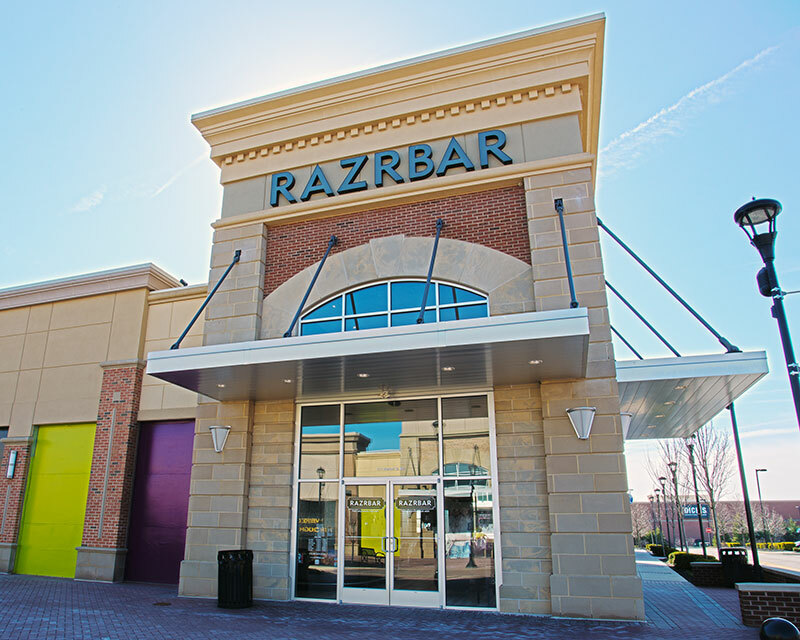 The architect for this exciting project was D2 Solutions out of King of Prussia. 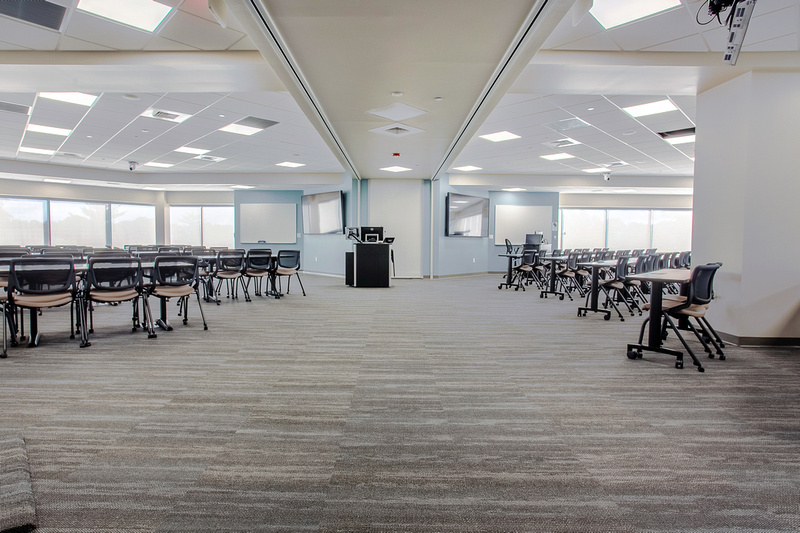 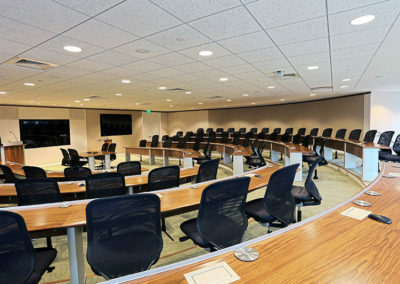 Renovation of a 7,100sf, 330 seat Lecture Hall with a state of the art audio visual system. 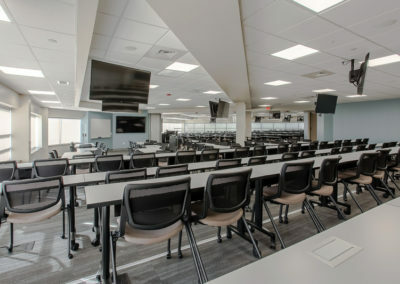 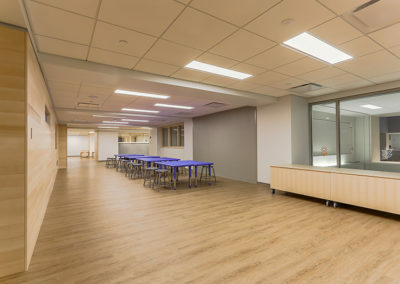 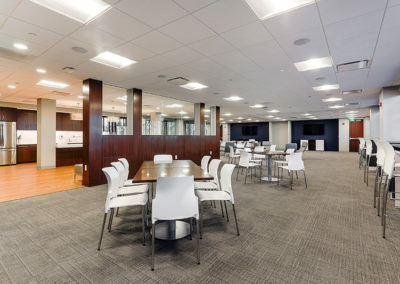 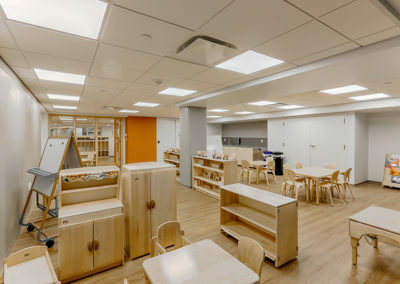 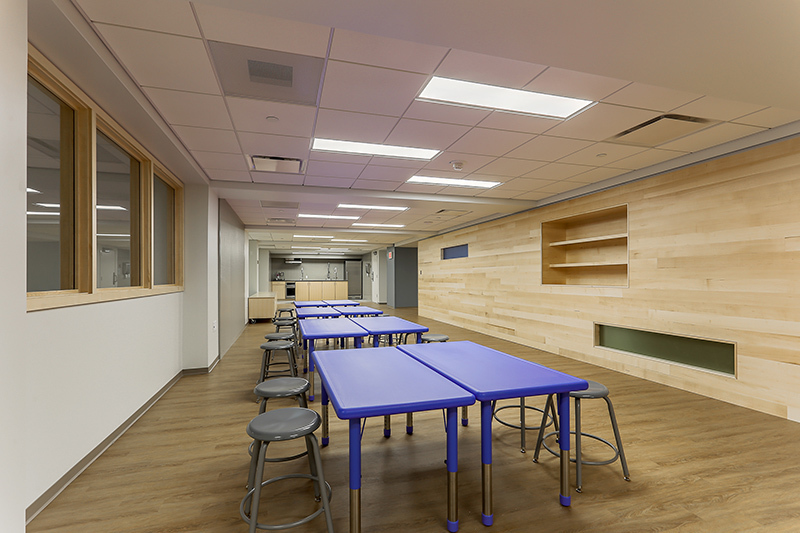 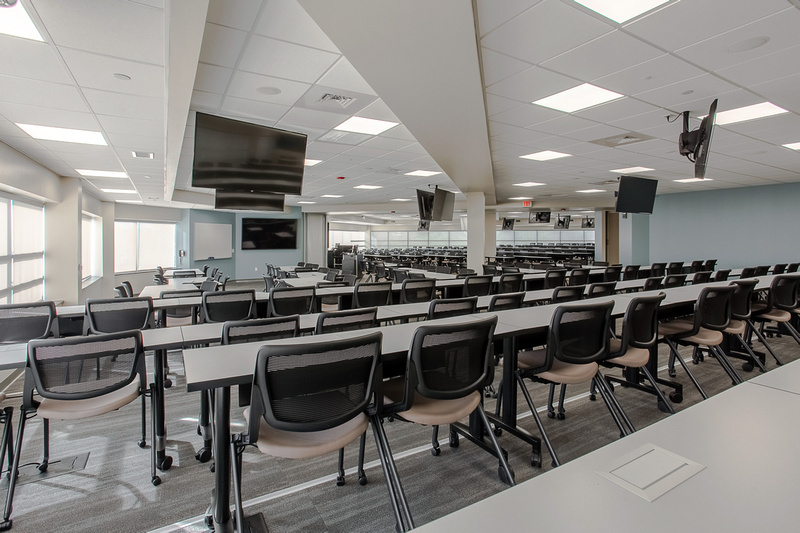 Work included tiered seating levels, all new finishes as well as operable partitions, HVAC system and Lighting System. 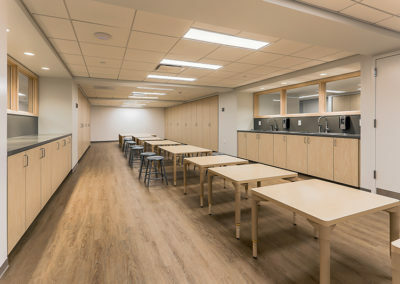 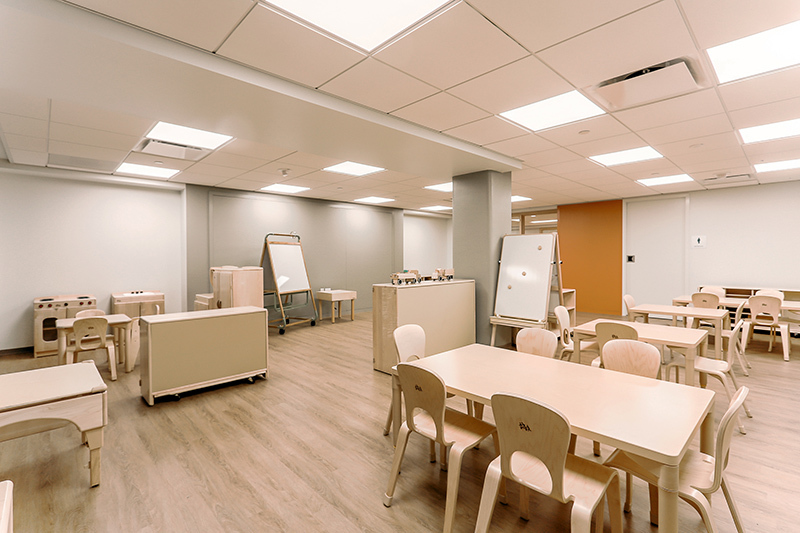 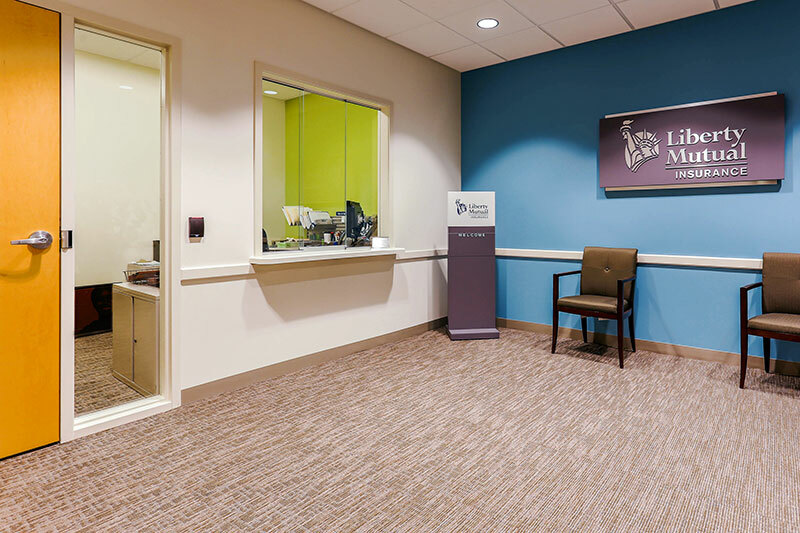 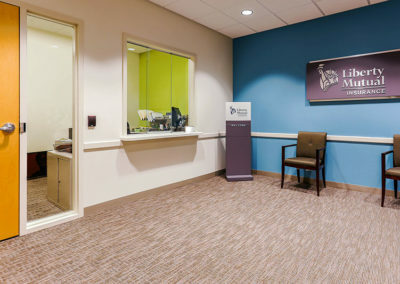 Renovation of 11,000sf of 1st generation space to include Common Area Lobby with new Restrooms, a Neighborhood Community Room, Exam Rooms, andConsult and Collaborative areas for staff. 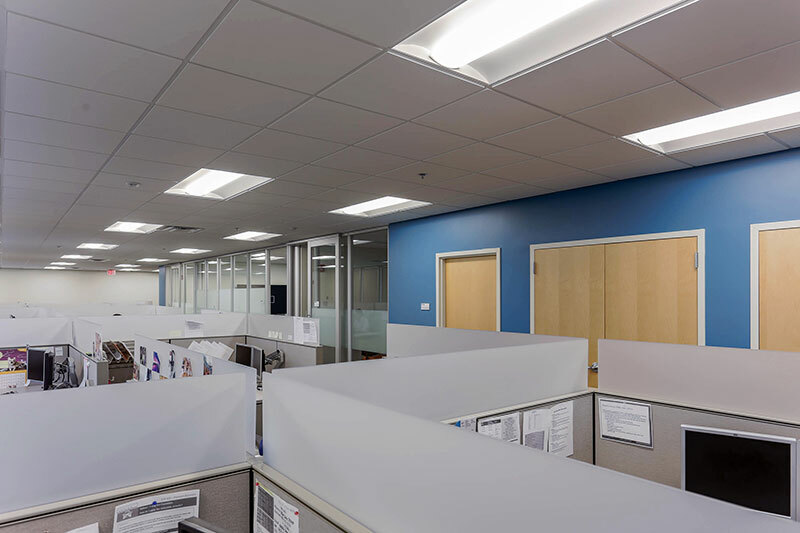 Patriot was involved from the initial architectural design phase to determine feasibility of construction along with their associated costs. 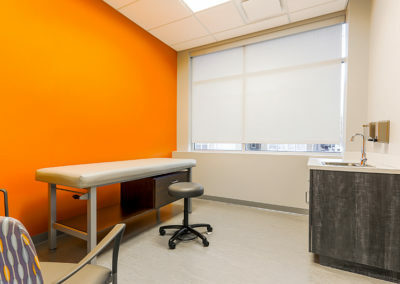 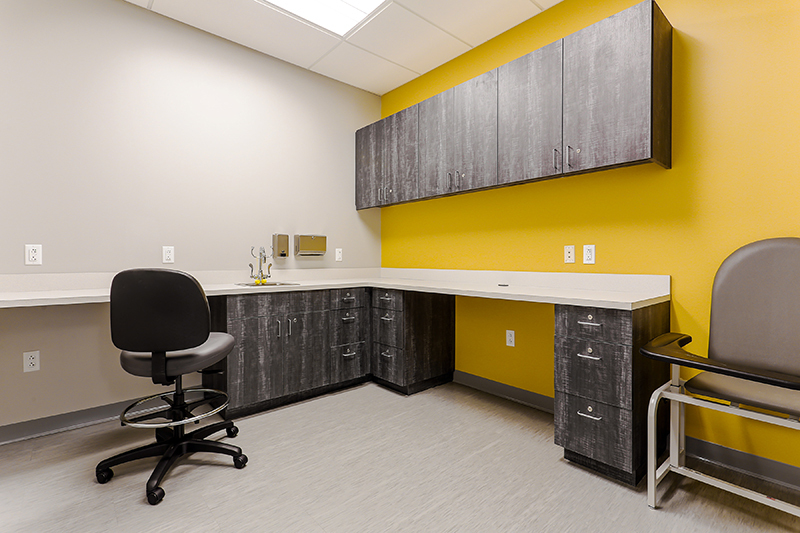 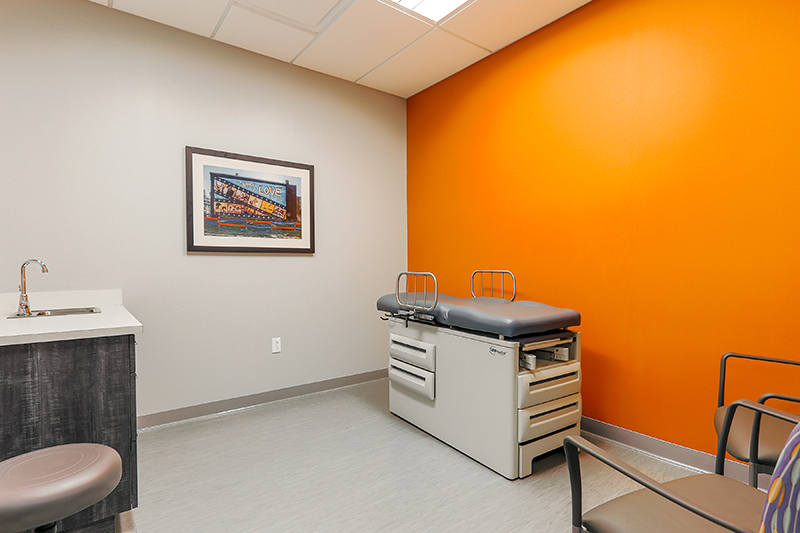 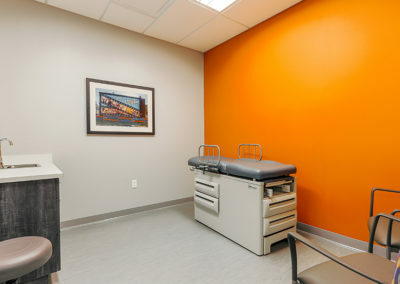 This is the 4th location that Patriot has completed for City Life Clinics. 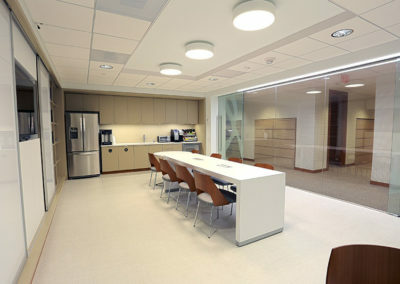 This project consisted of 3 phases within an occupied building. 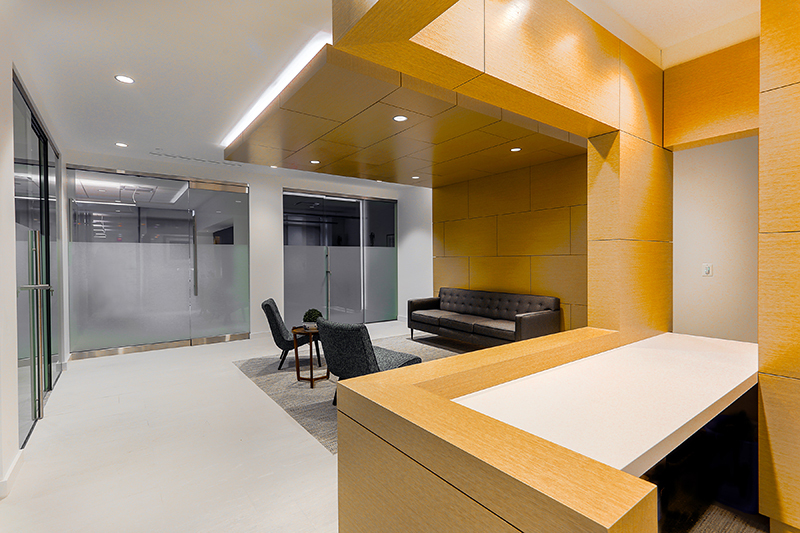 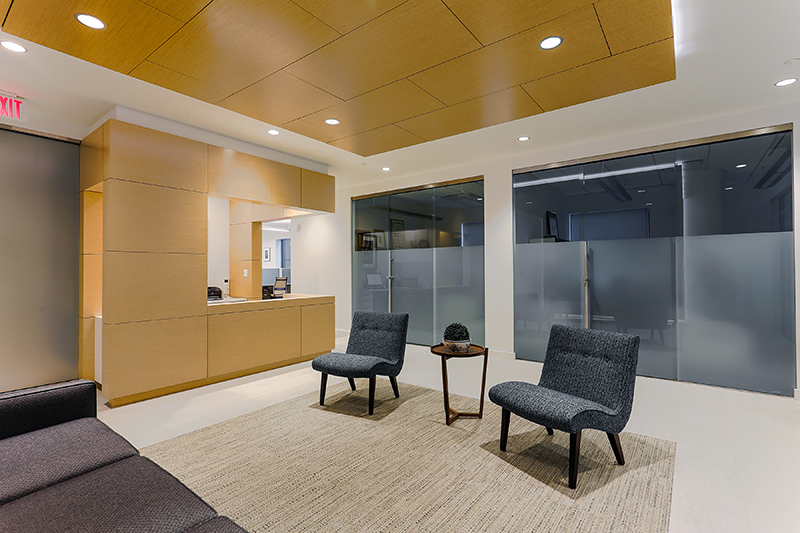 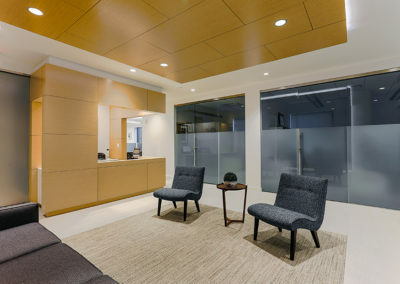 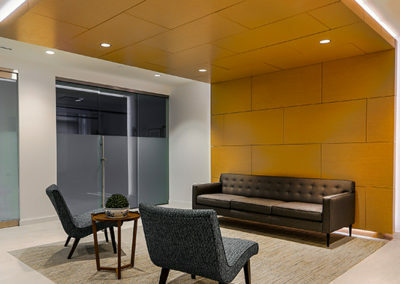 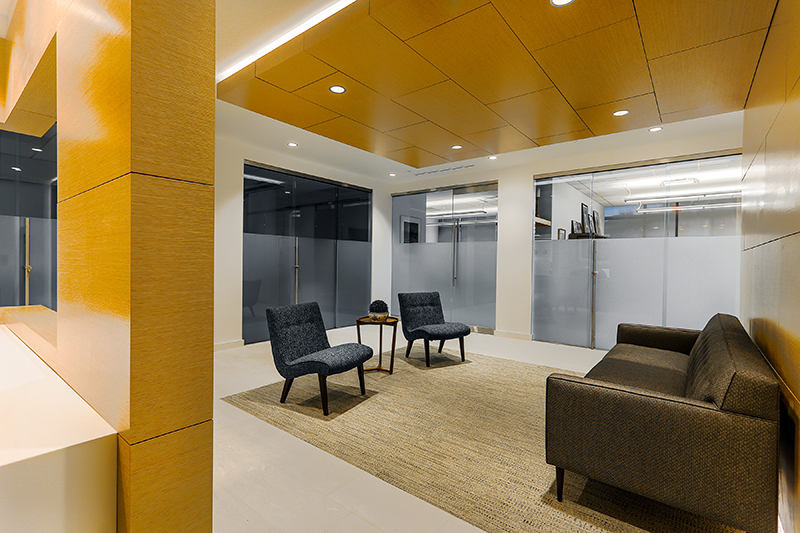 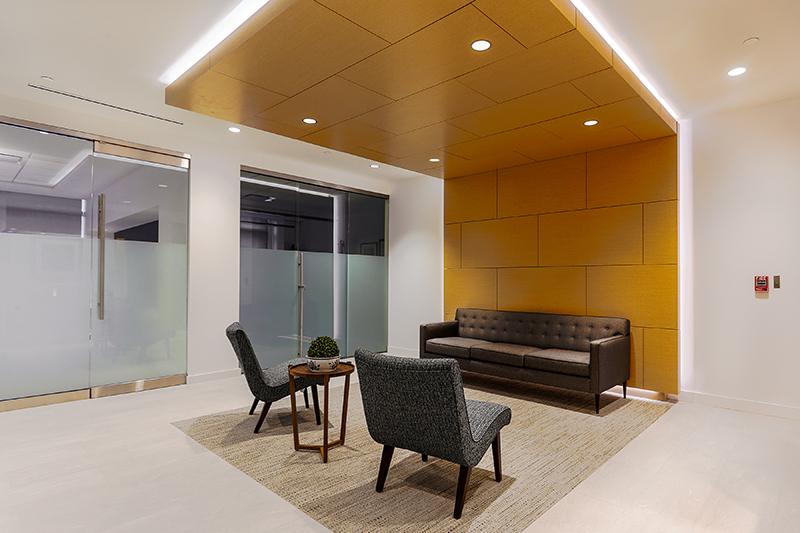 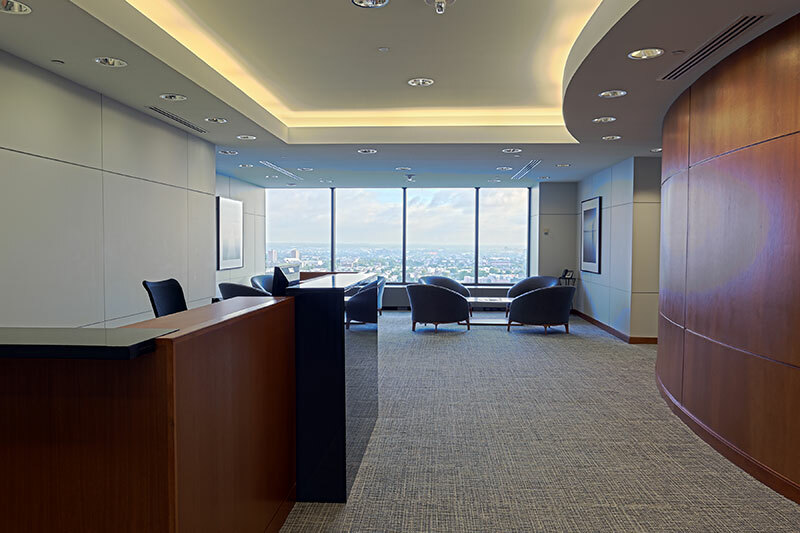 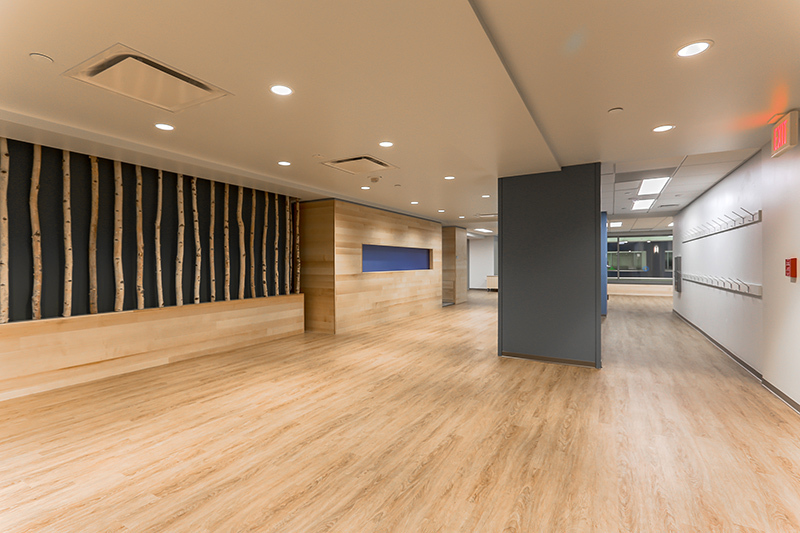 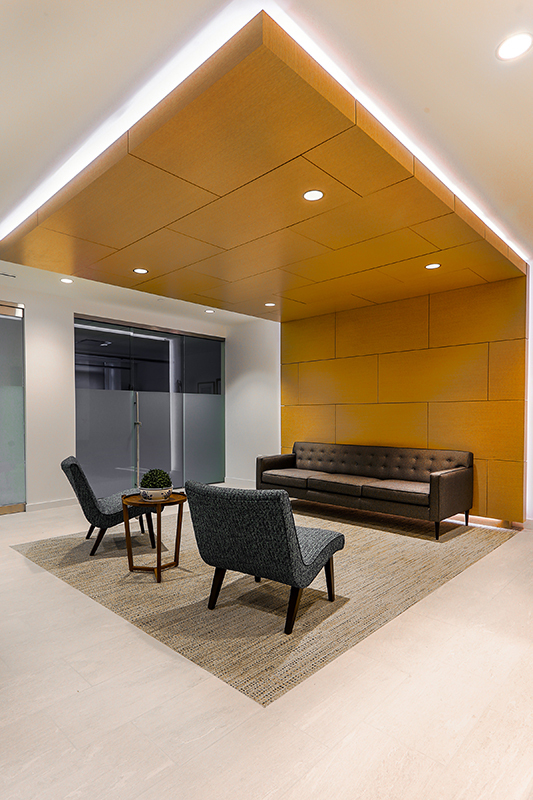 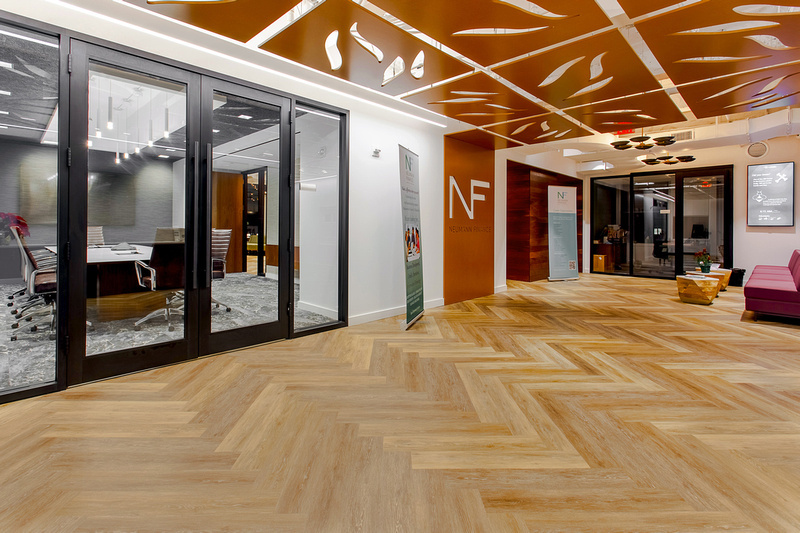 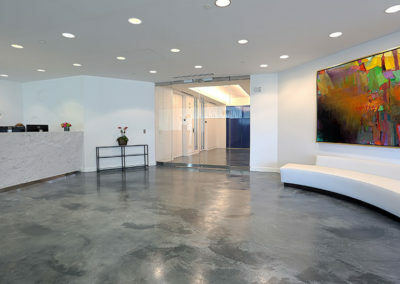 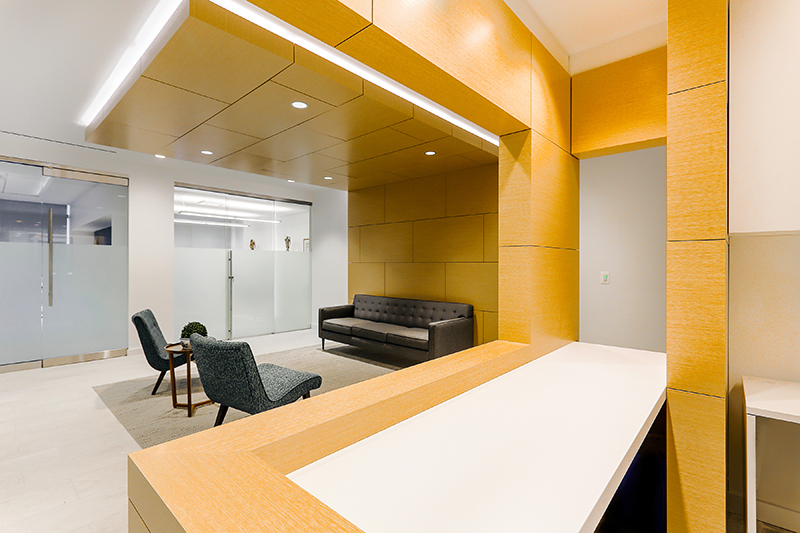 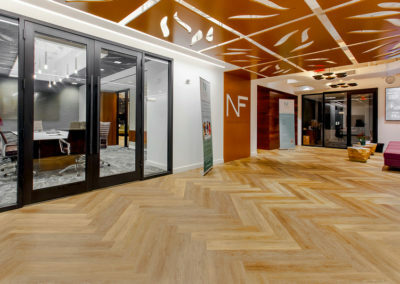 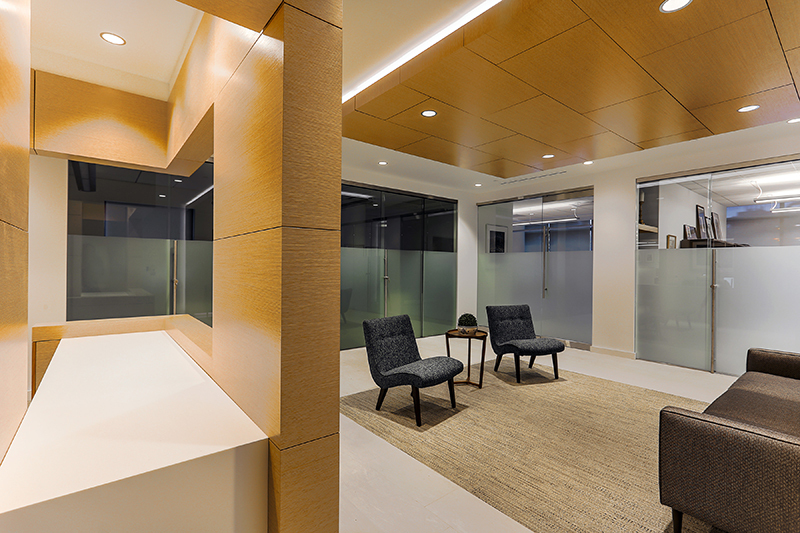 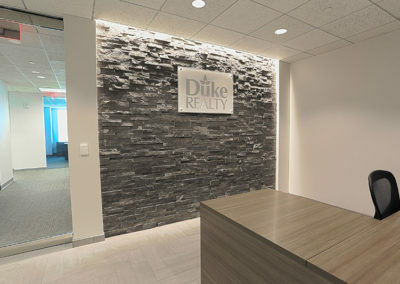 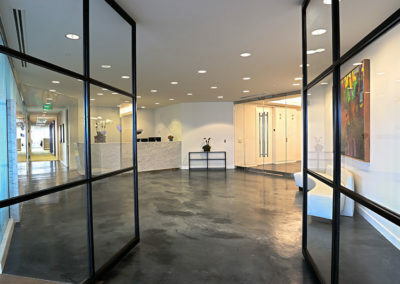 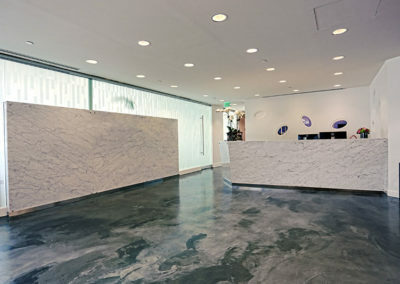 Work included new Lobby Finishes, Conference Rooms, Café, Mailroom, Private Offices and Open Space. 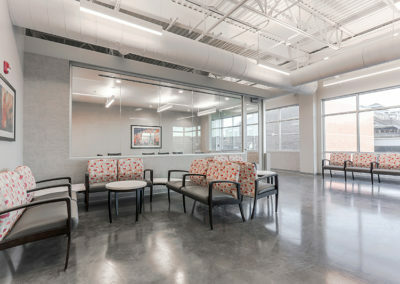 We are proud to have been part of this exciting project. 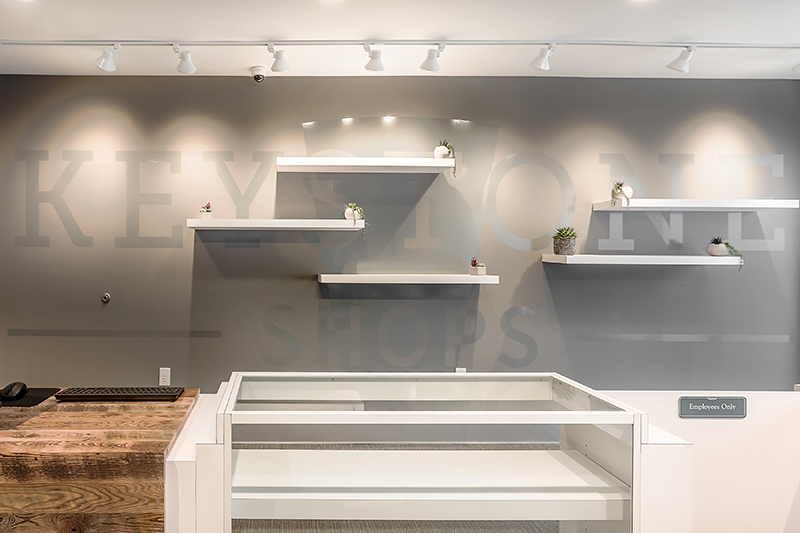 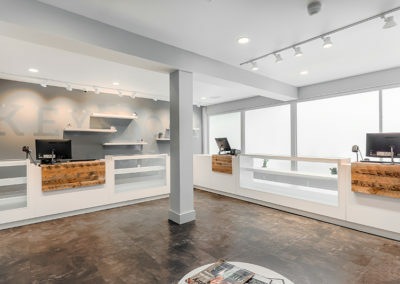 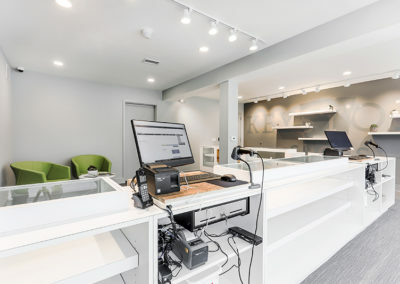 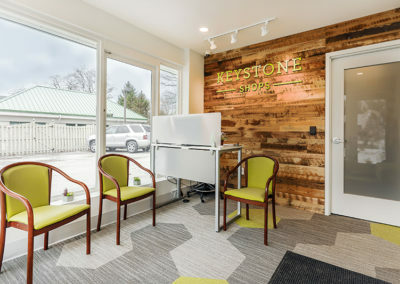 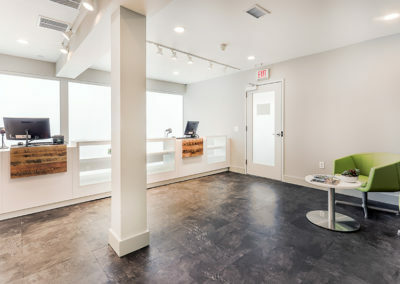 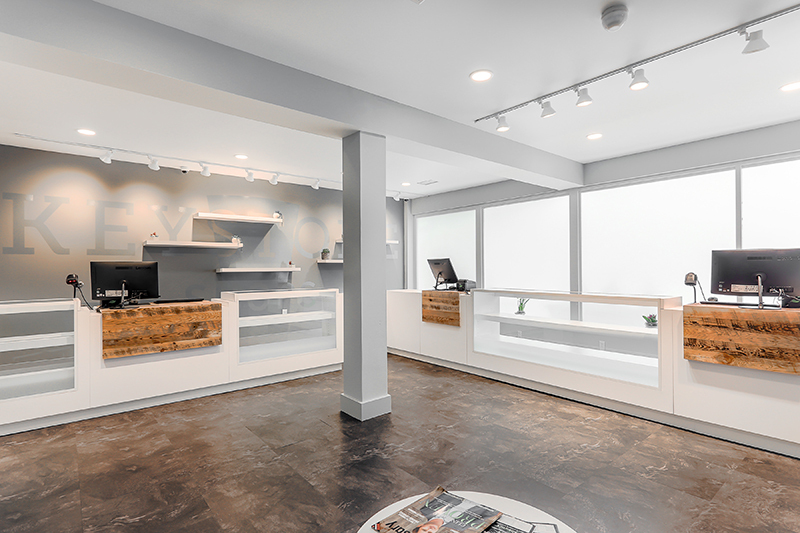 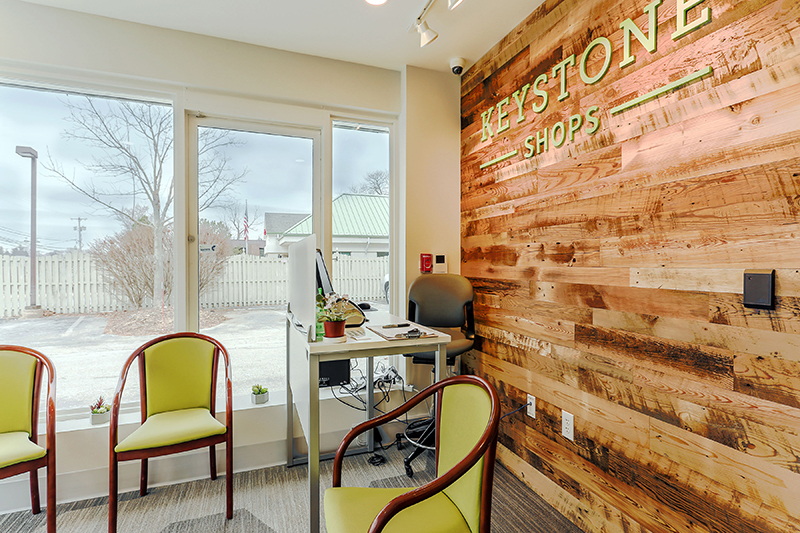 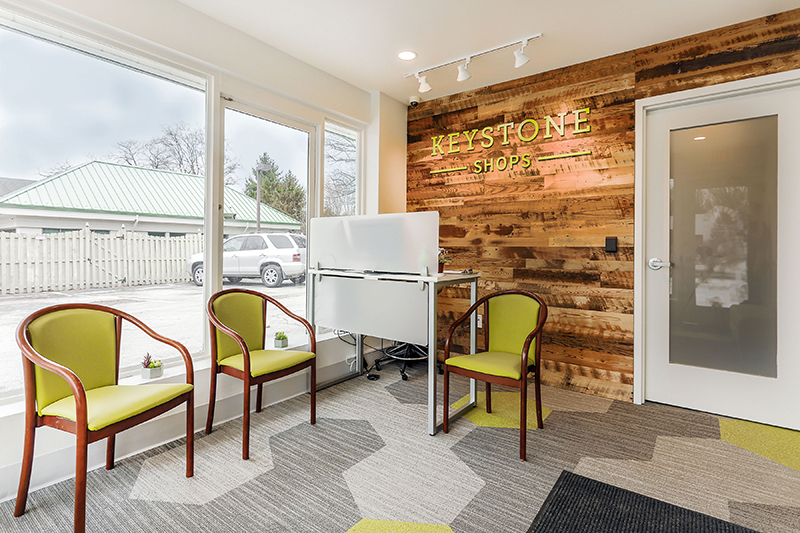 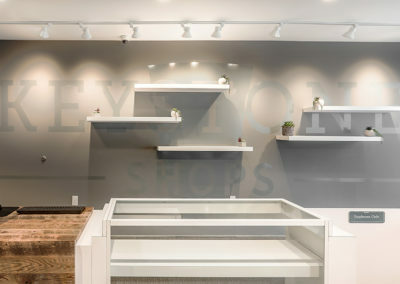 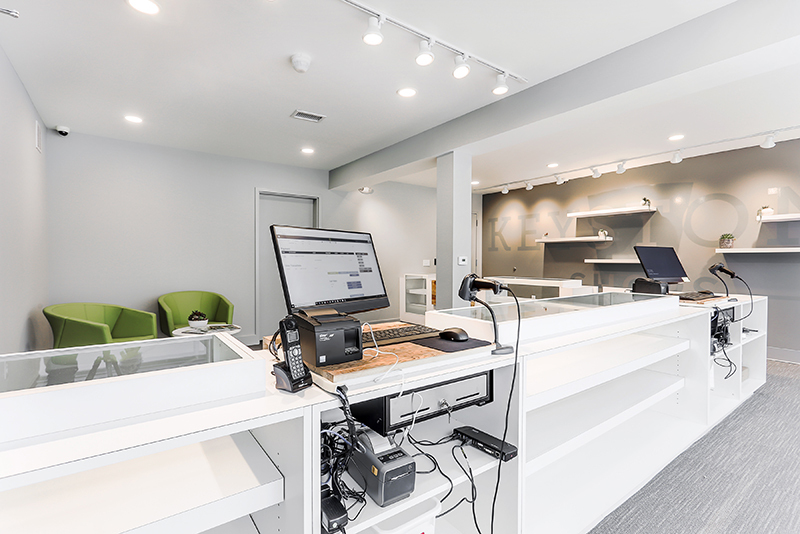 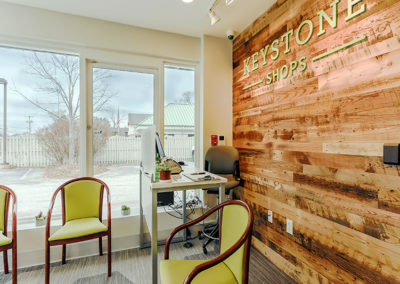 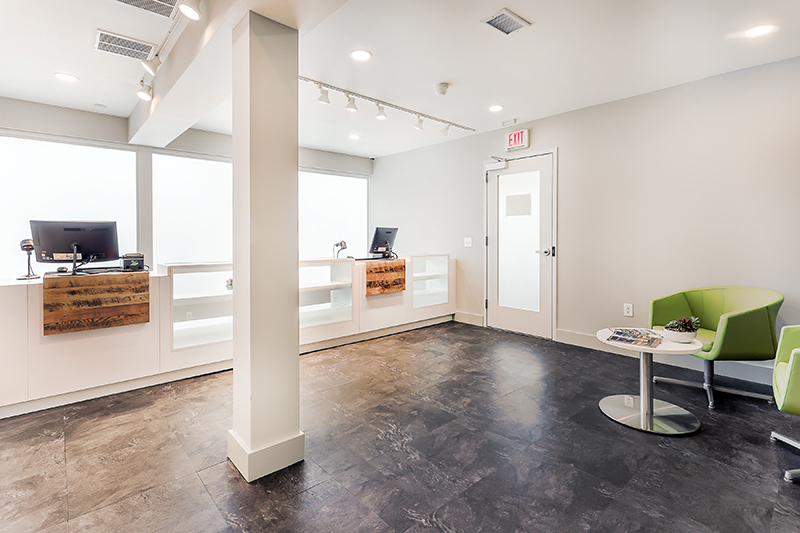 Keystone Shops in Devon was one of the first medical marijuana dispensaries to open in the Philadelphia area. 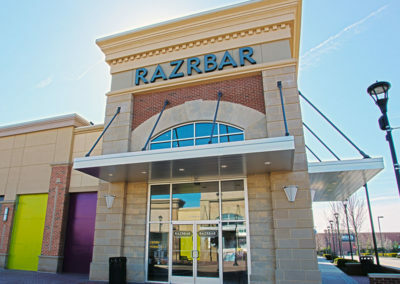 This location was an old Dairy Queen, and had many challenges such as structural work and CMU reinforcement. 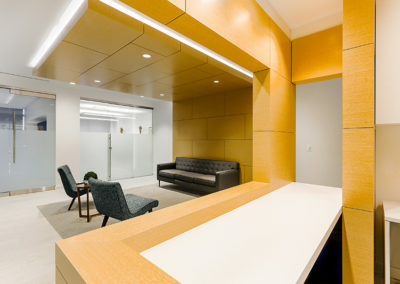 We provided creative ways to save money while still keeping the original design intent. 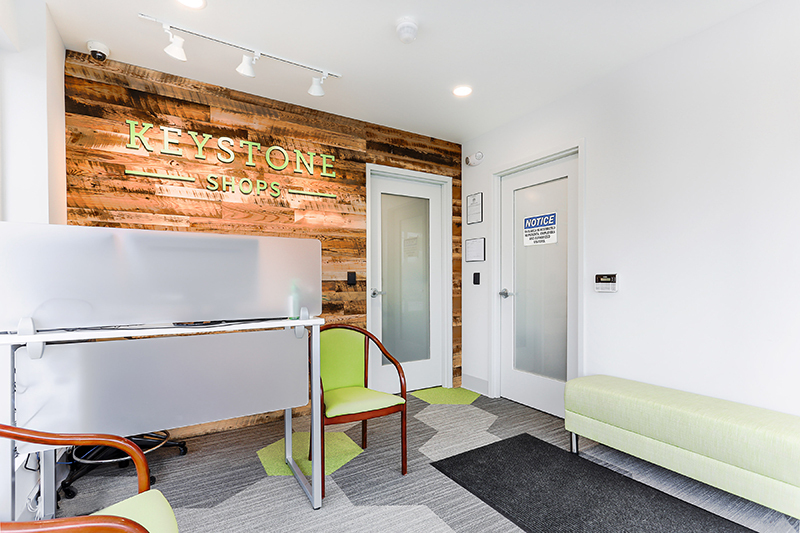 Thank you to Keystone Shops for choosing us to be your GC for this project. 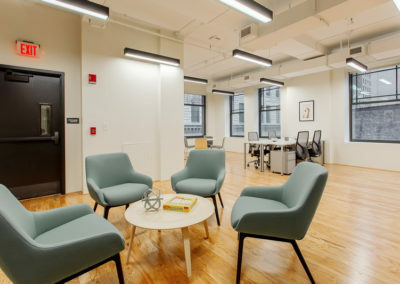 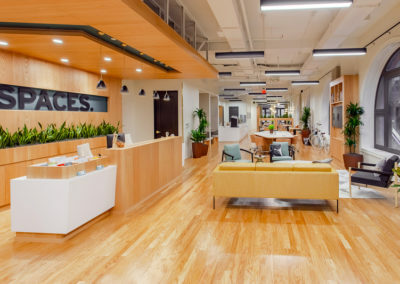 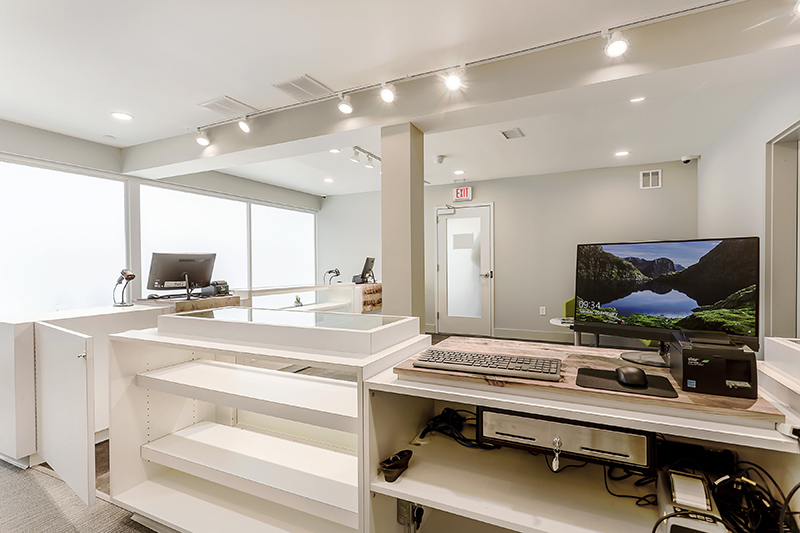 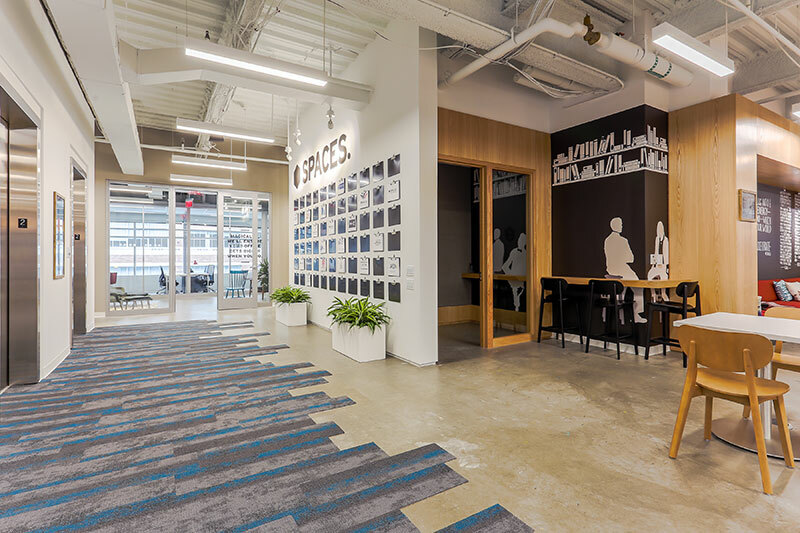 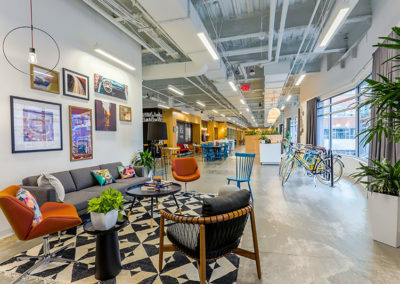 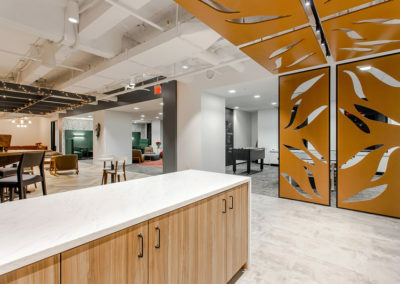 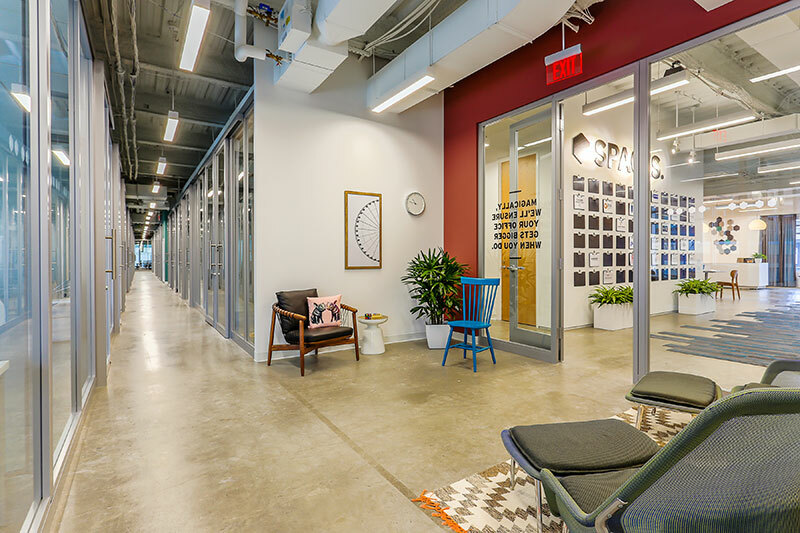 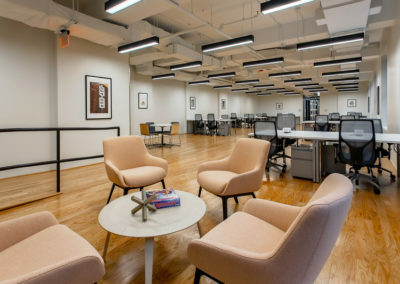 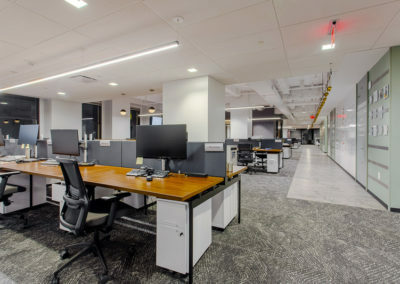 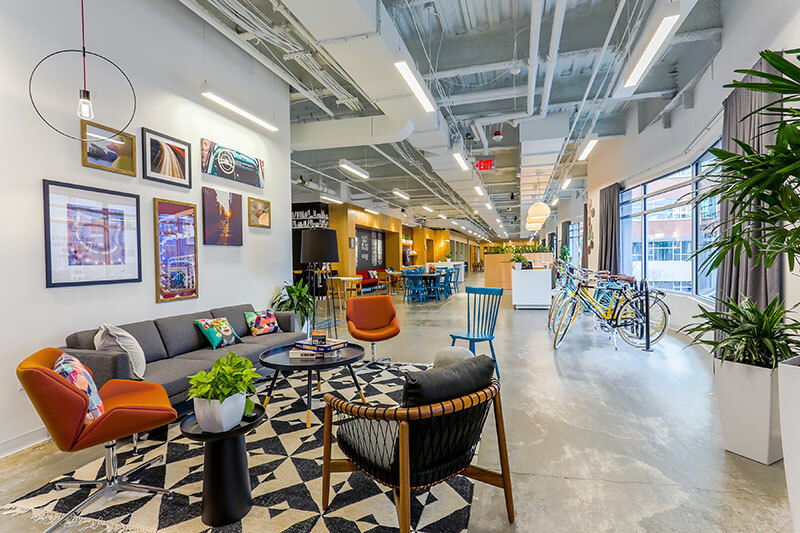 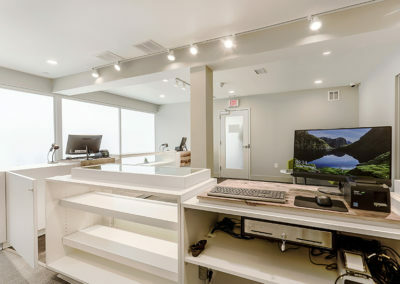 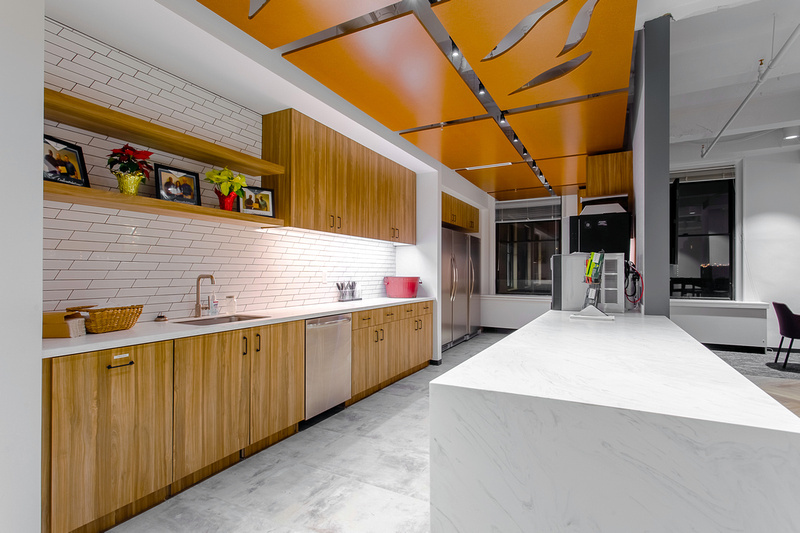 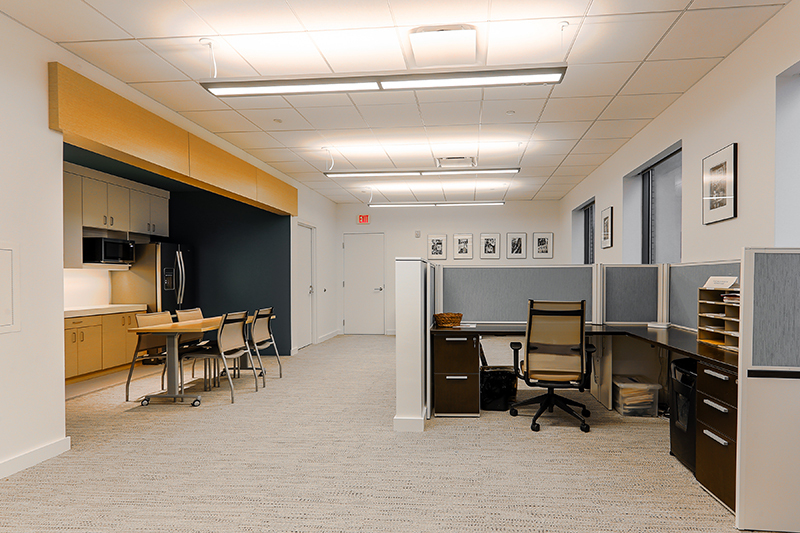 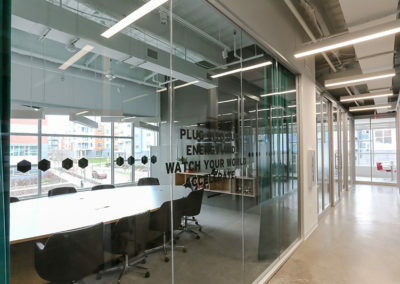 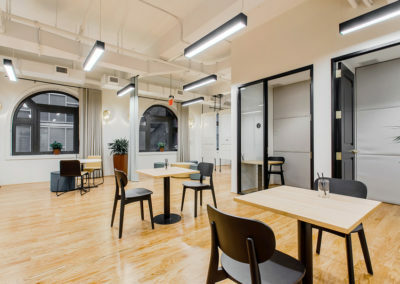 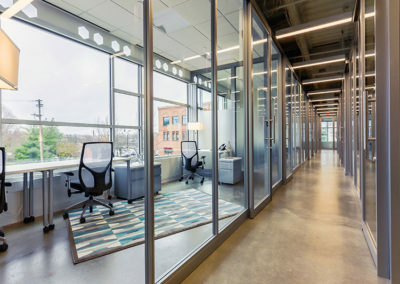 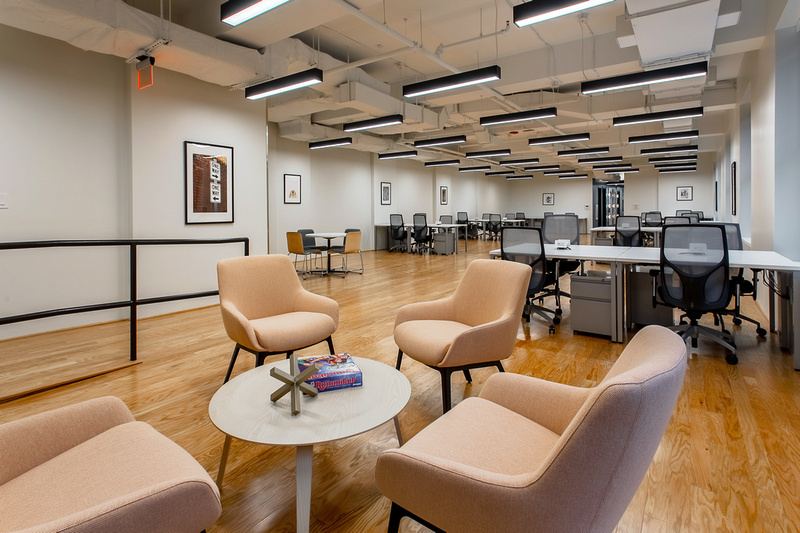 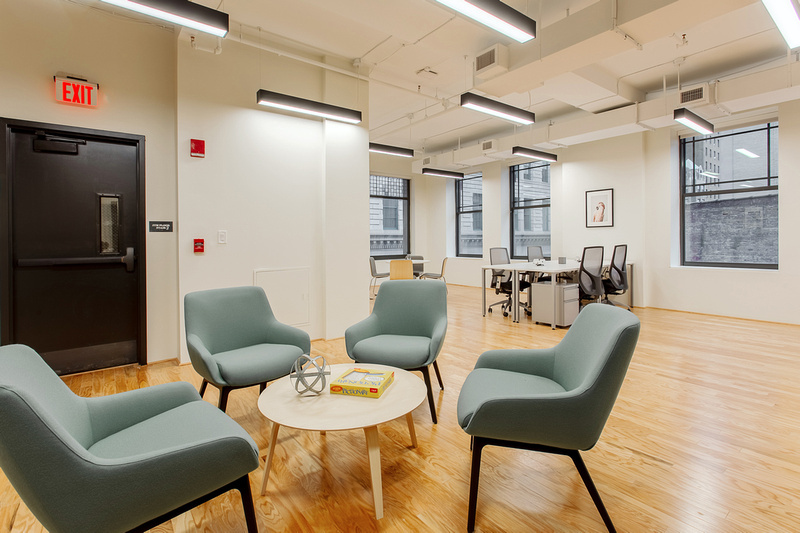 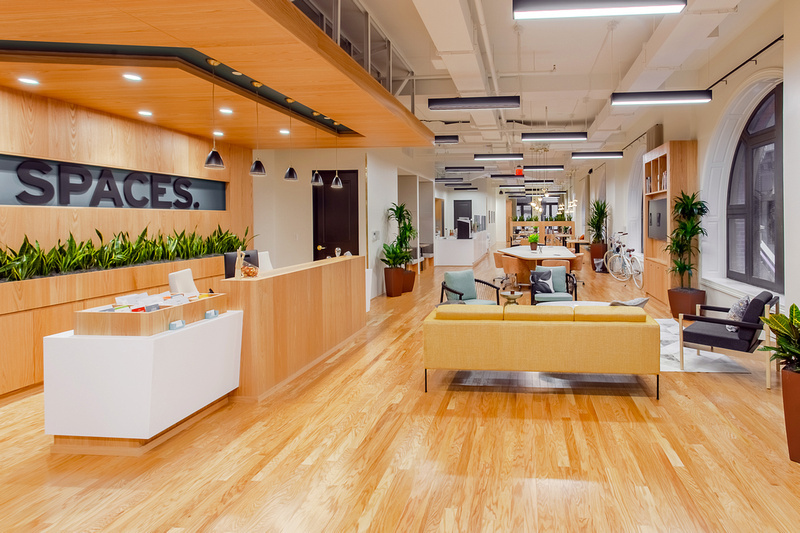 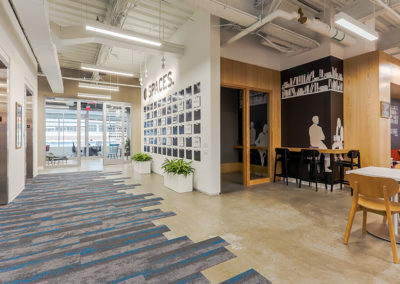 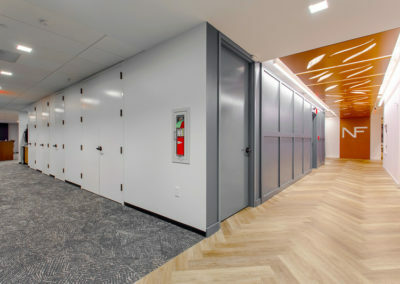 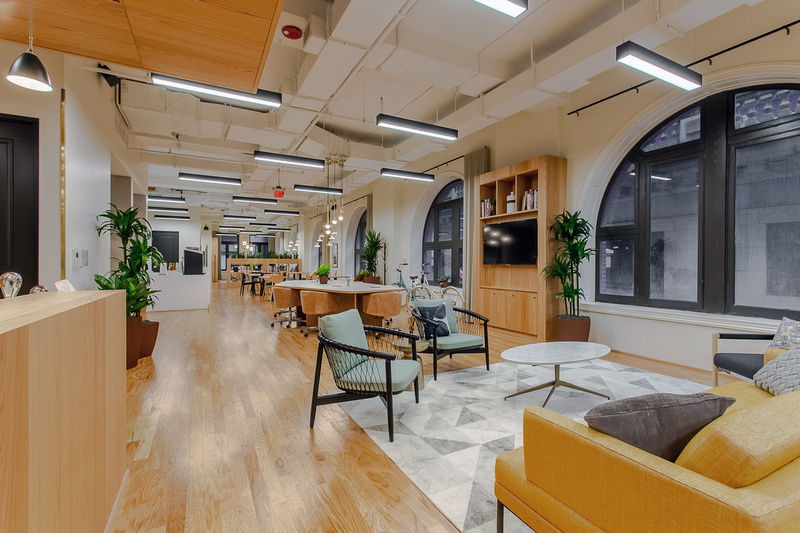 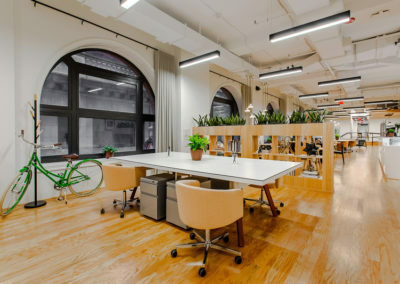 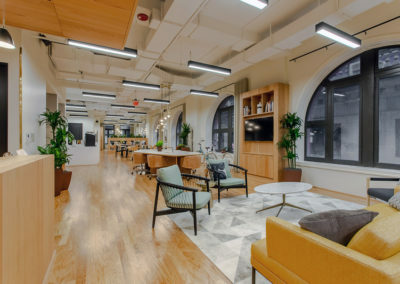 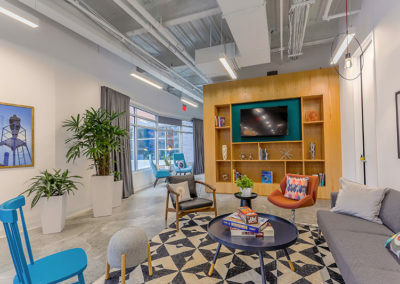 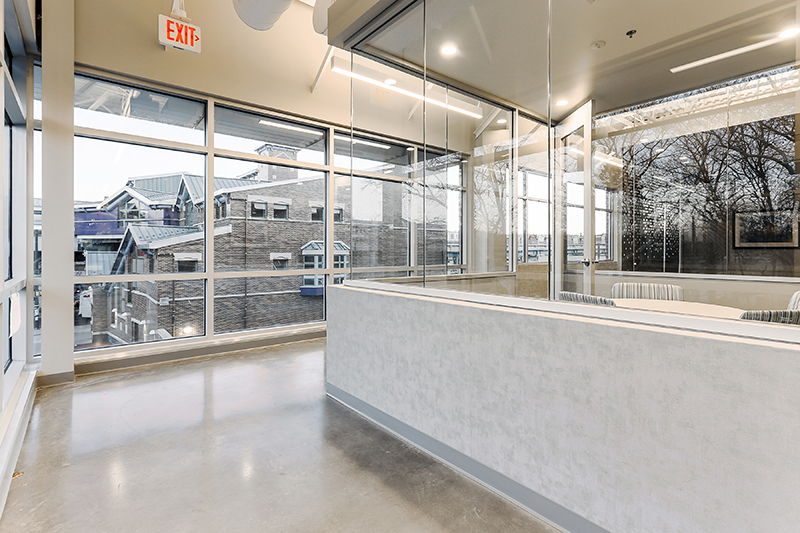 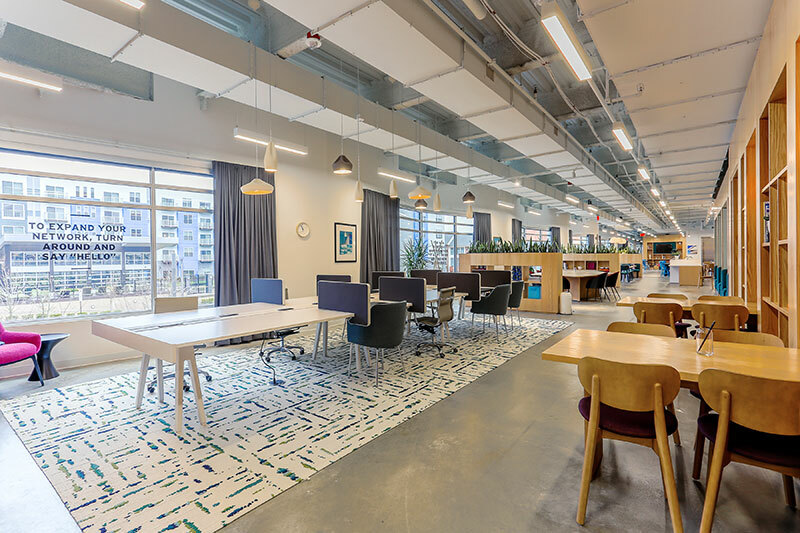 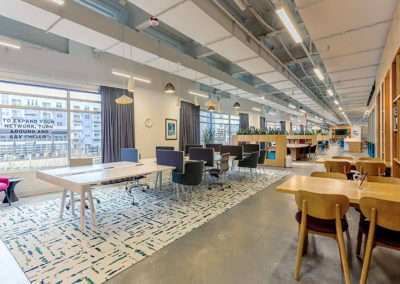 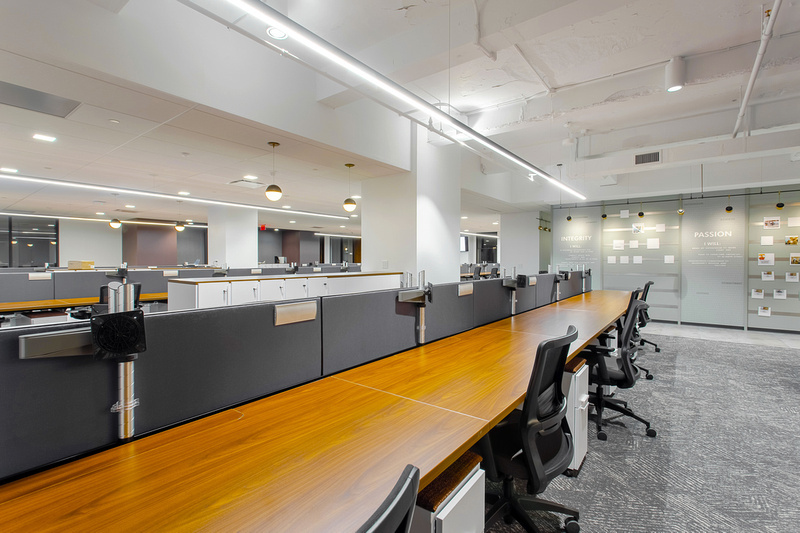 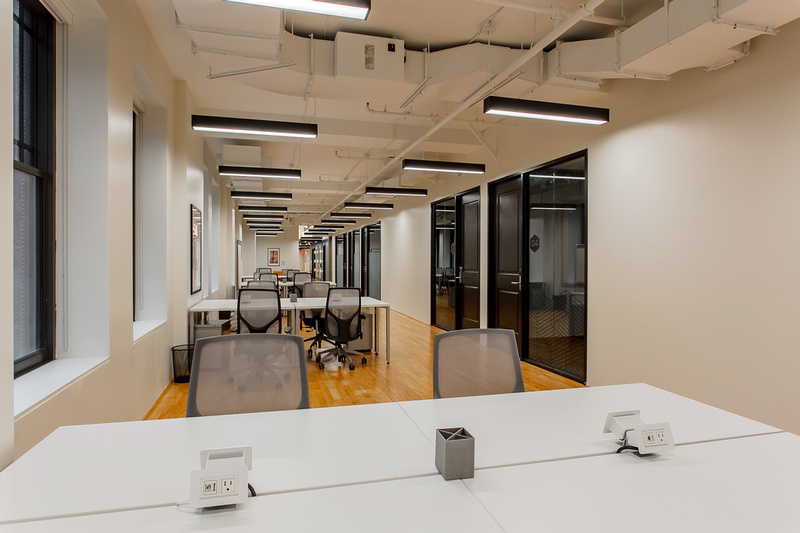 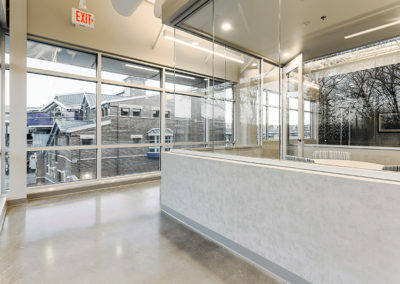 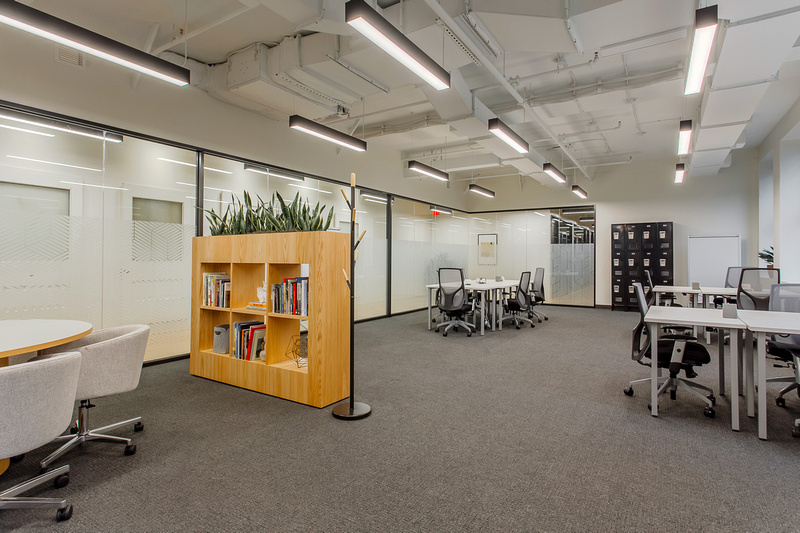 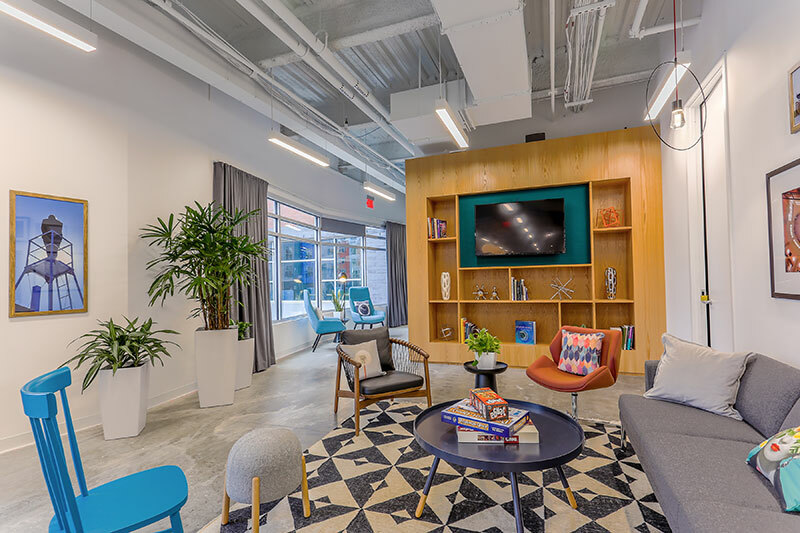 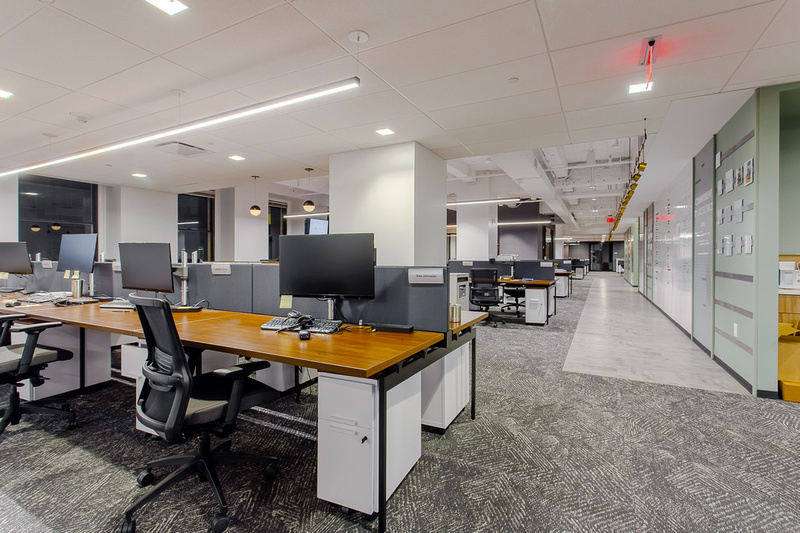 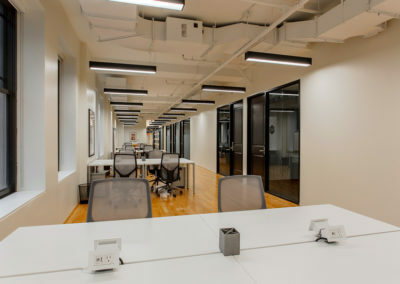 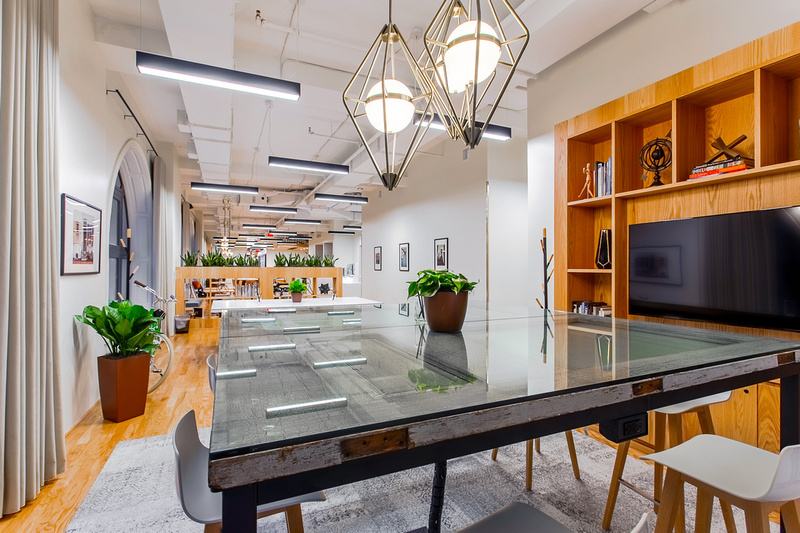 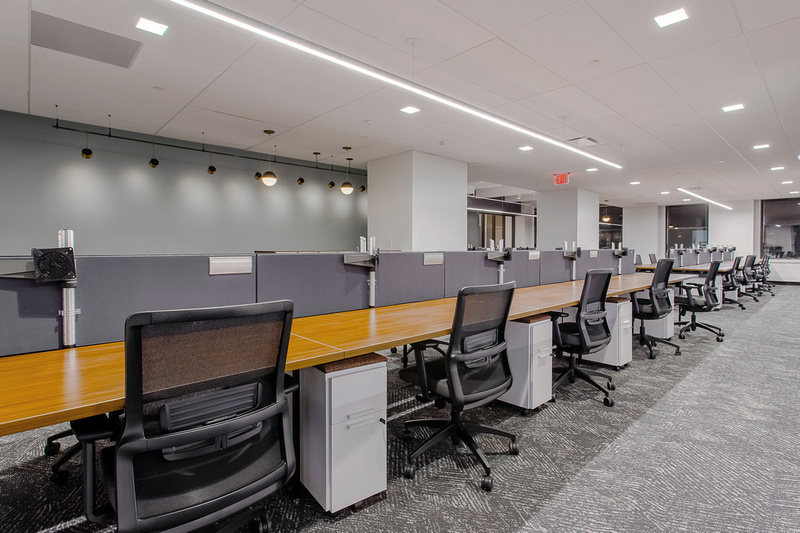 Renovation of 4,000sf of 1st generation space to include high-end custom millwork, frameless glass sliding doors, office fronts and Lighting Control System with LED lighting. 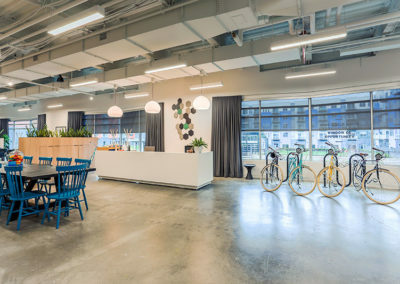 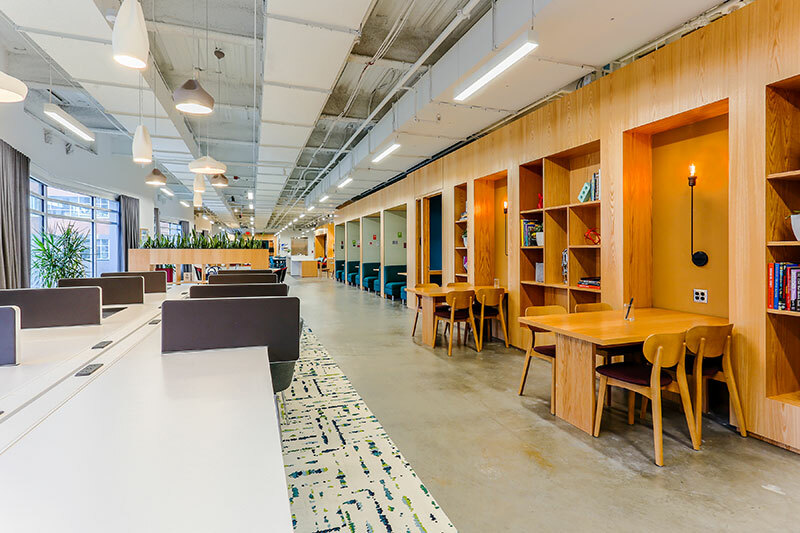 Interior fitout of approximately 38,000sf consisting of polished concrete floors with exposed overhead ceilings, ductwork and lighting. 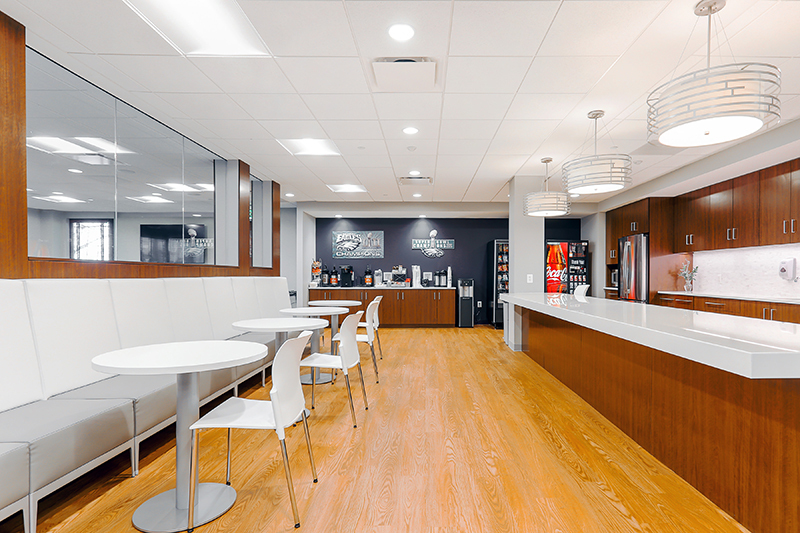 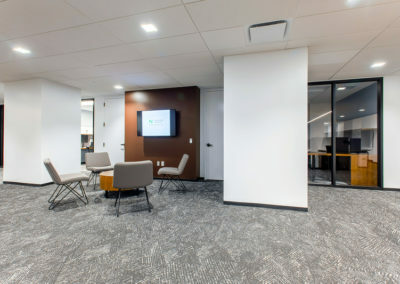 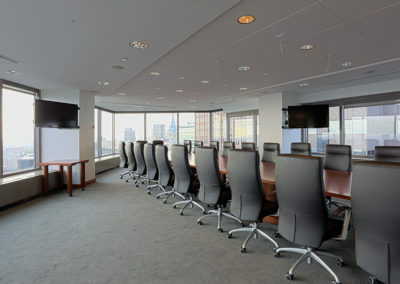 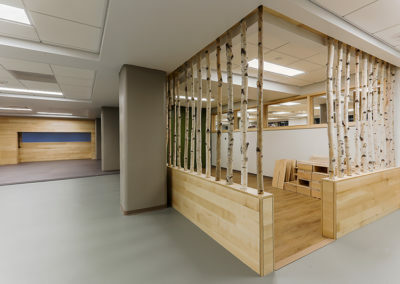 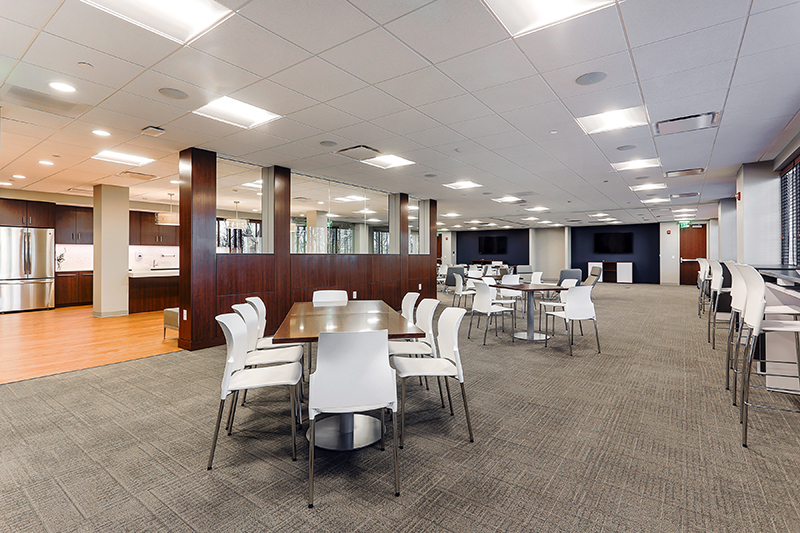 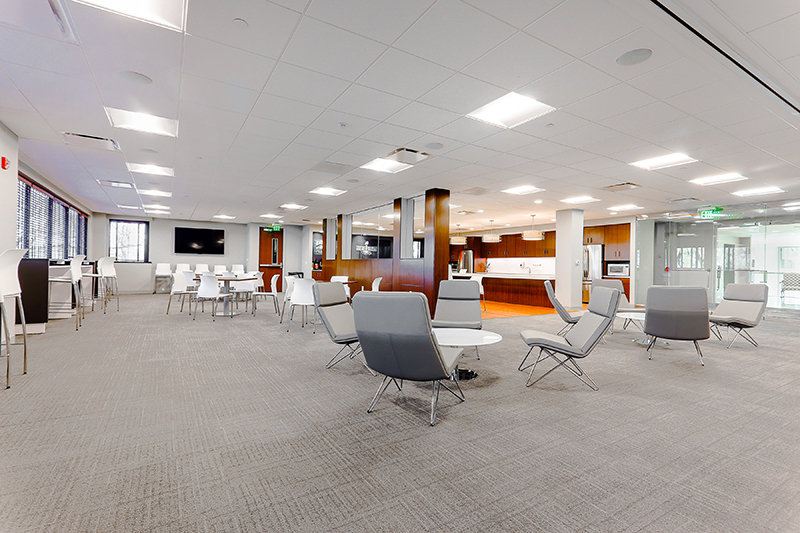 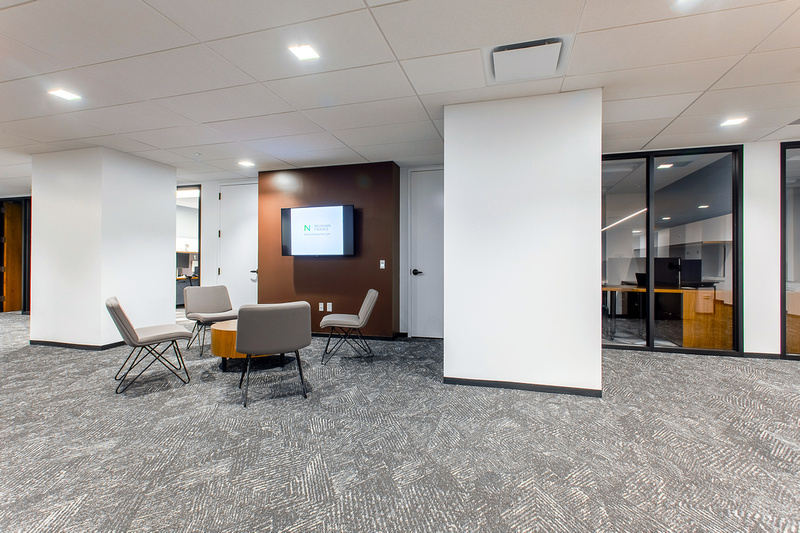 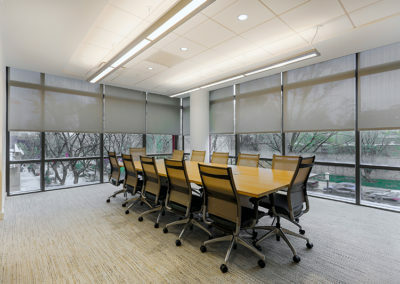 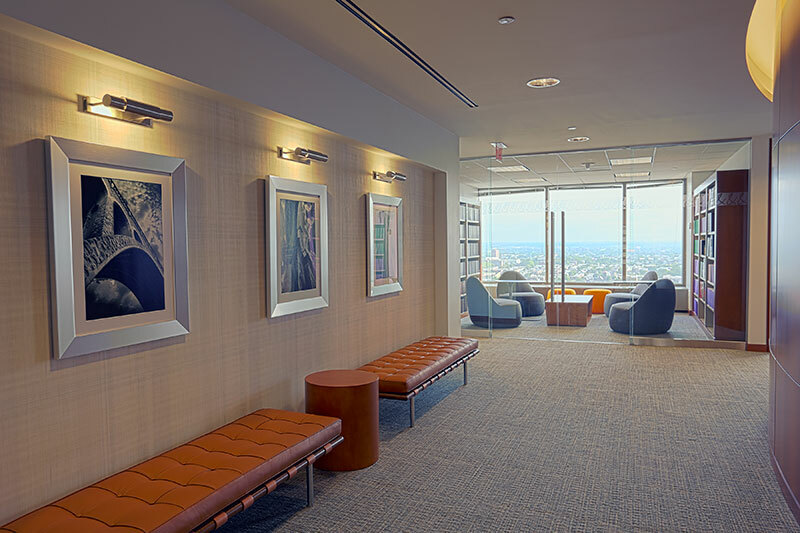 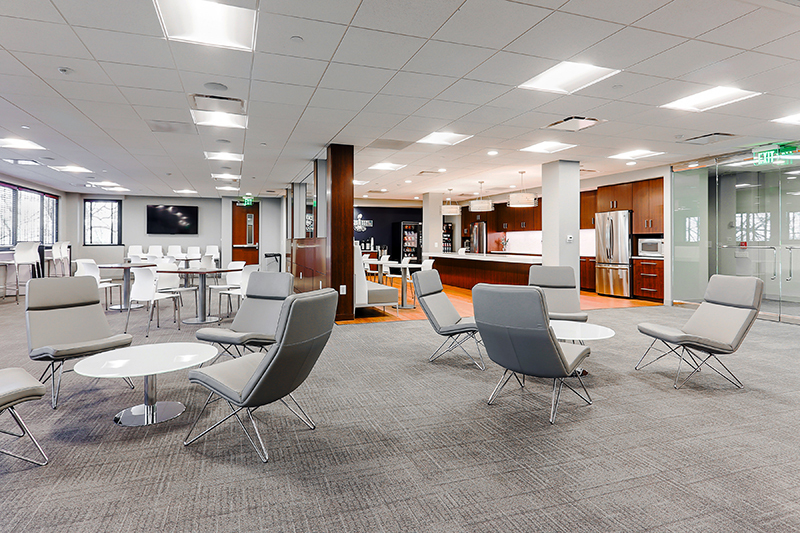 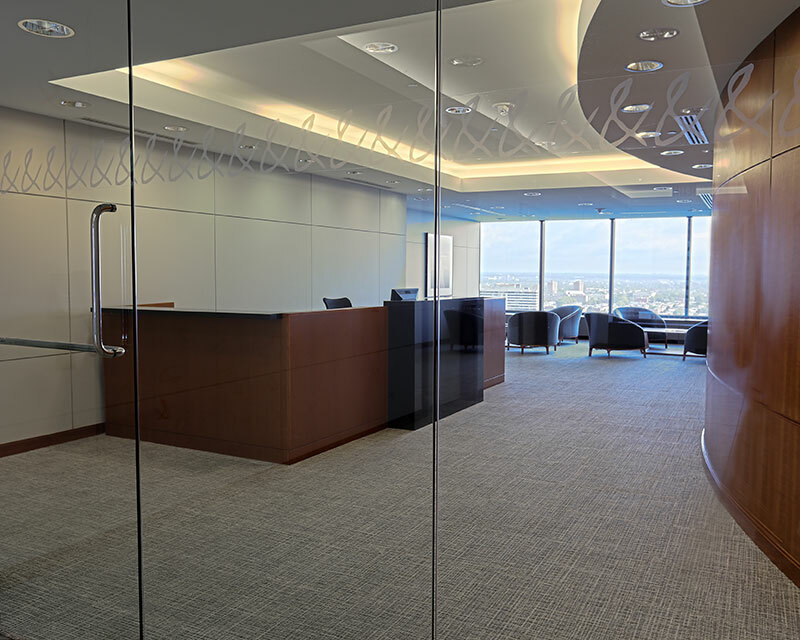 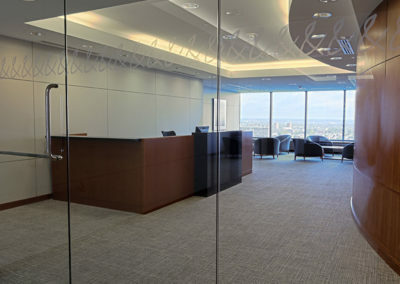 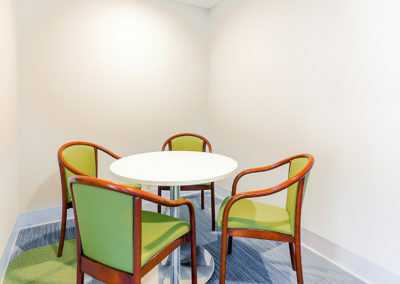 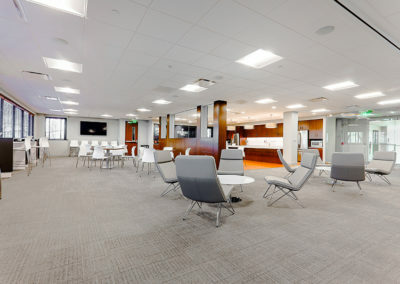 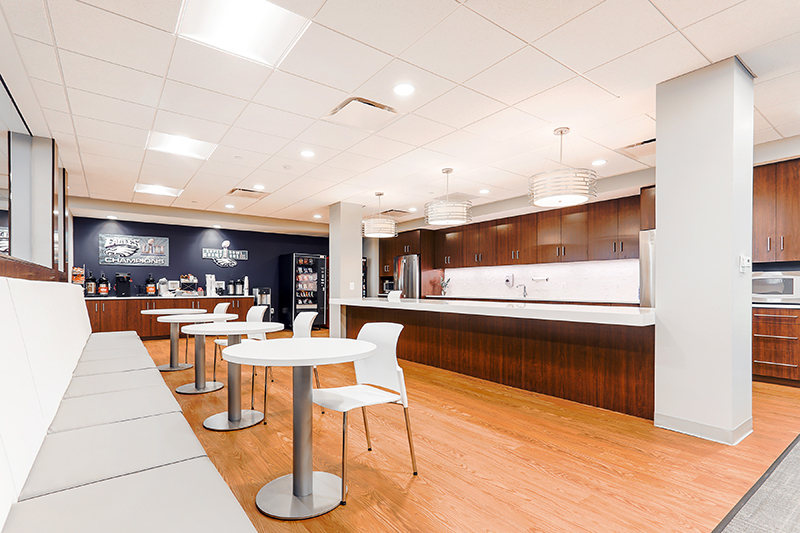 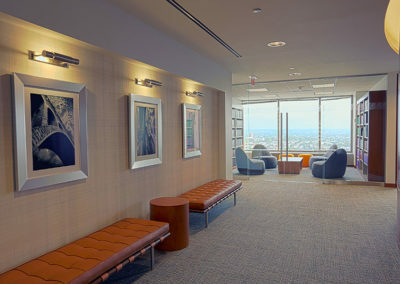 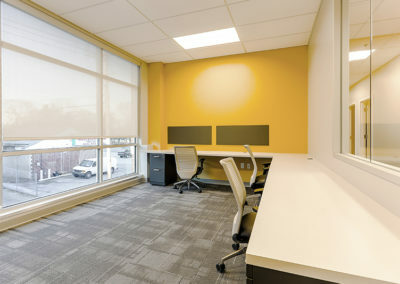 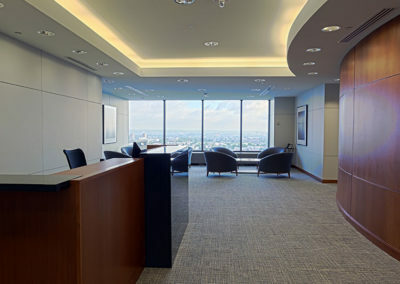 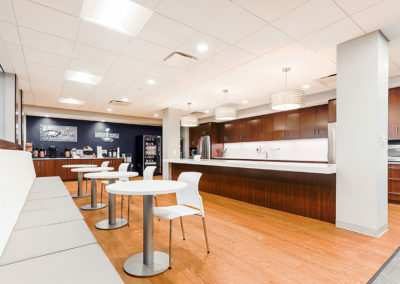 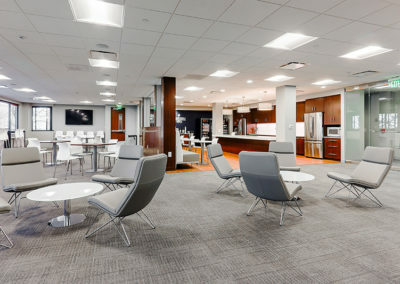 This project was one of 18 locations completed for Regus. 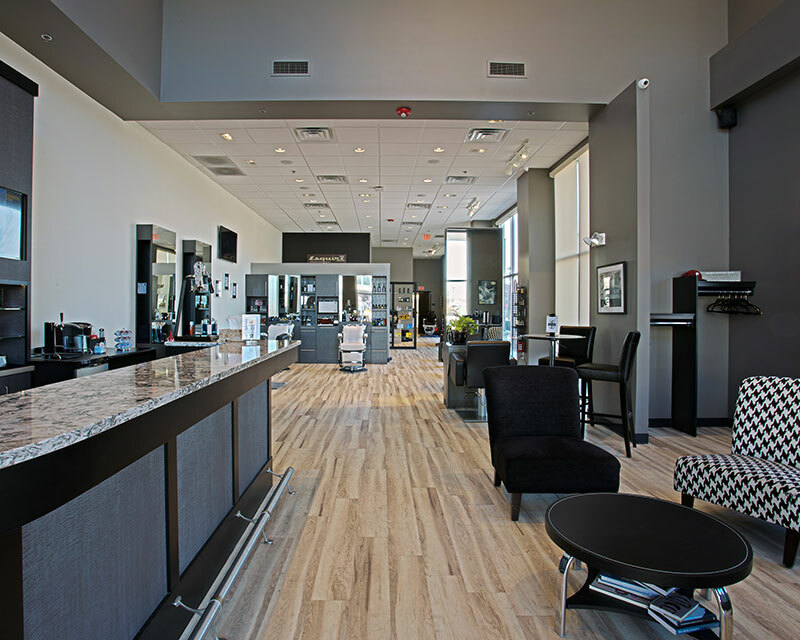 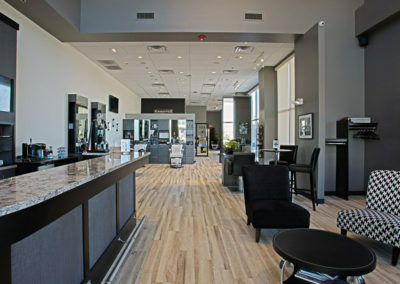 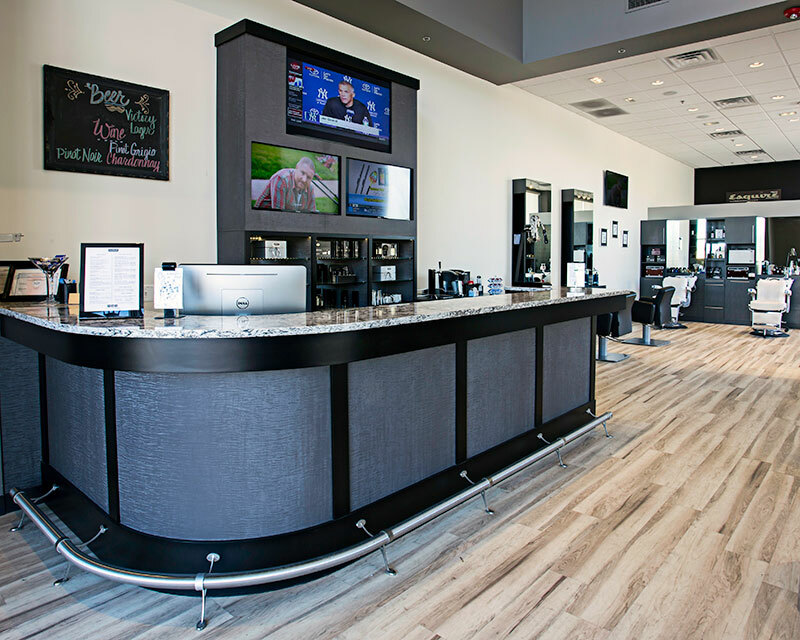 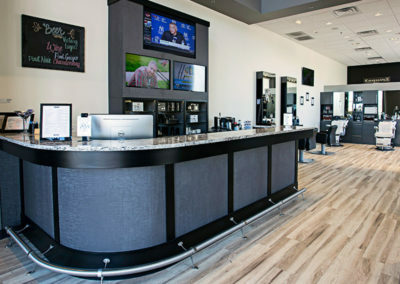 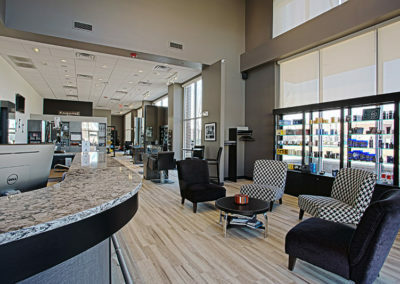 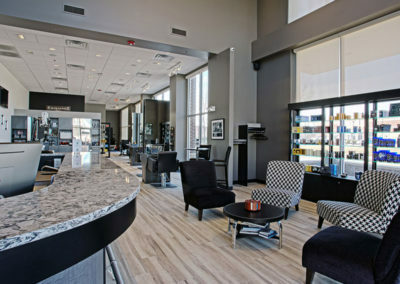 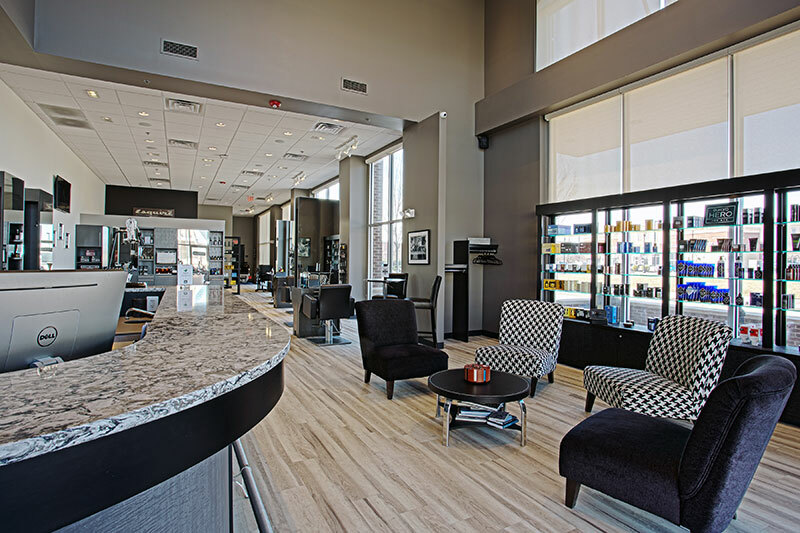 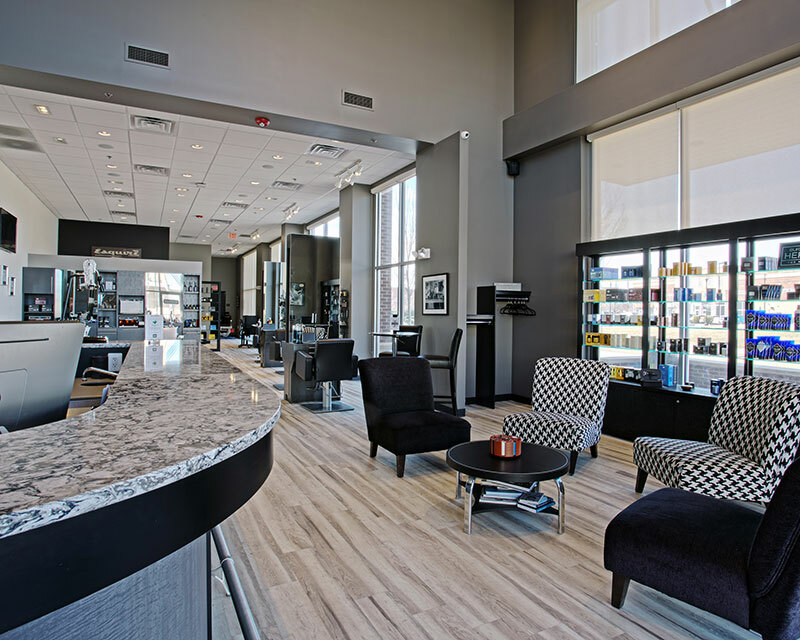 This fine grooming establishment consisted of a custom lounge area with a full service bar along with barber stations and massage rooms. 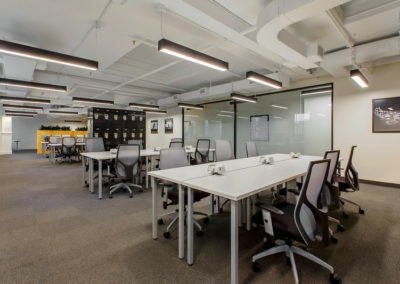 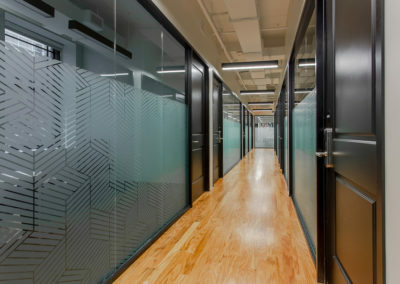 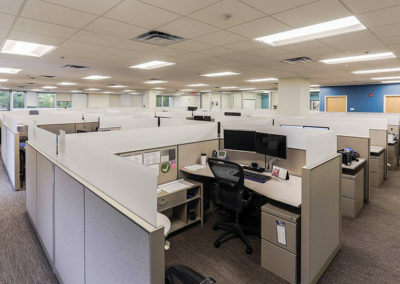 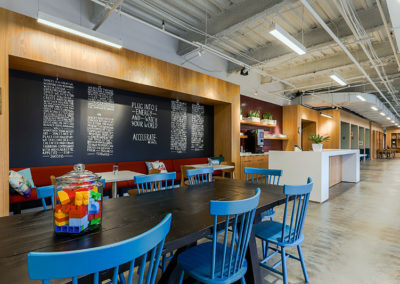 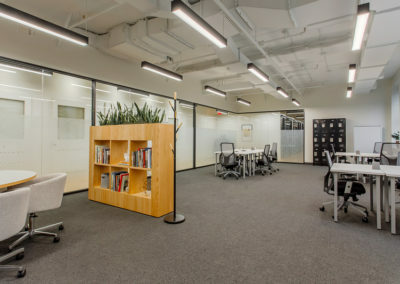 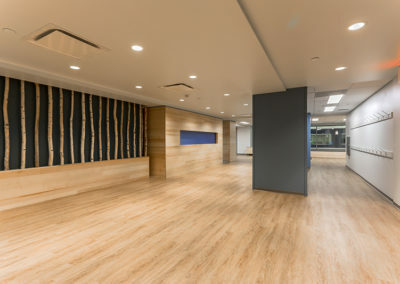 Interior fitout of approximately 6,000sf. 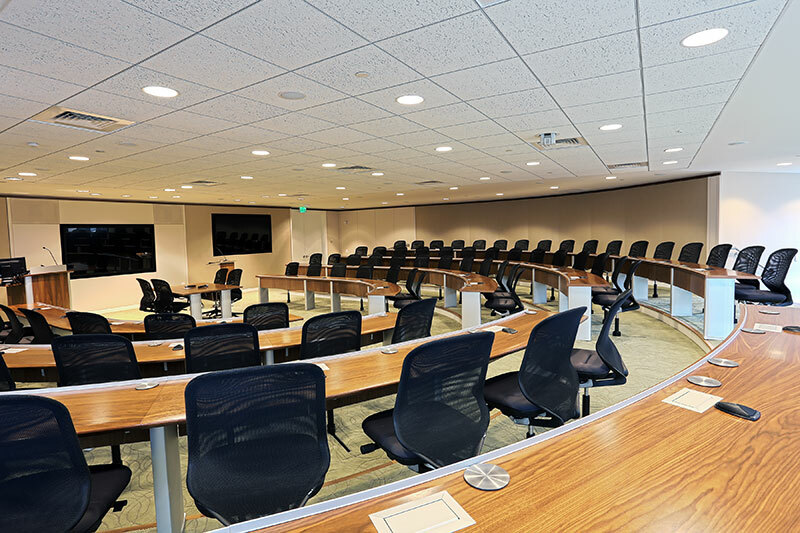 This project involved constructing a new state-of-the-art, four-tiered auditorium with 100-person custom seating. 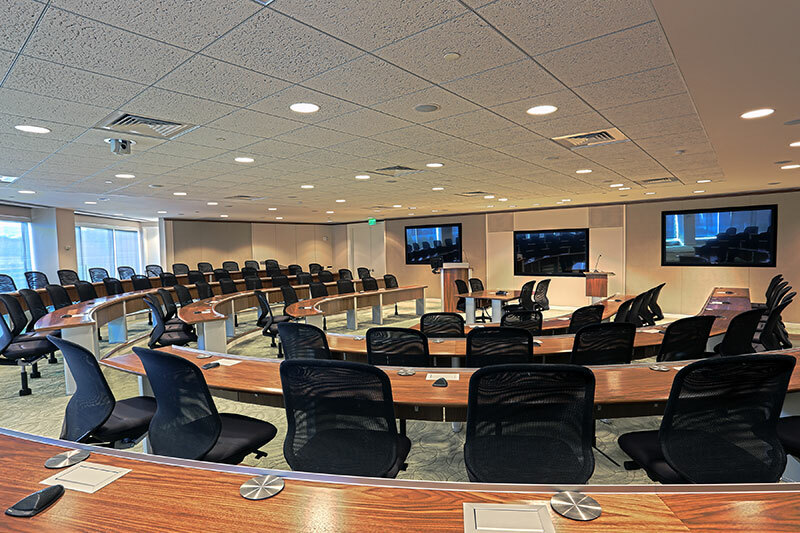 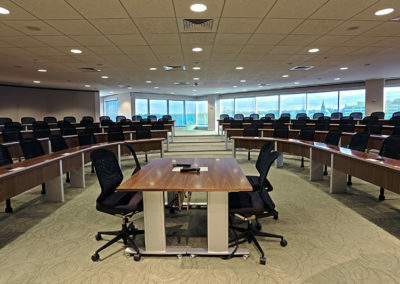 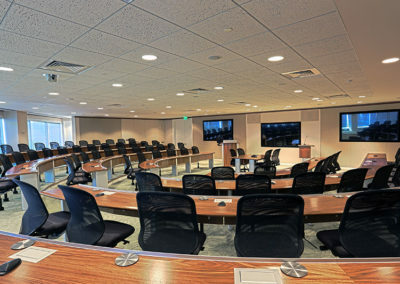 The auditorium included a fully integrated audio visual system with Creston control automation. 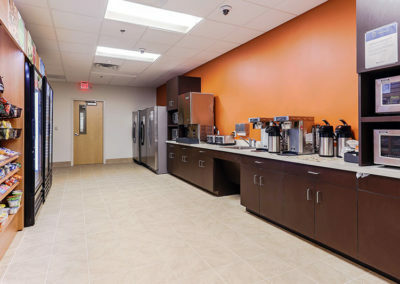 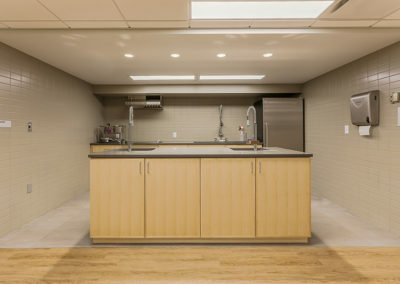 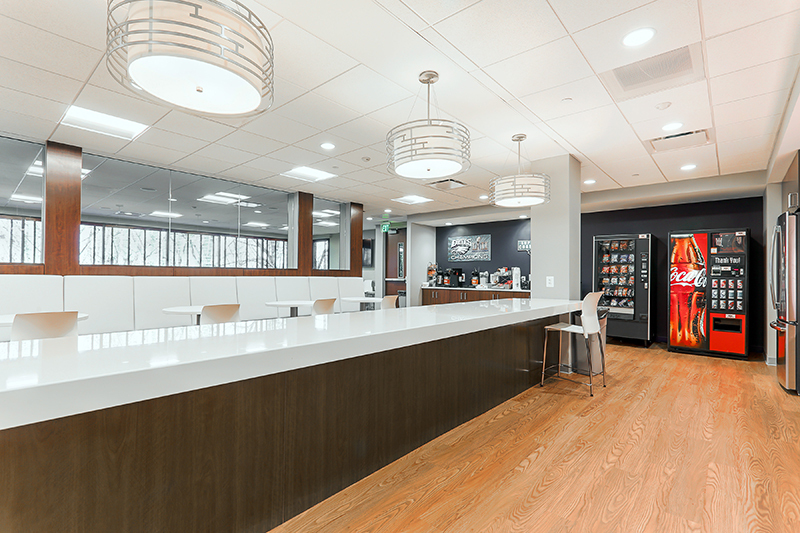 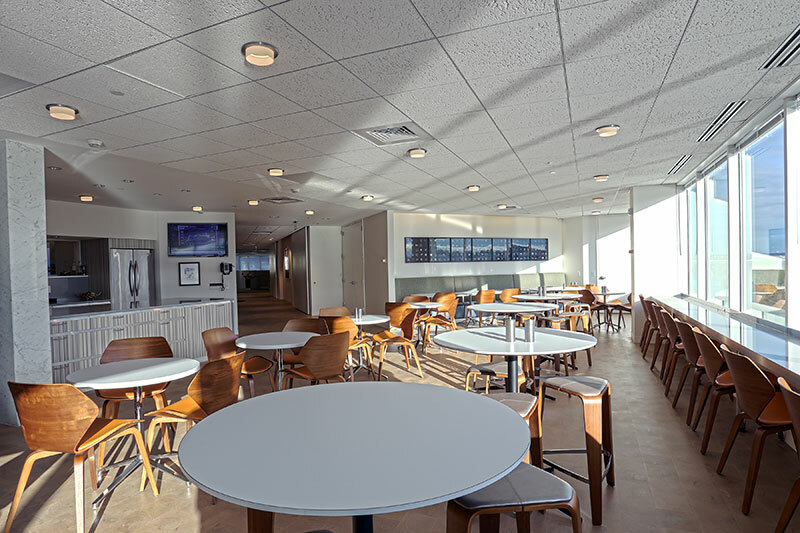 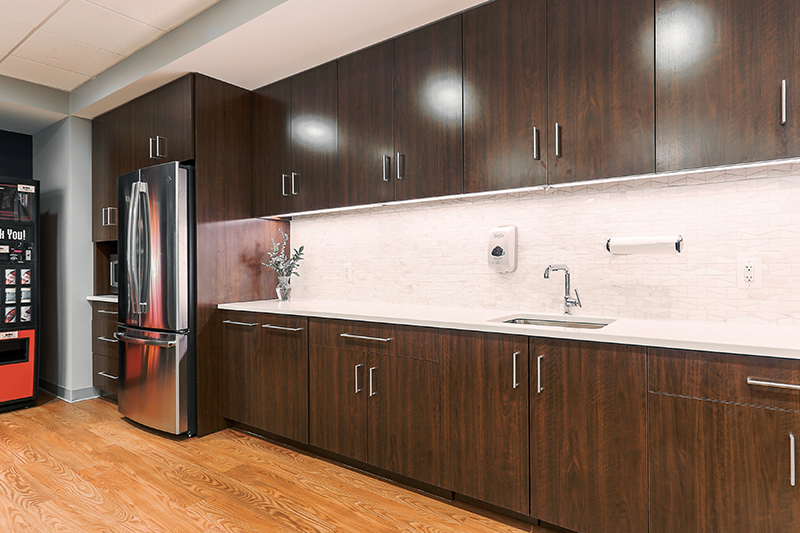 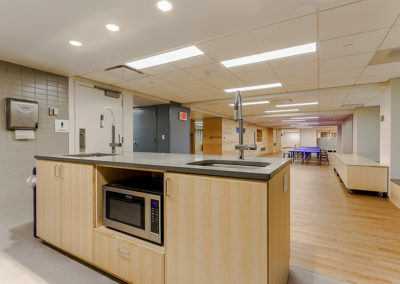 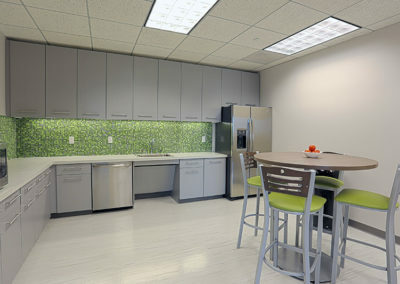 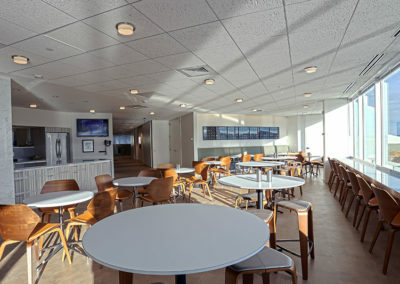 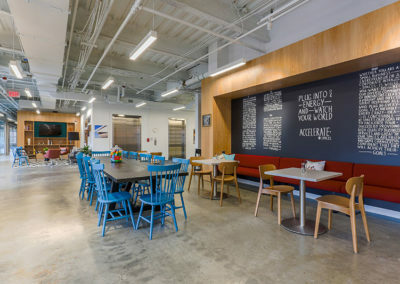 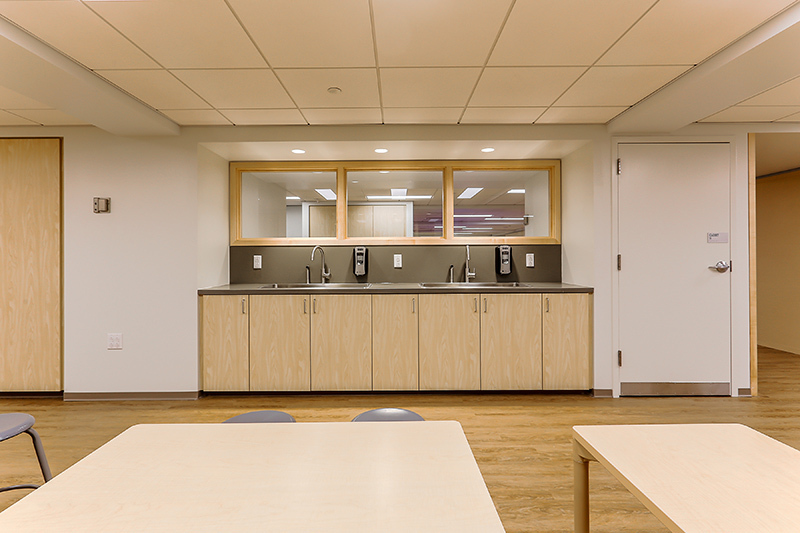 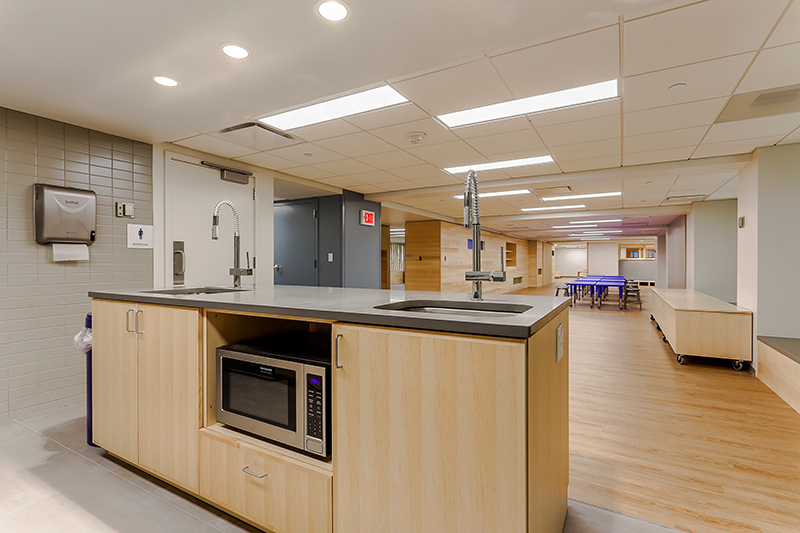 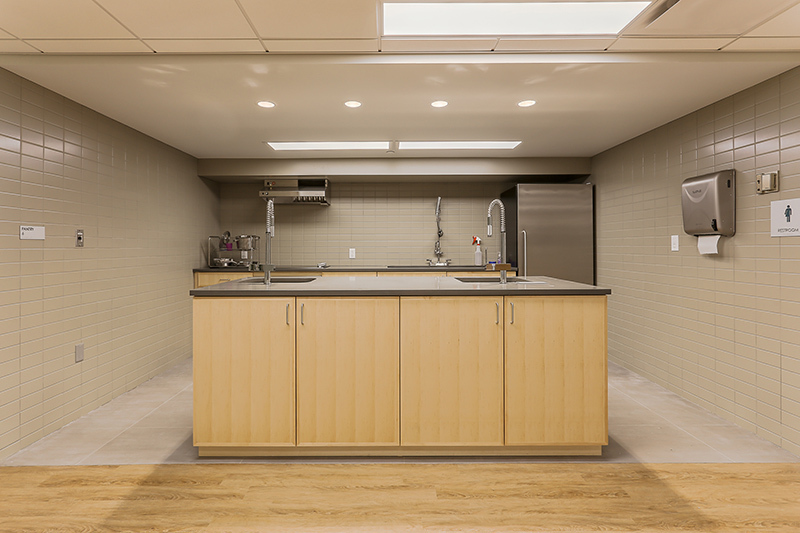 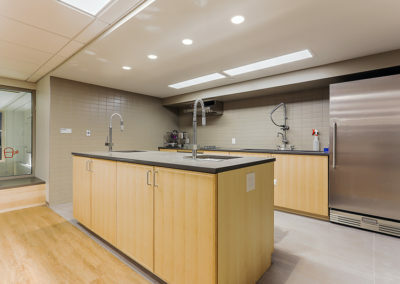 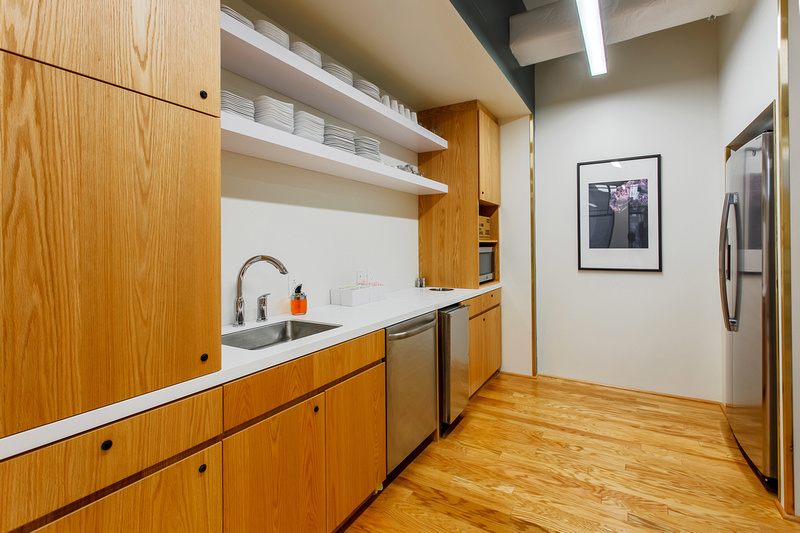 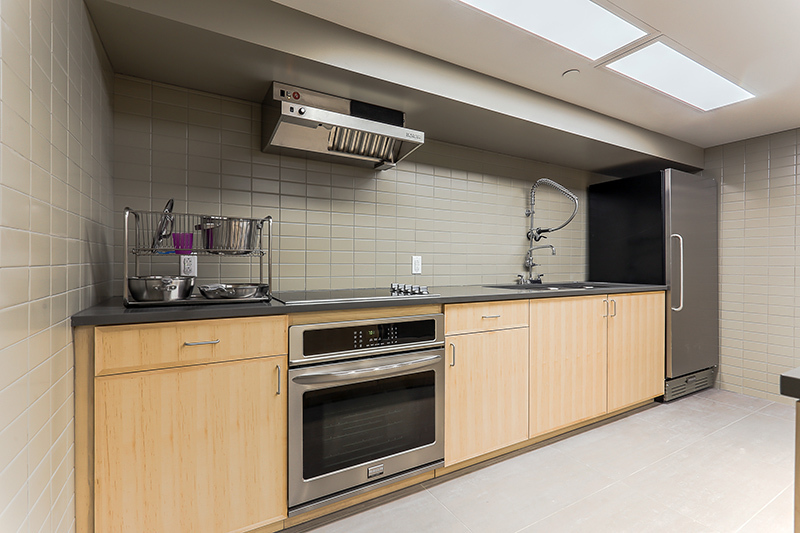 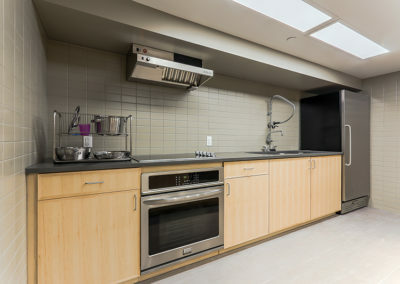 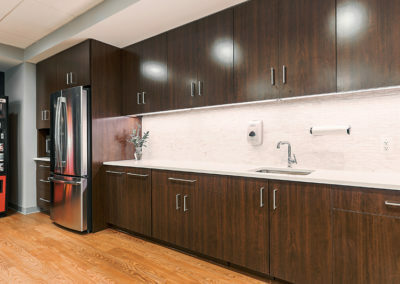 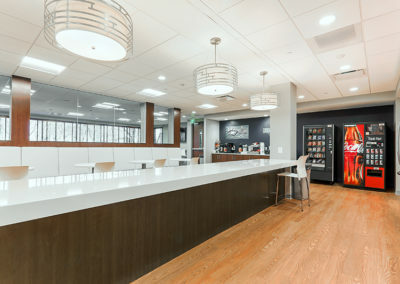 The total project area also included a full commercial catering kitchen with café style seating. 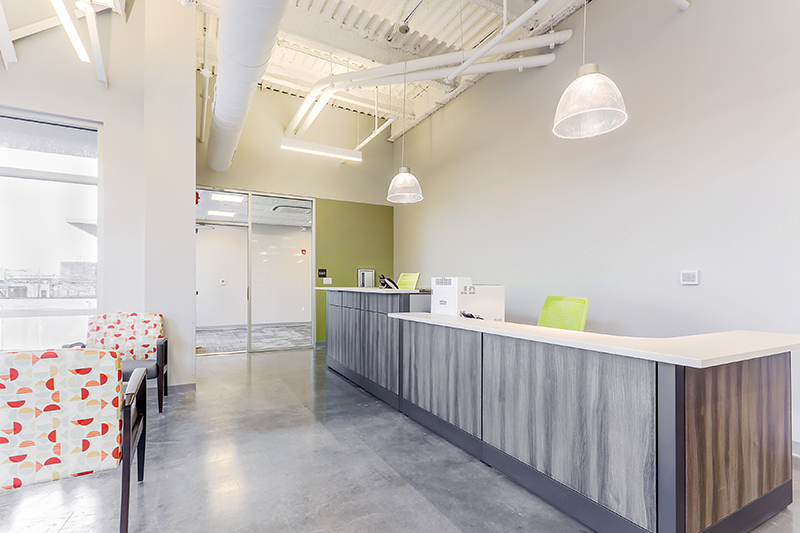 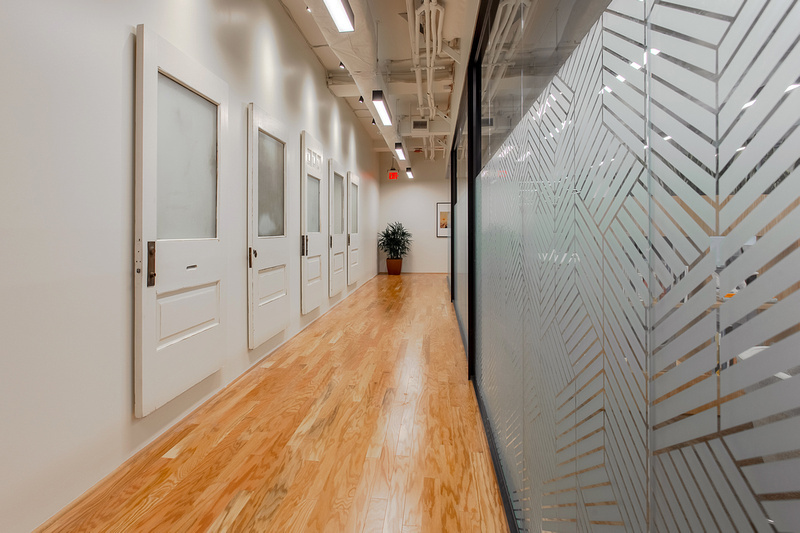 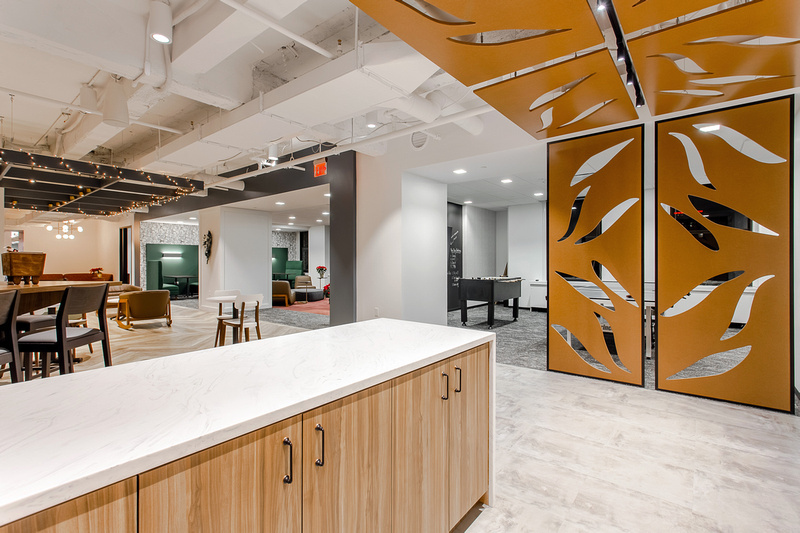 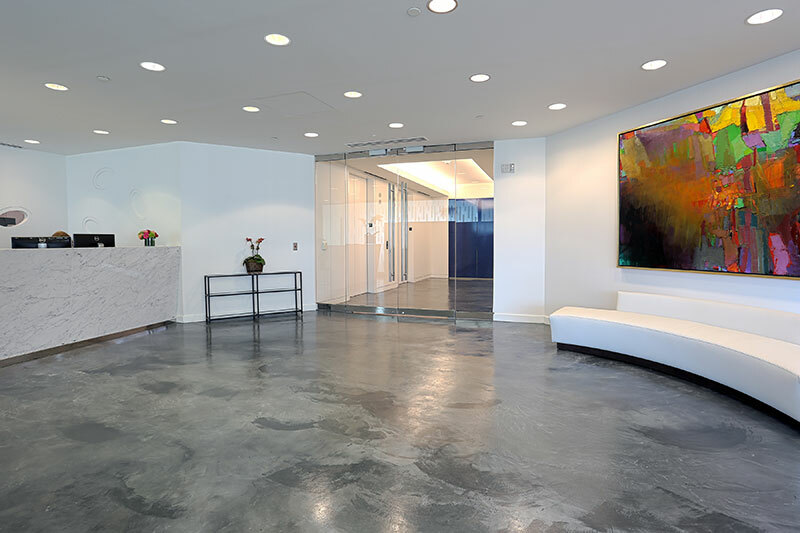 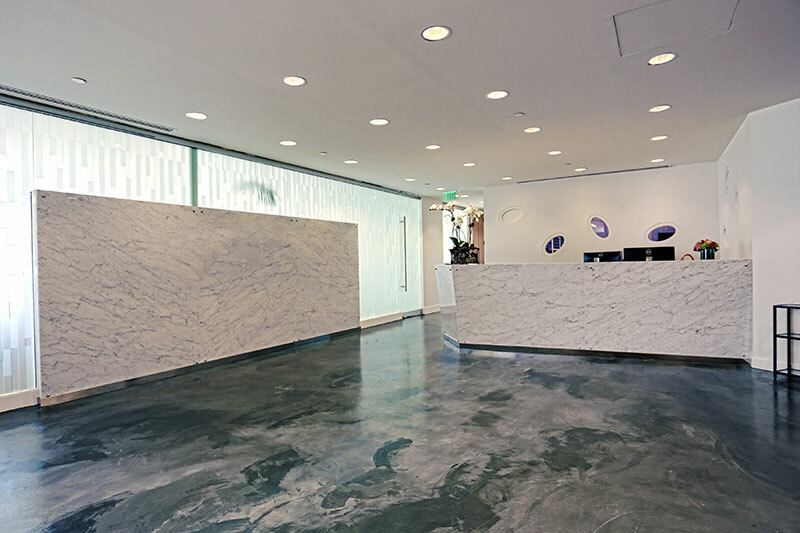 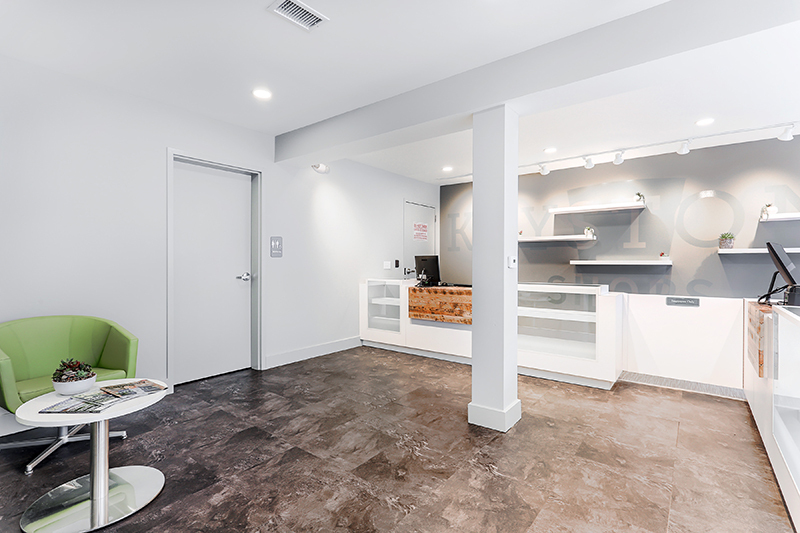 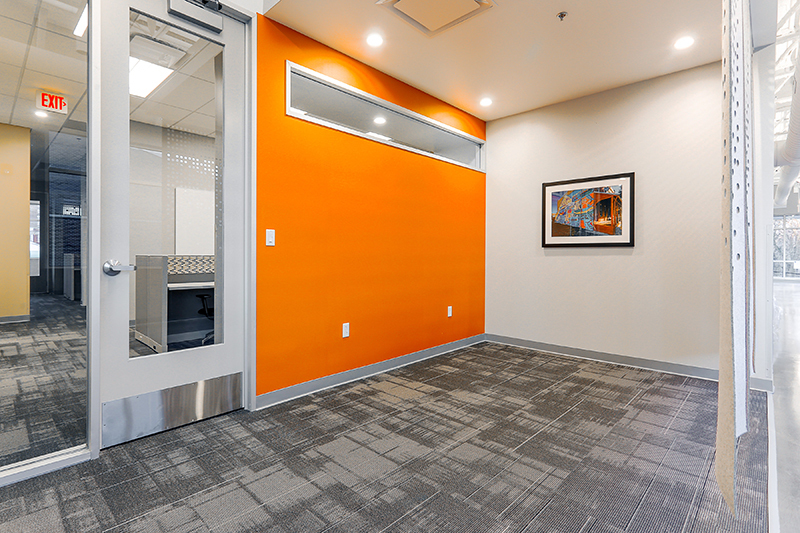 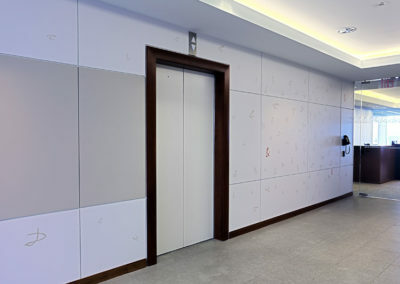 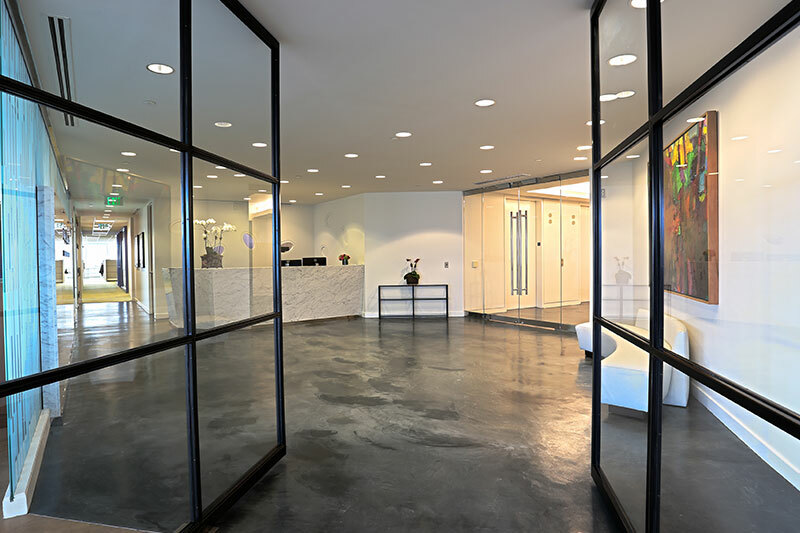 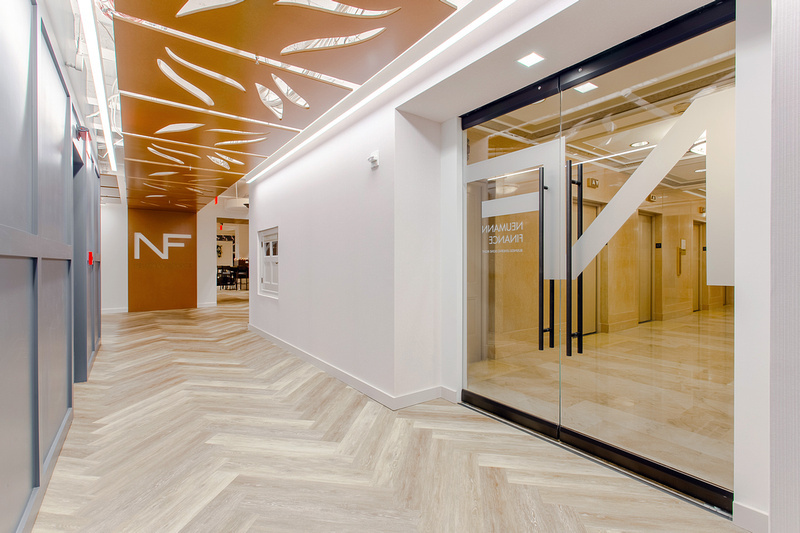 The reception area and elevator lobby were renovated to include marbleized, polished concrete flooring and custom pivot doors. 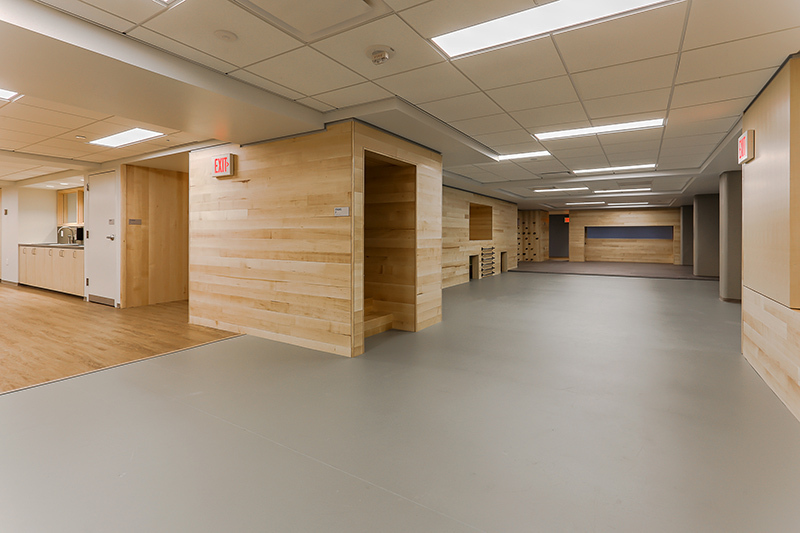 This phased project included coordination of swing space, personnel moves and FF&E, which required meticulous planning and scheduling. 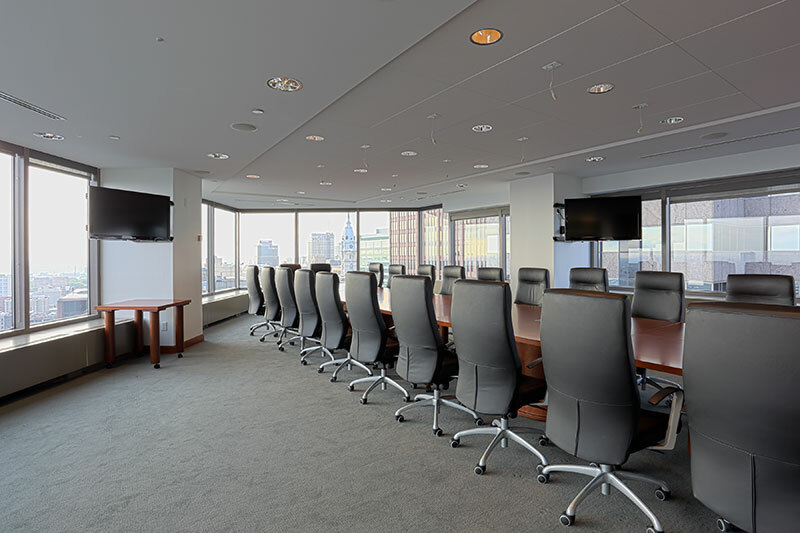 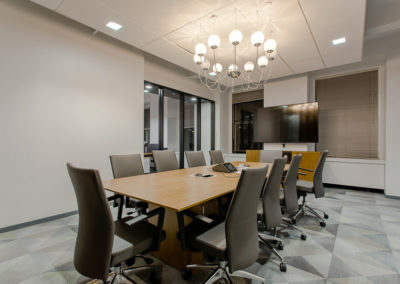 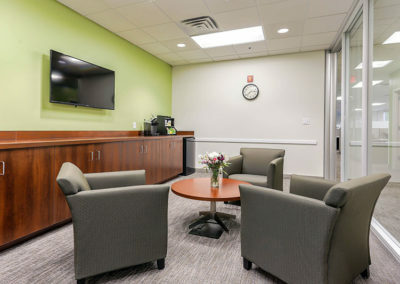 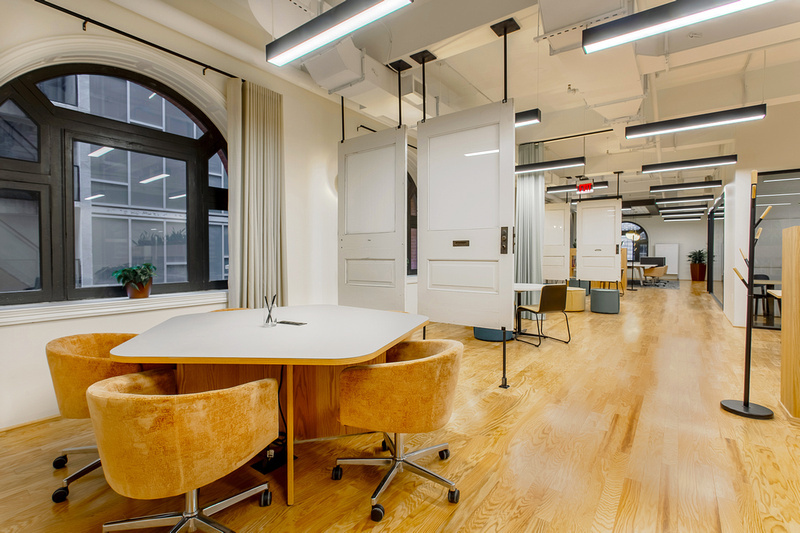 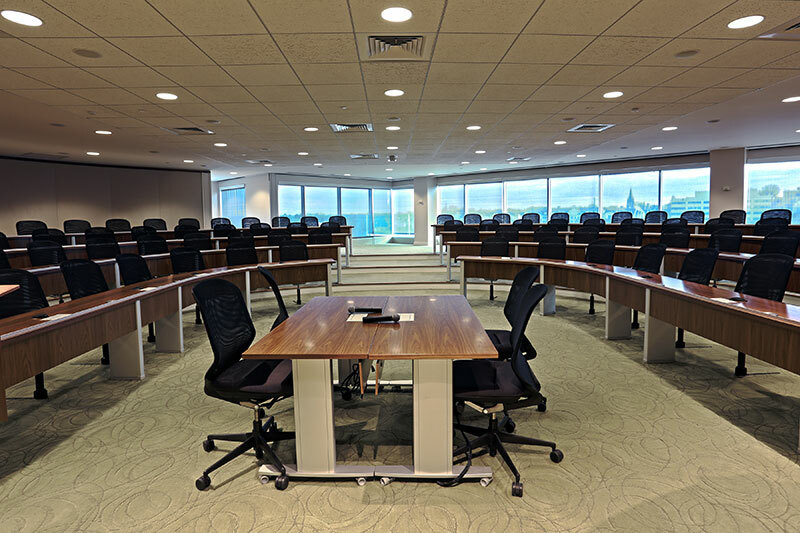 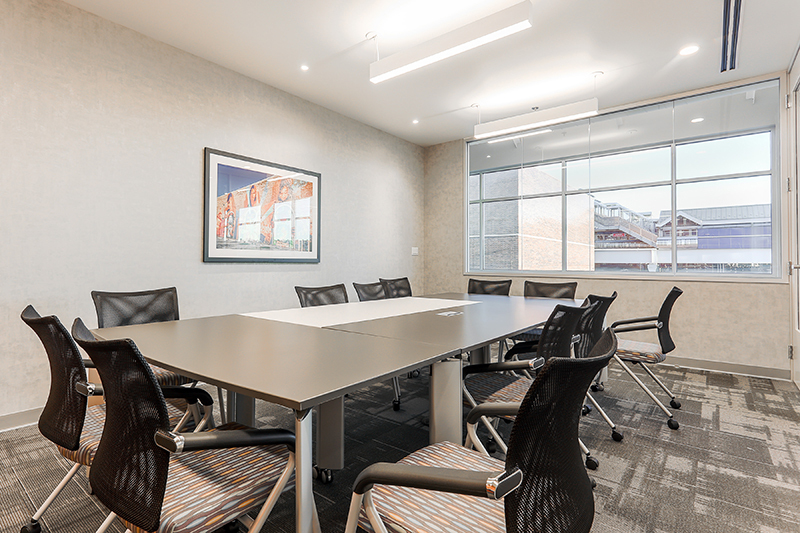 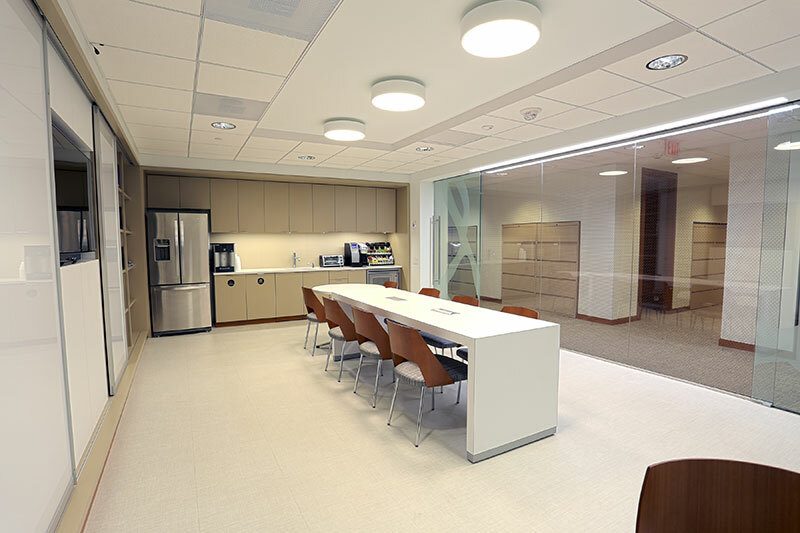 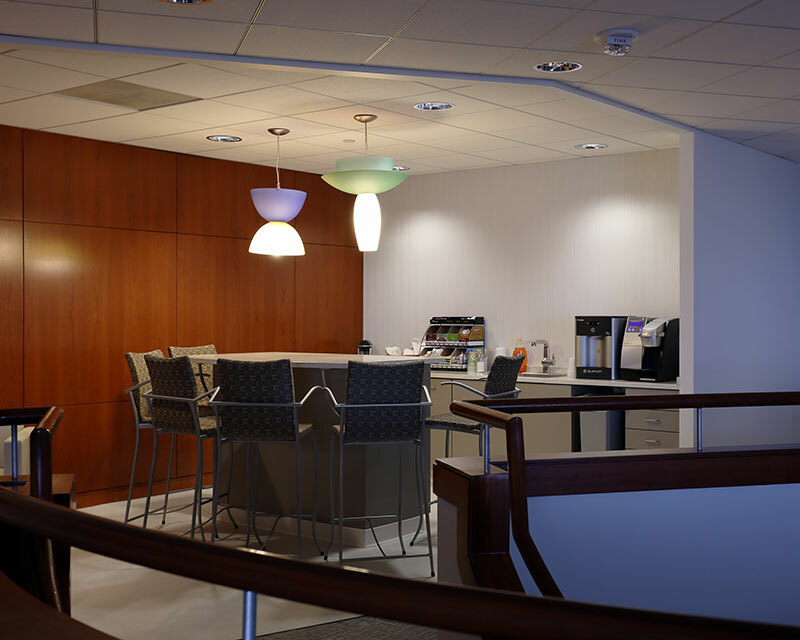 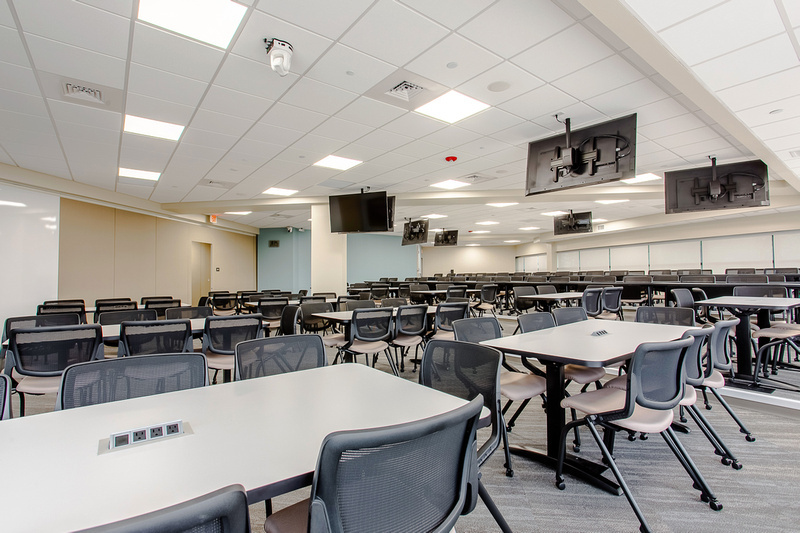 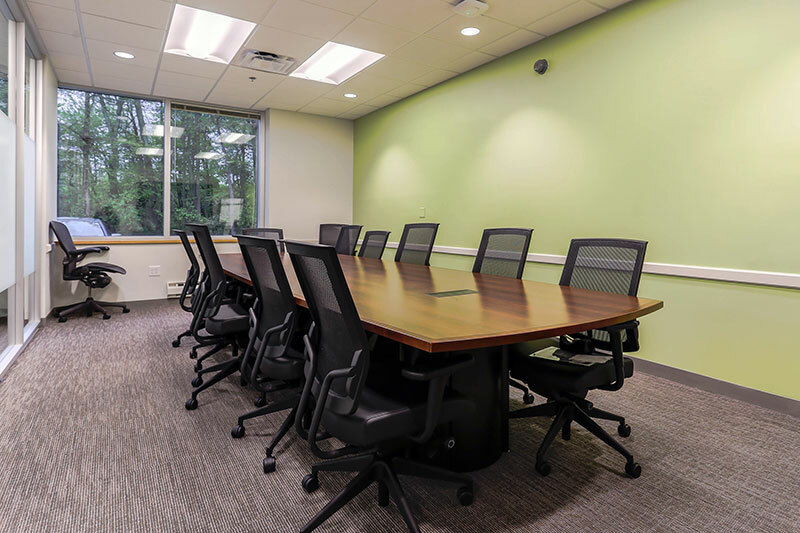 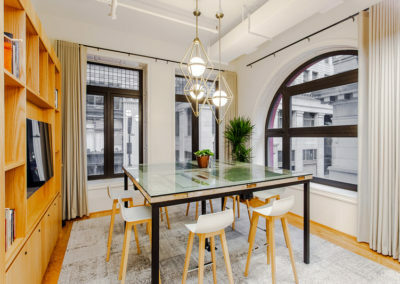 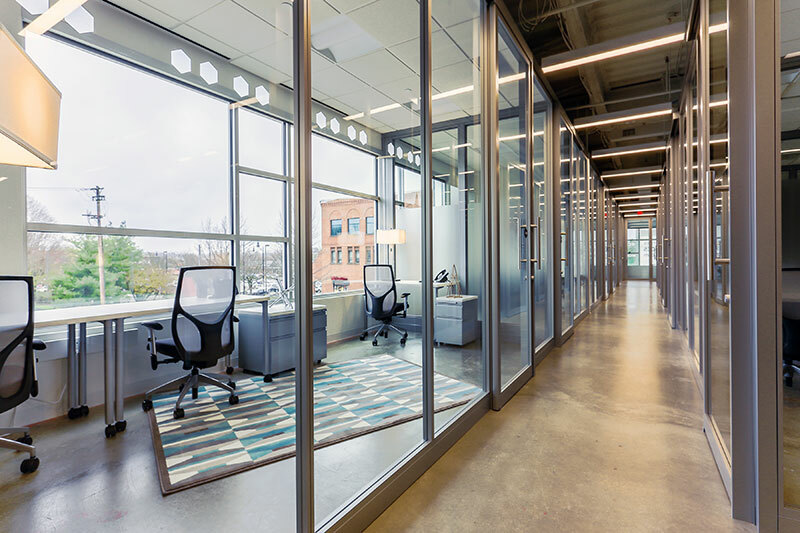 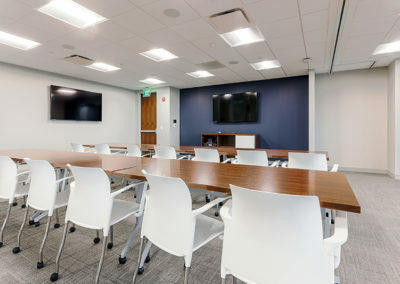 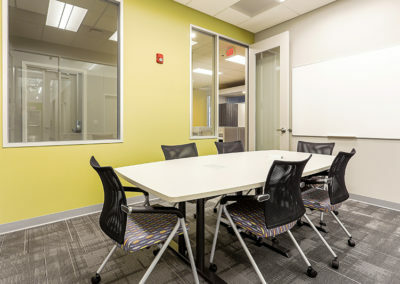 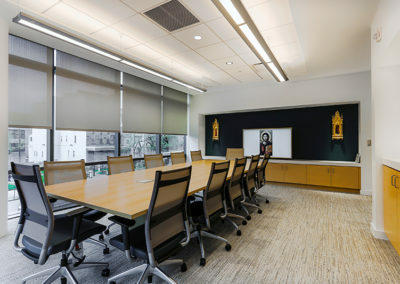 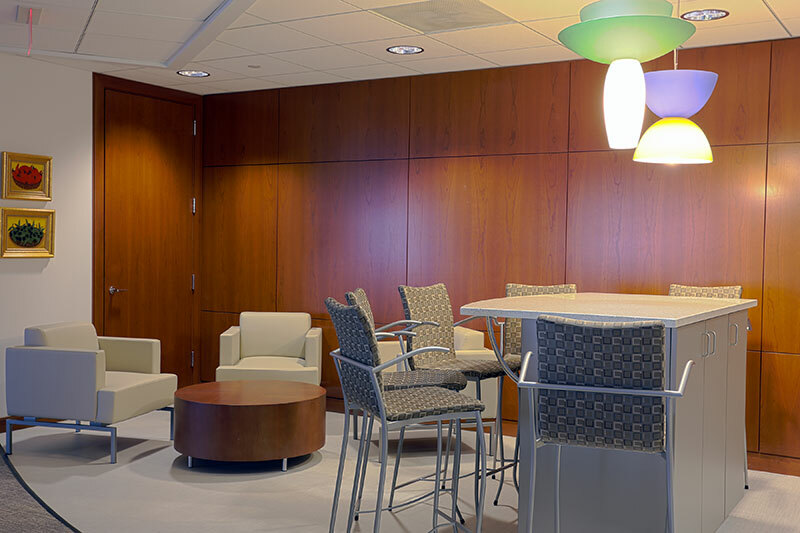 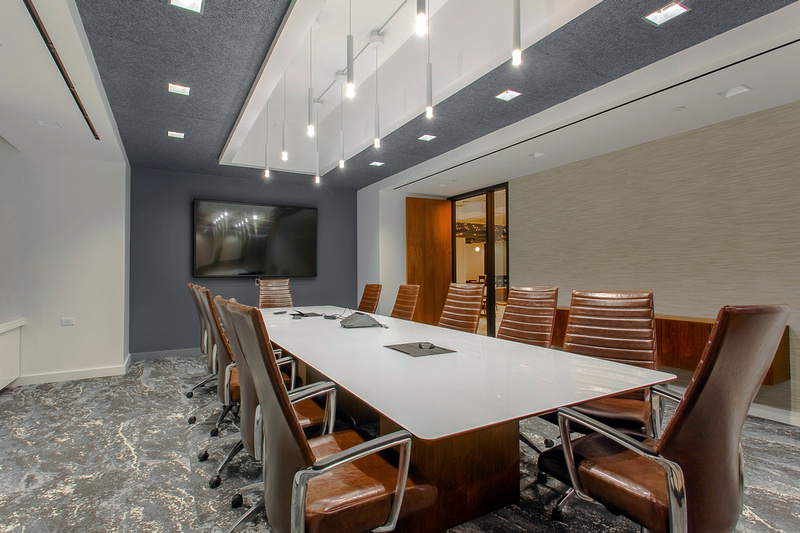 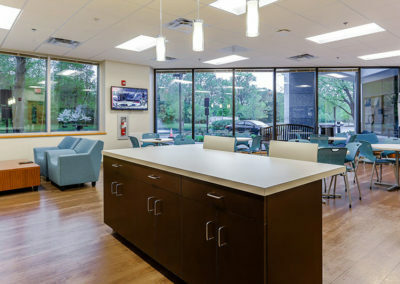 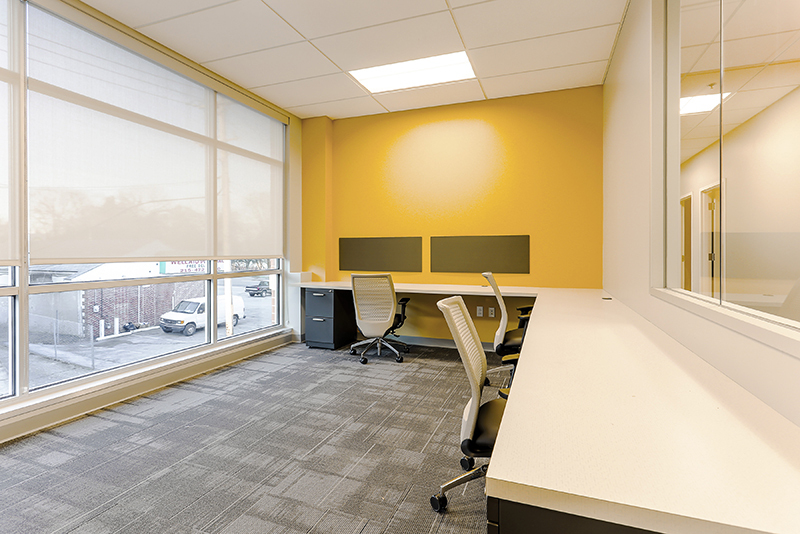 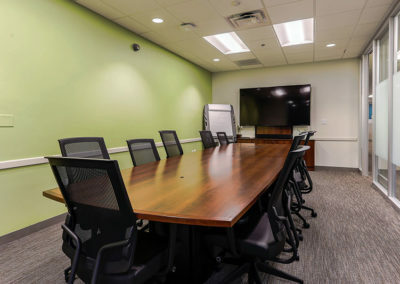 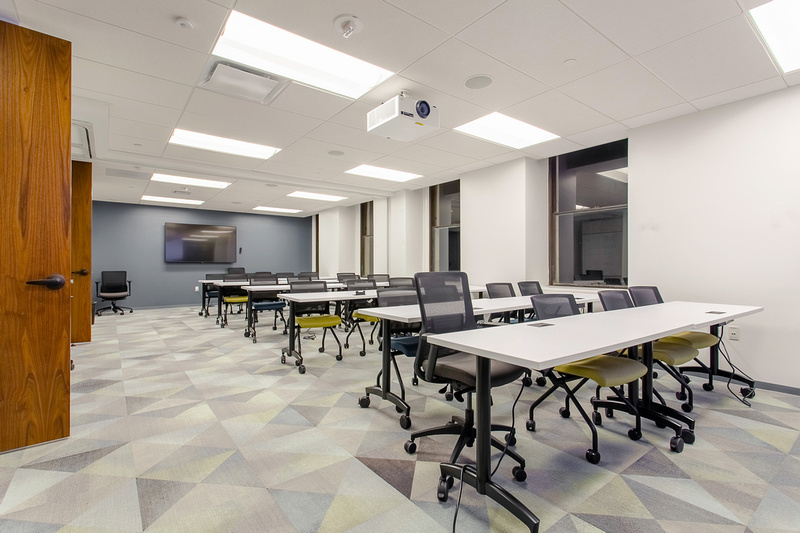 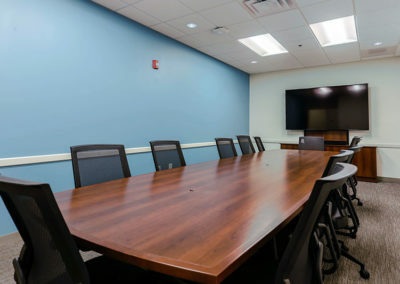 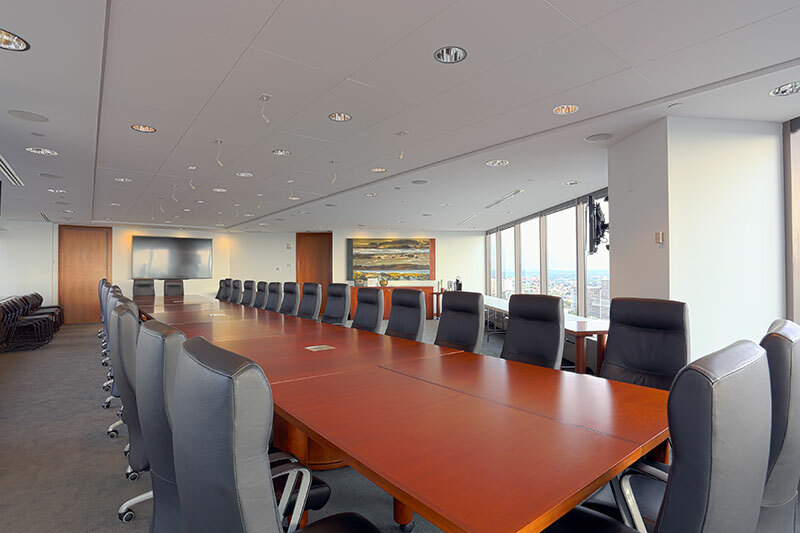 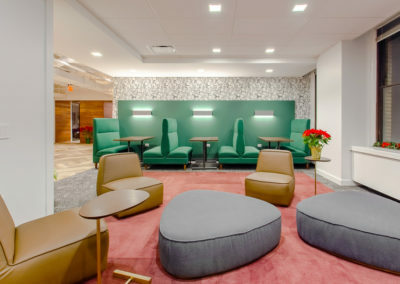 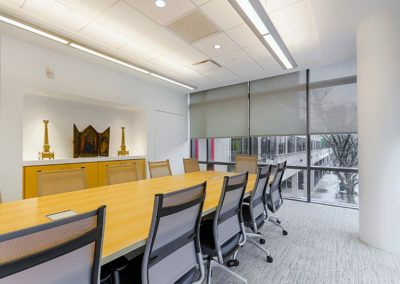 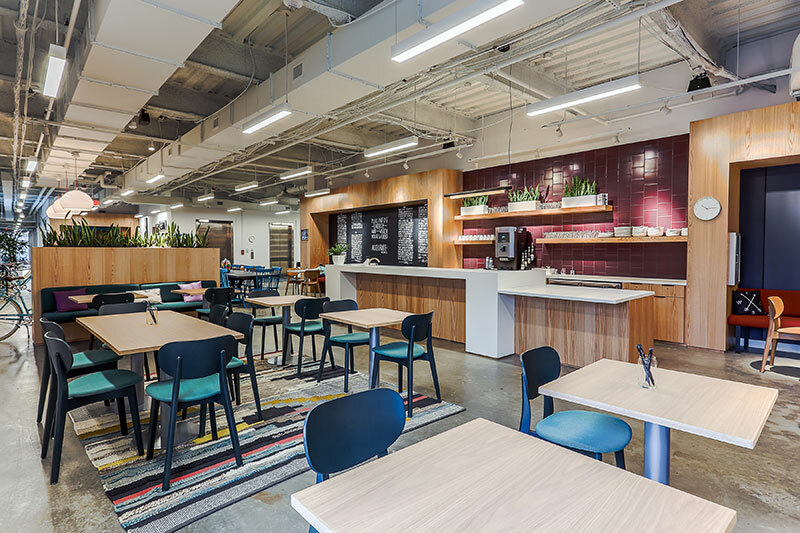 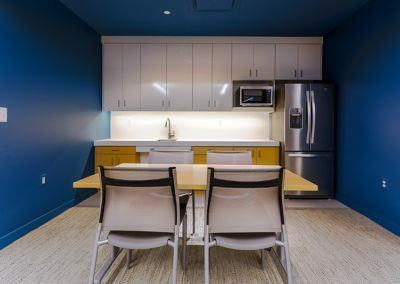 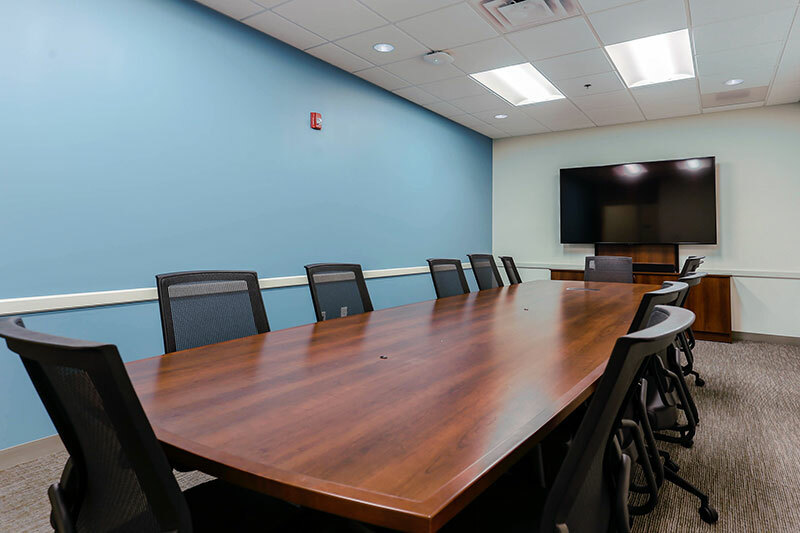 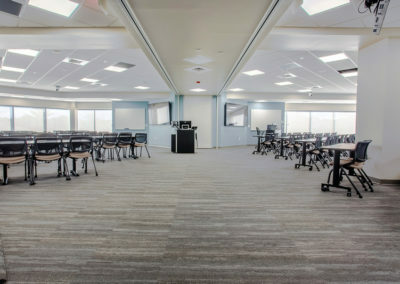 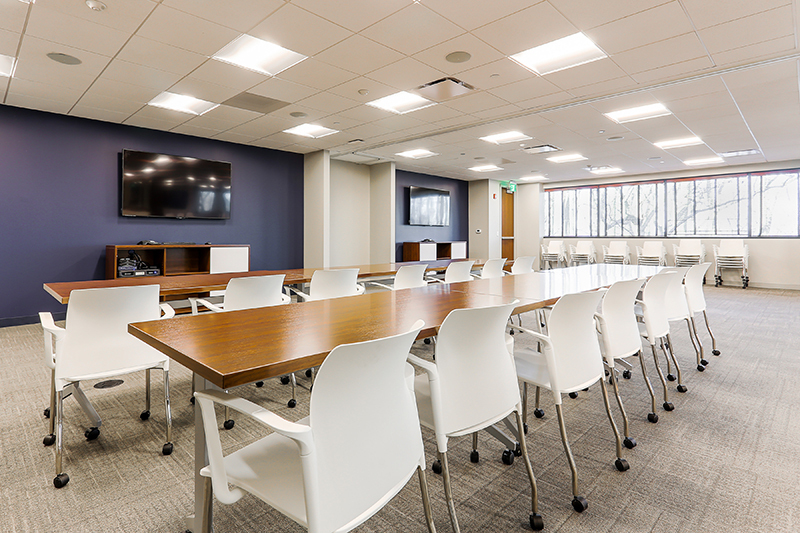 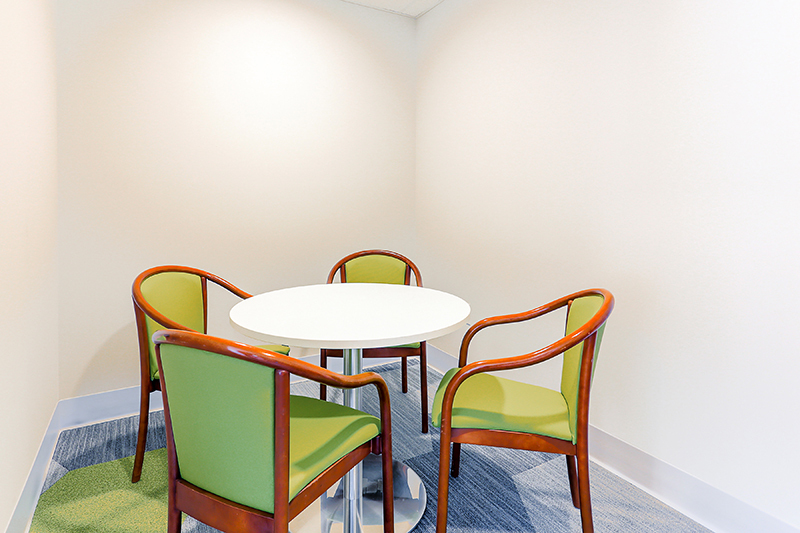 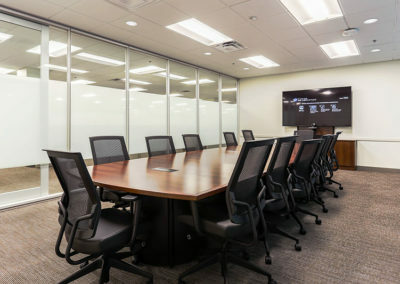 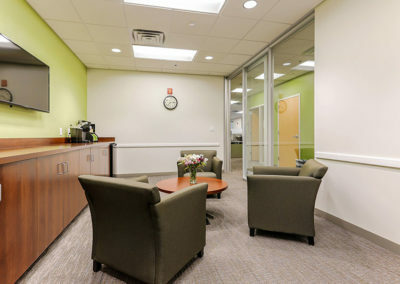 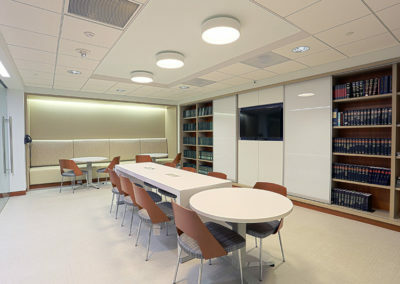 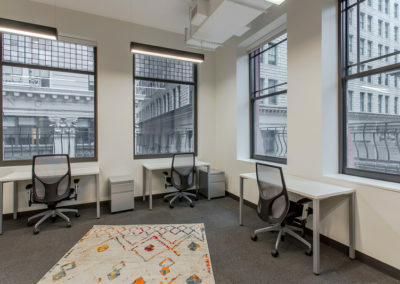 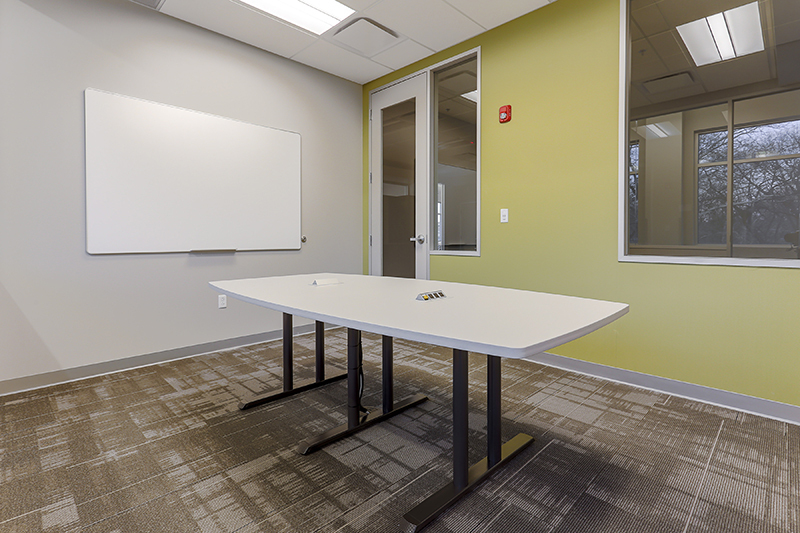 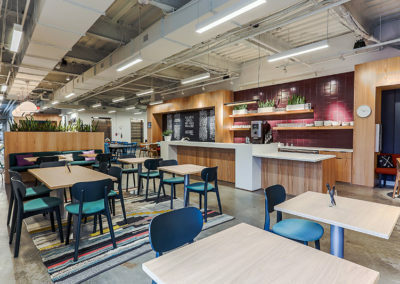 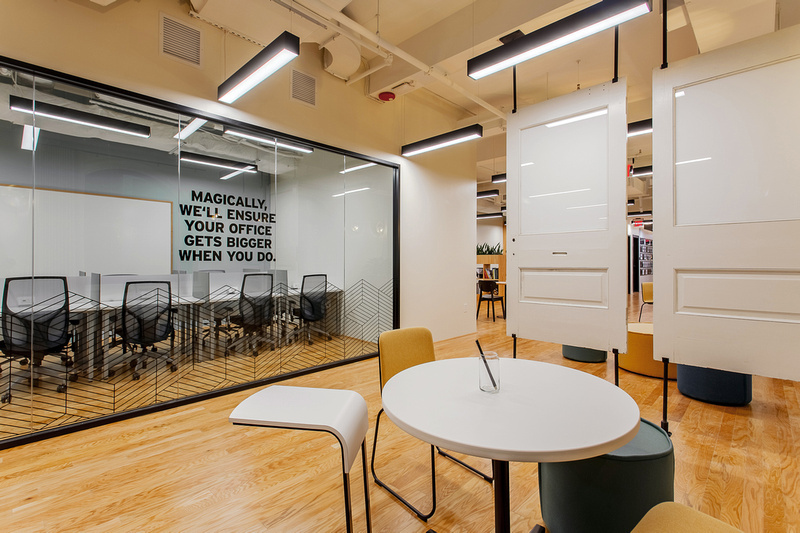 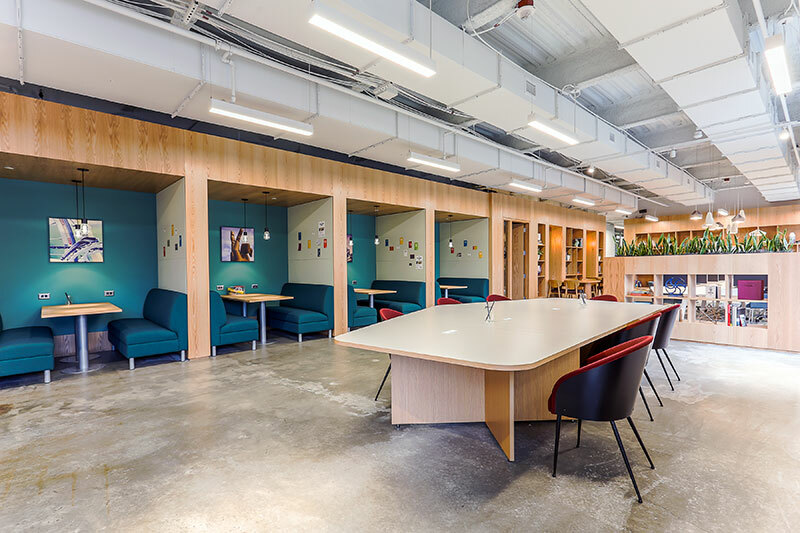 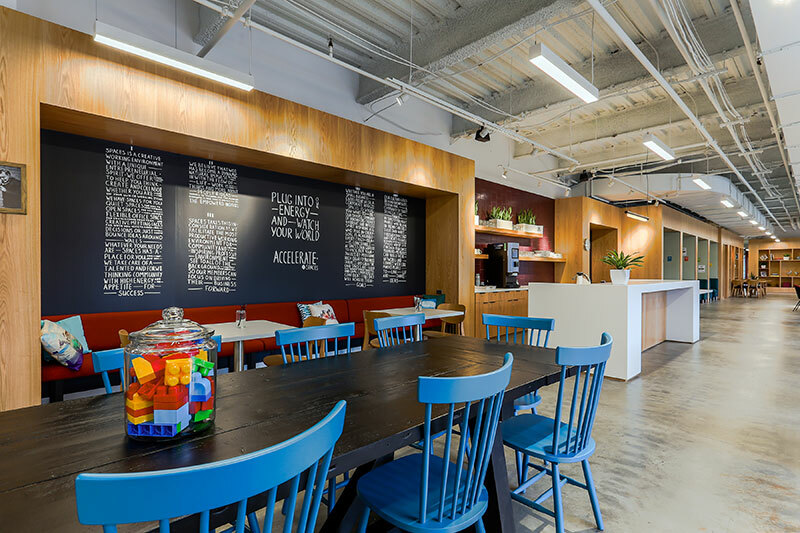 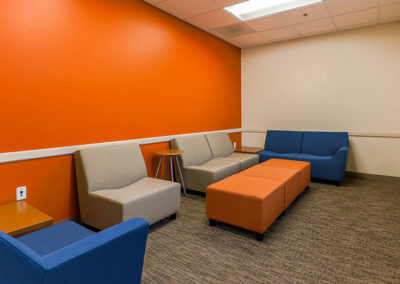 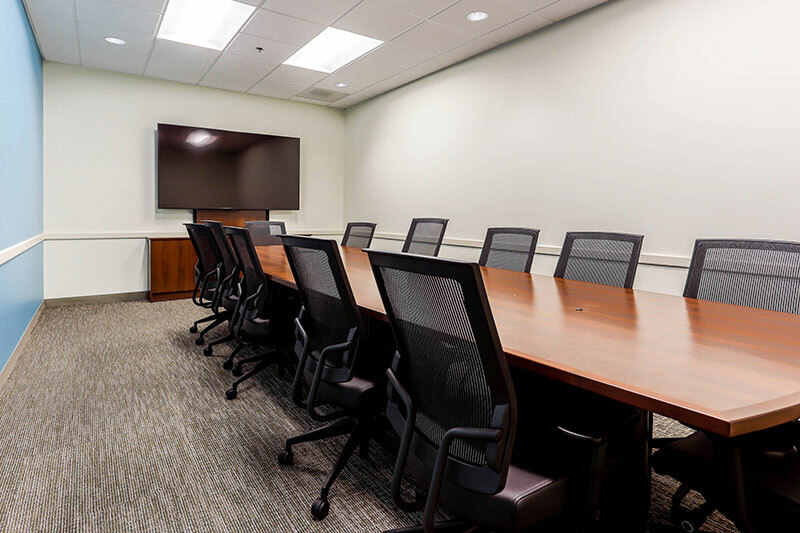 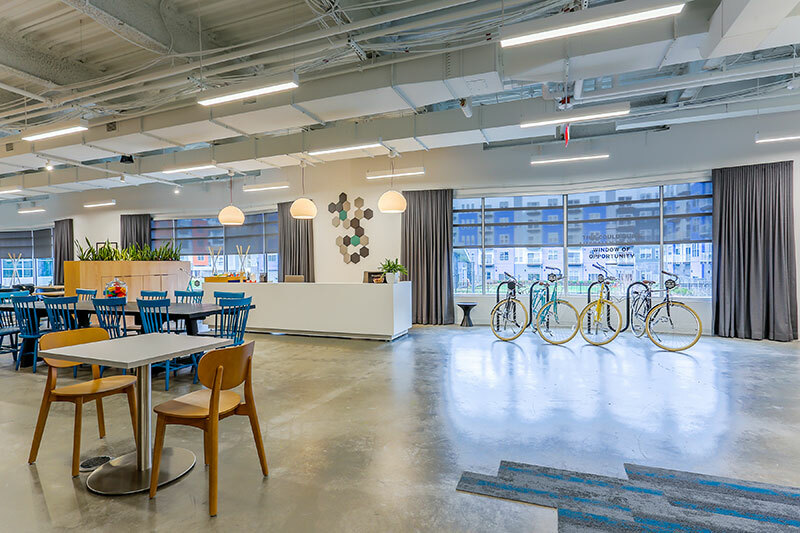 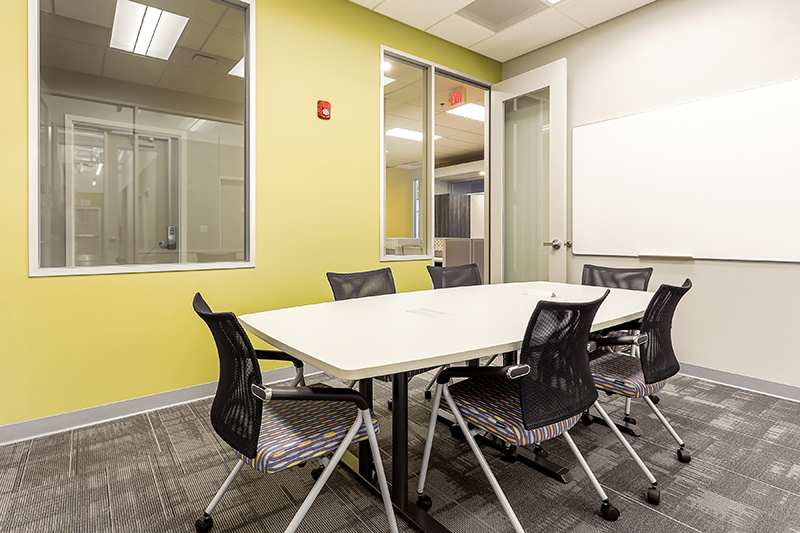 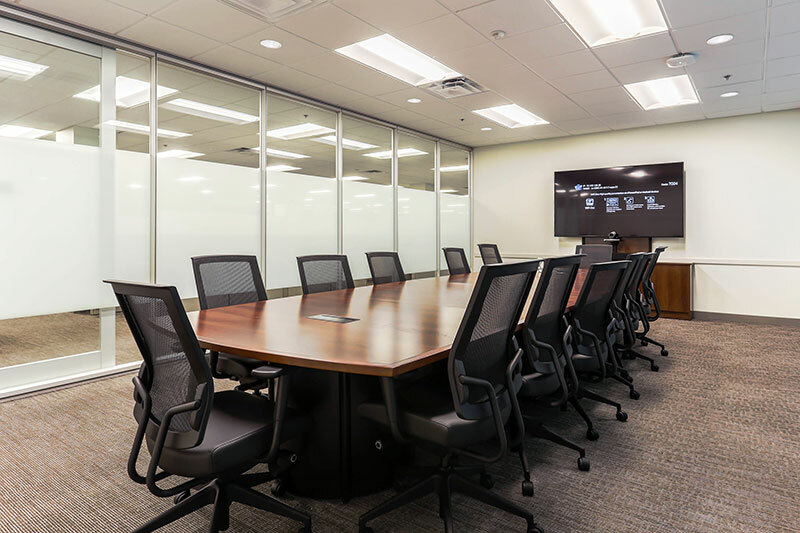 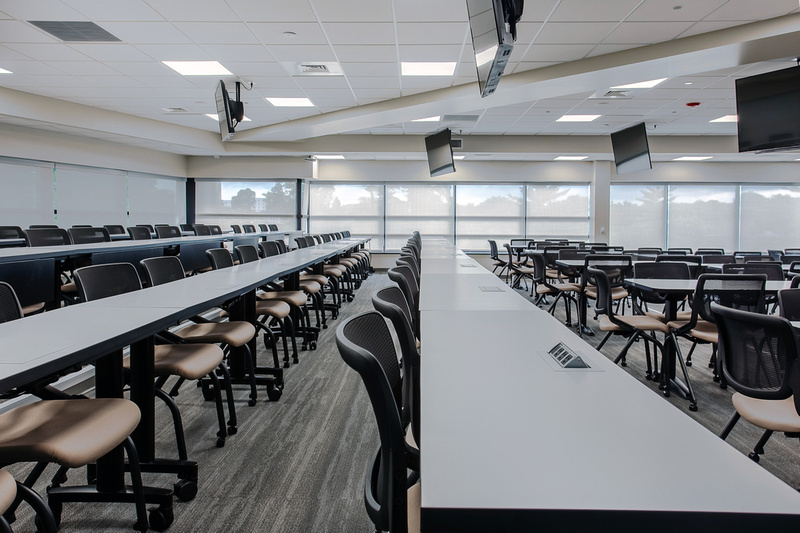 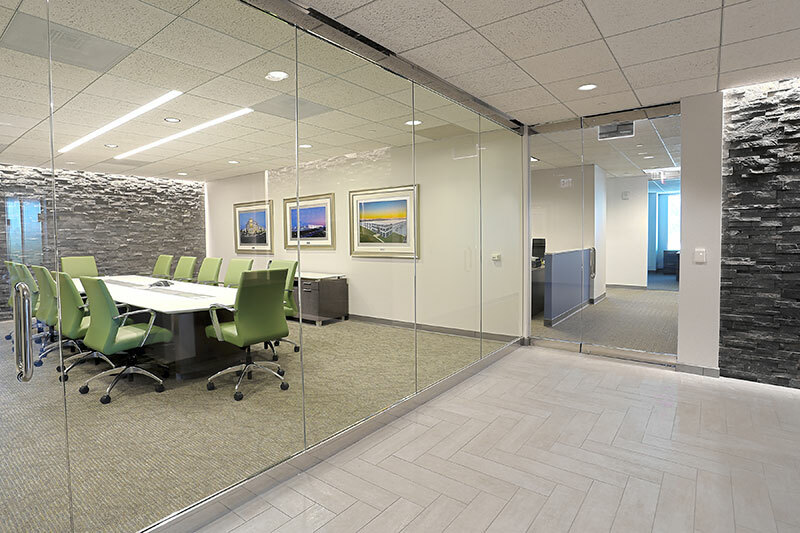 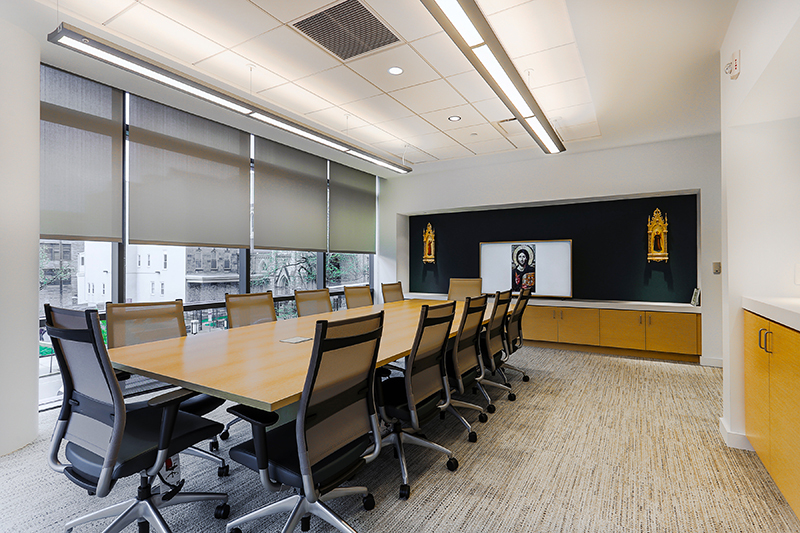 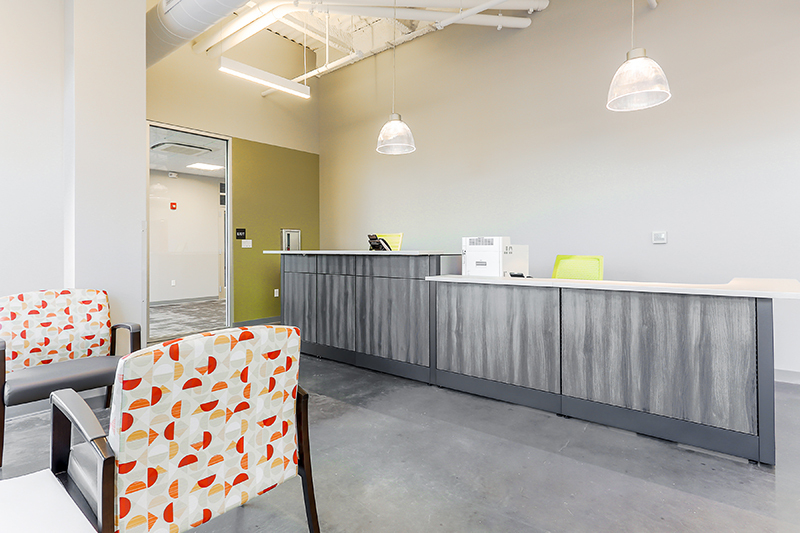 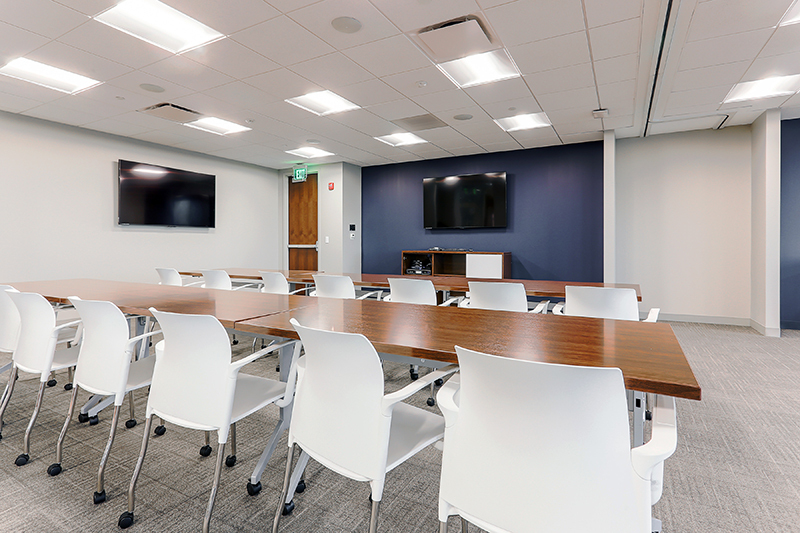 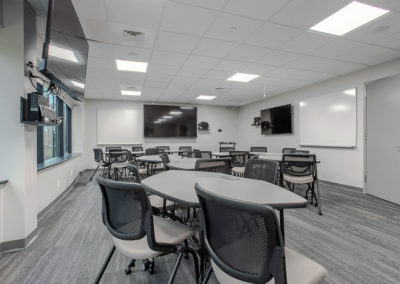 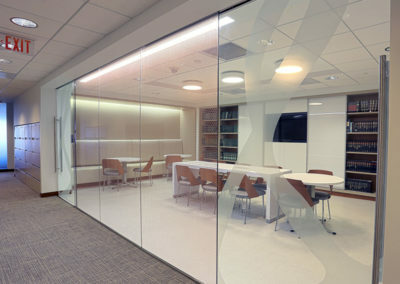 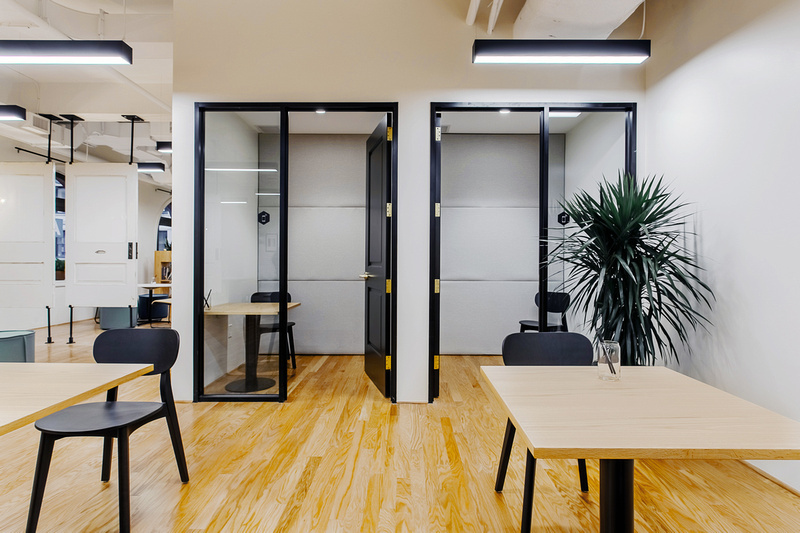 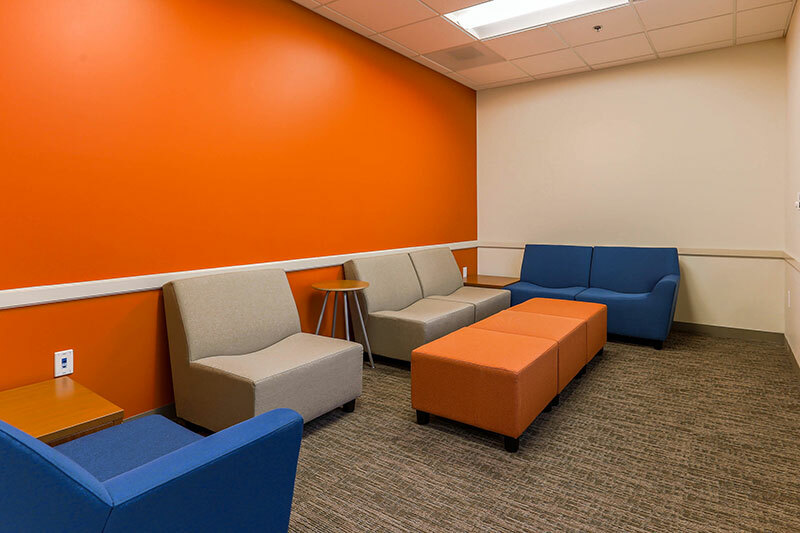 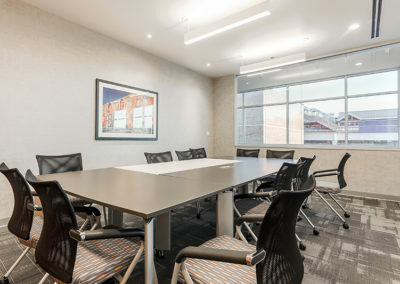 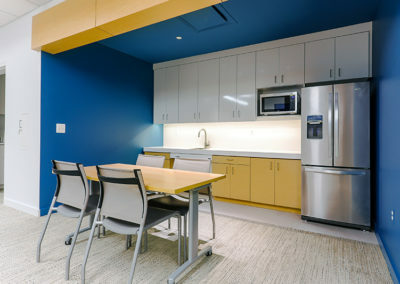 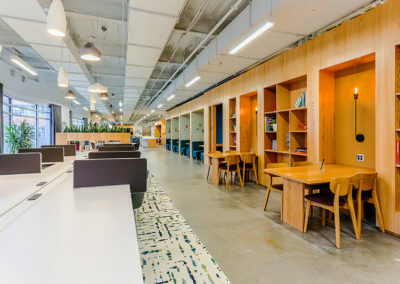 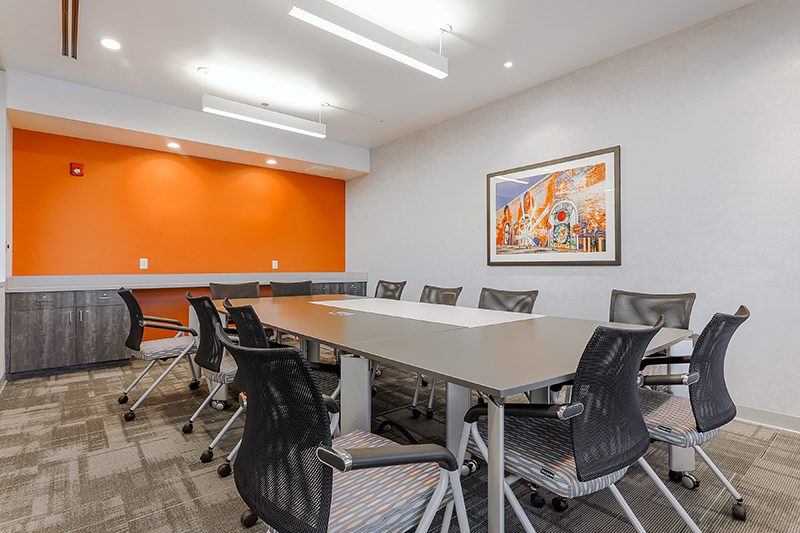 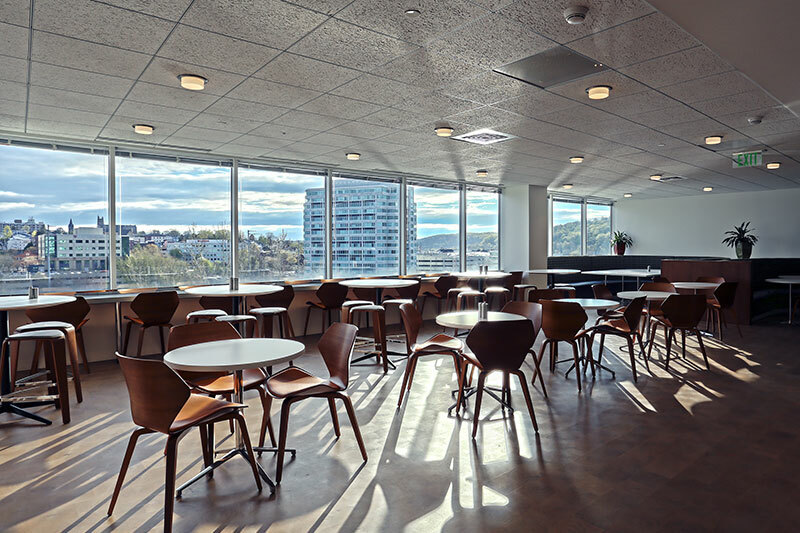 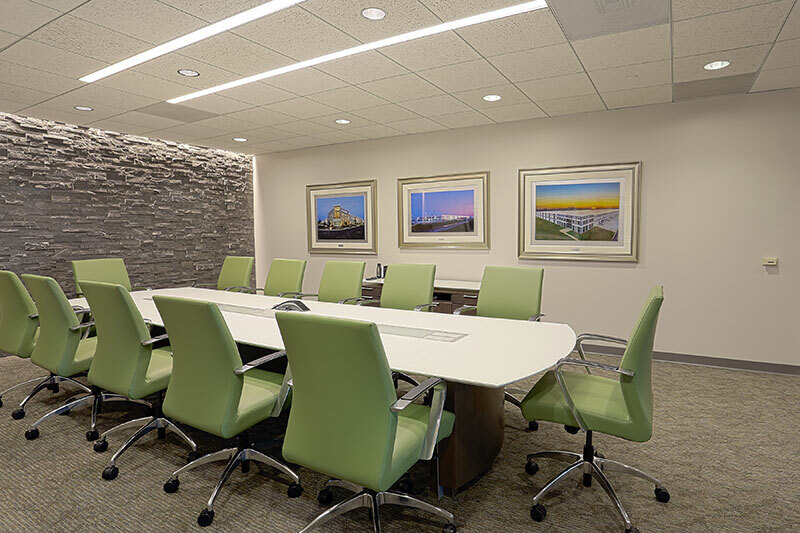 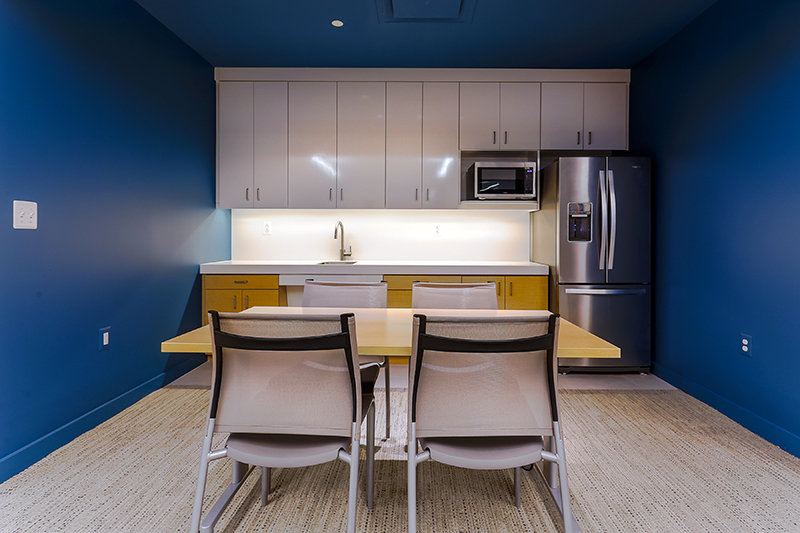 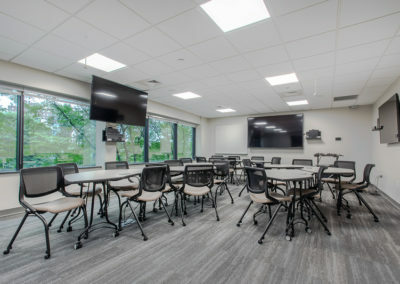 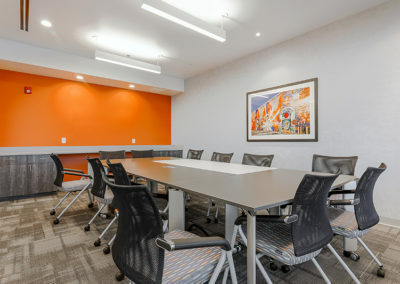 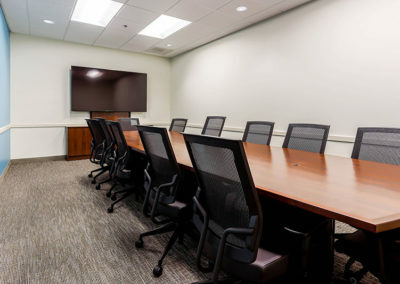 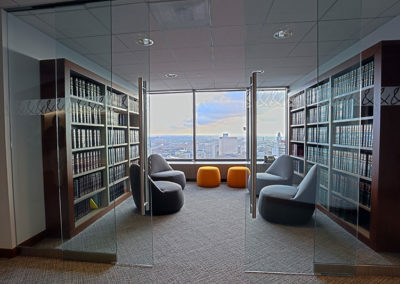 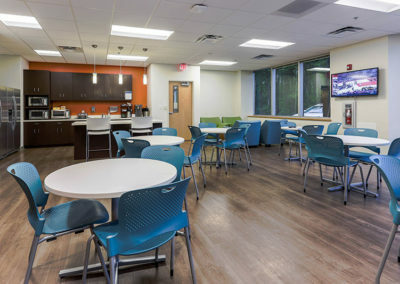 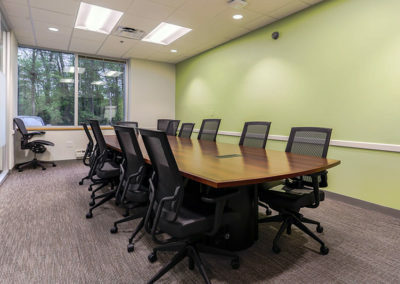 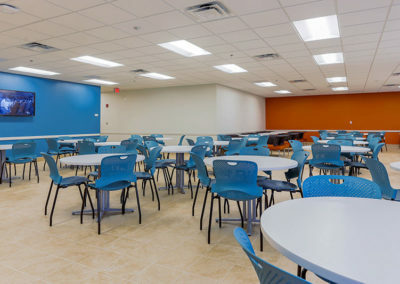 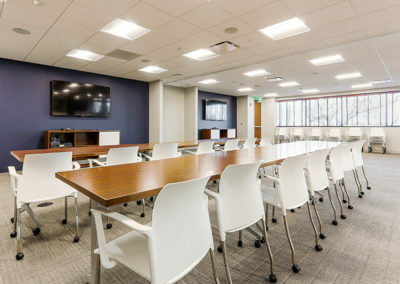 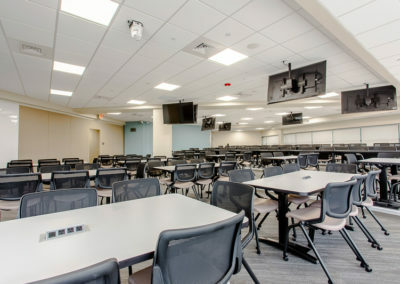 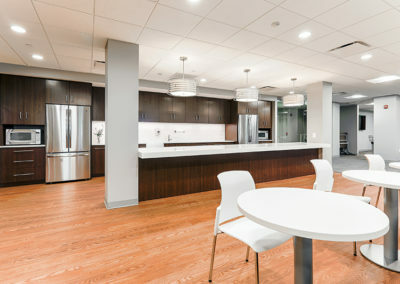 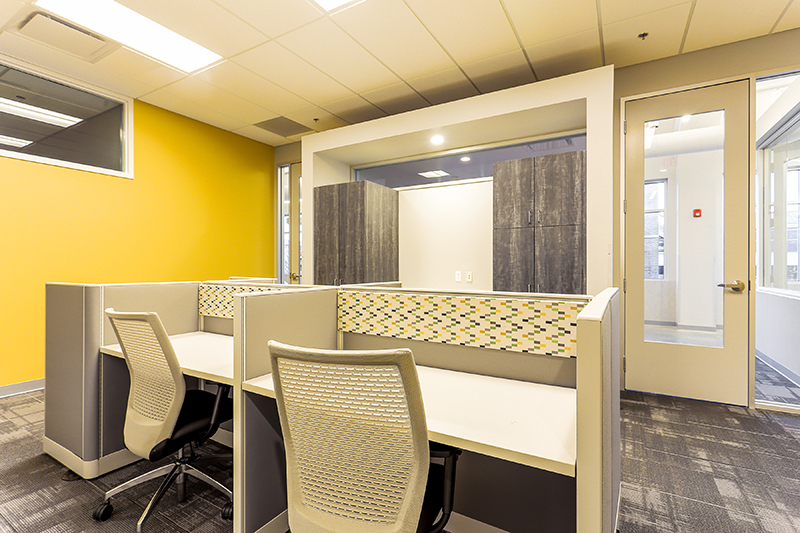 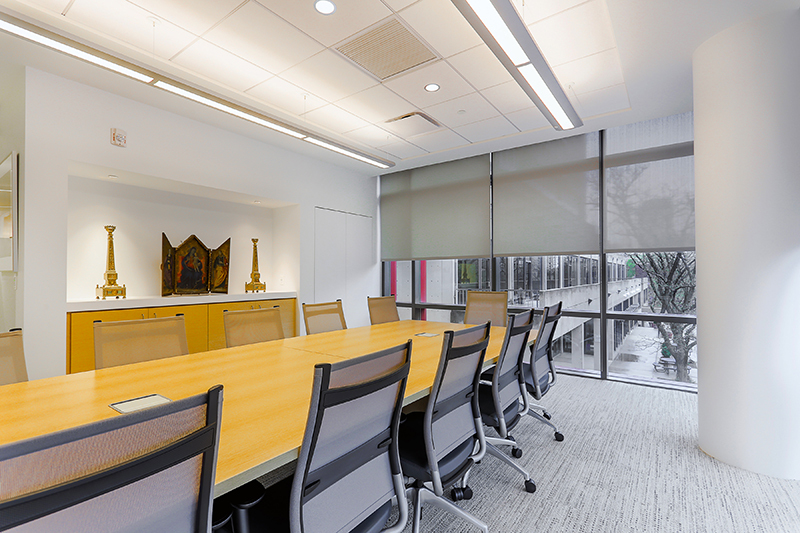 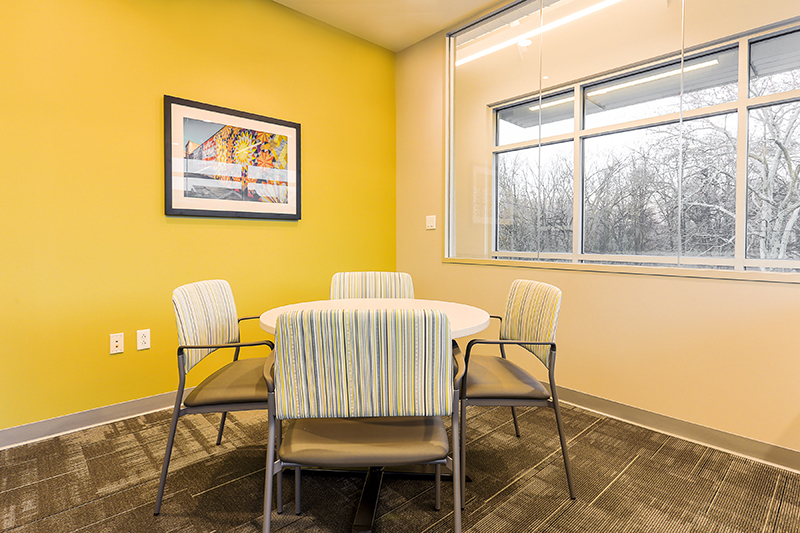 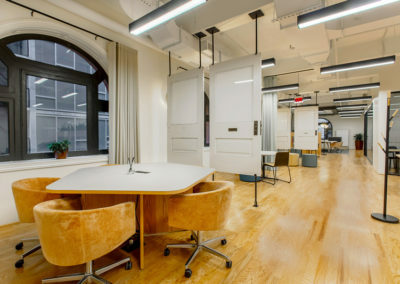 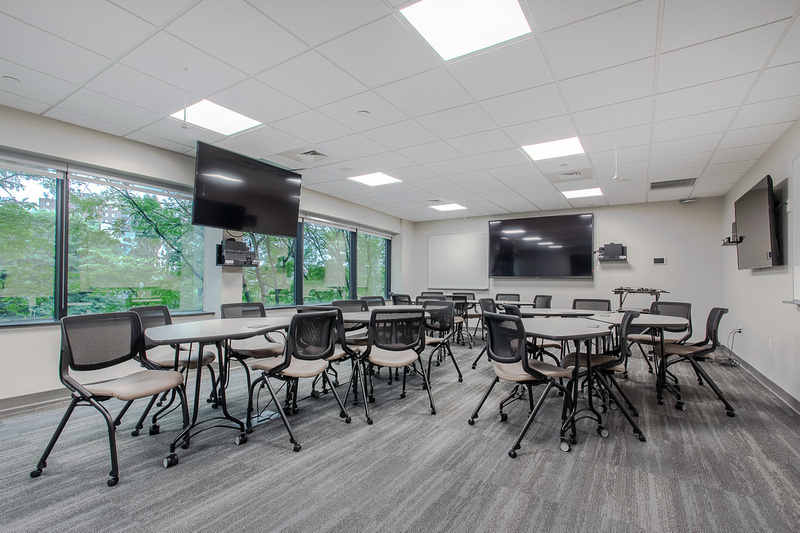 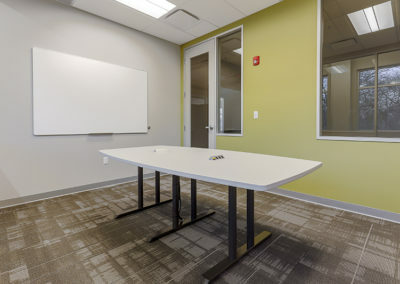 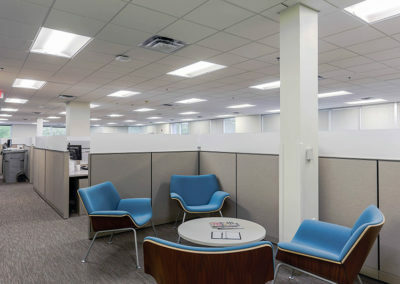 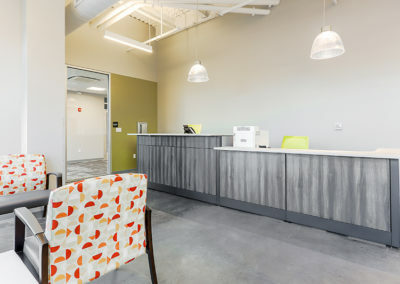 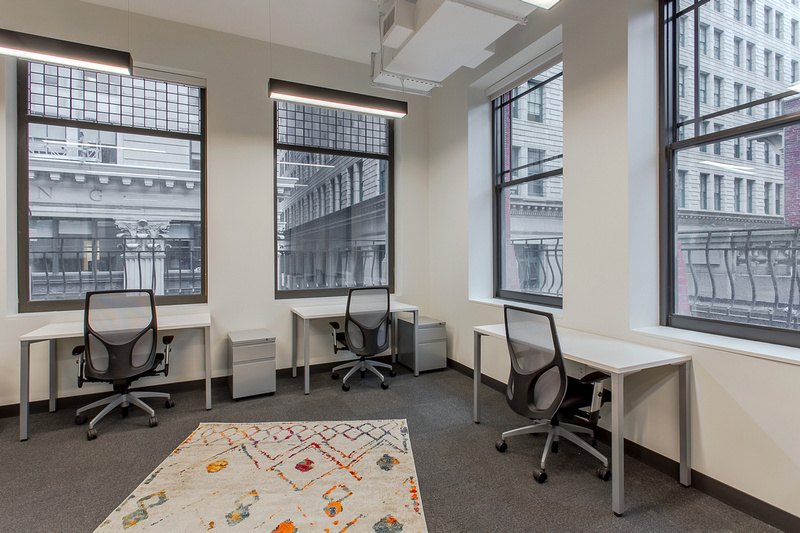 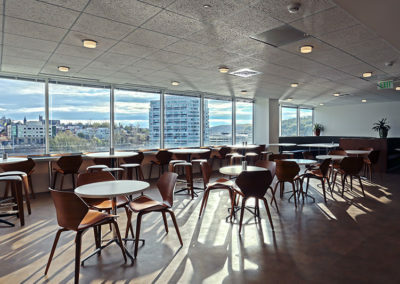 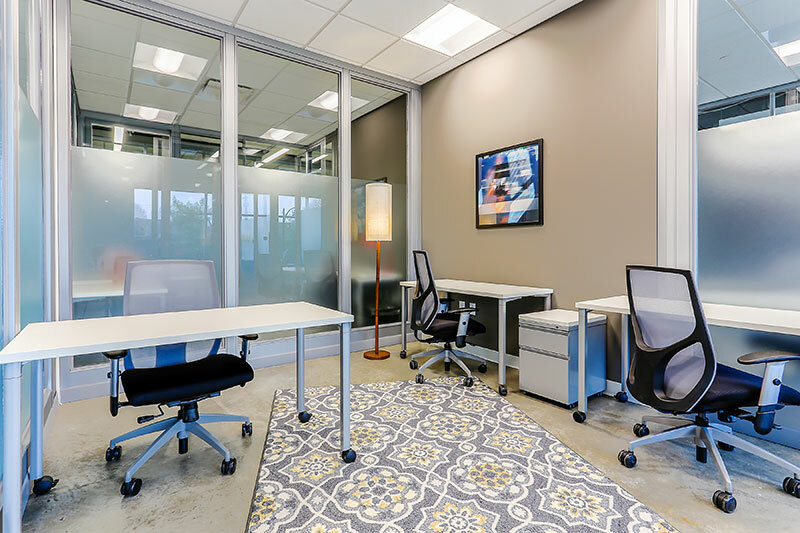 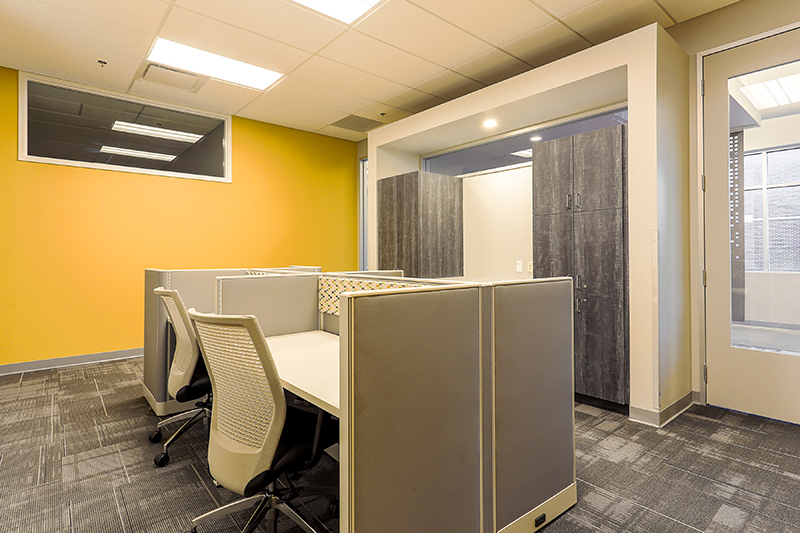 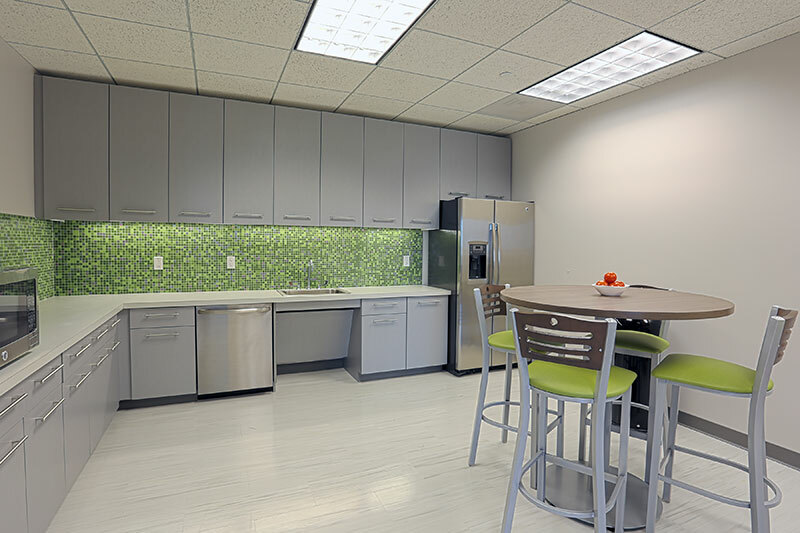 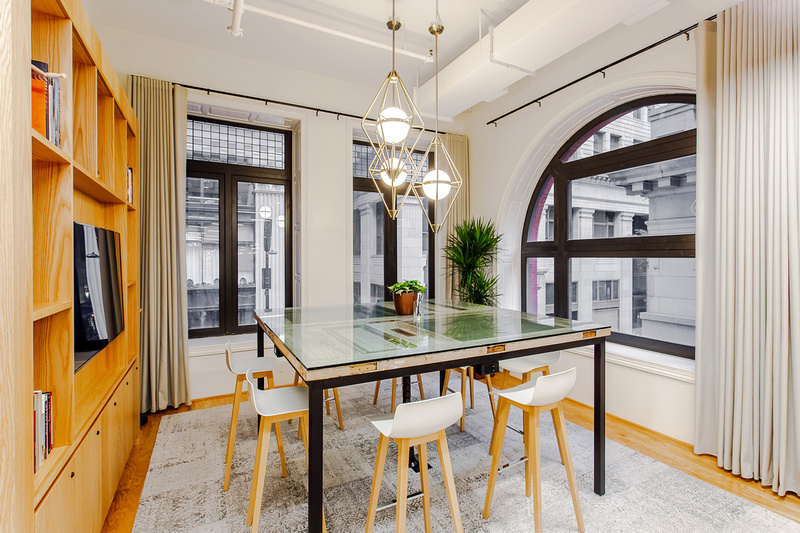 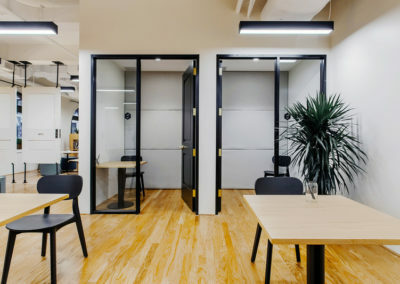 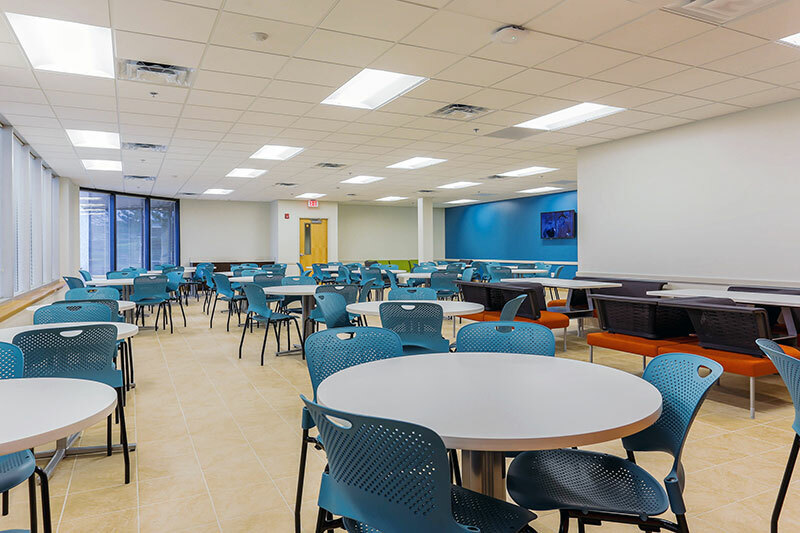 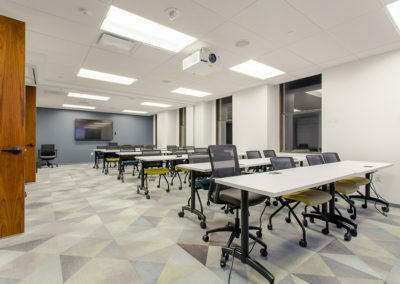 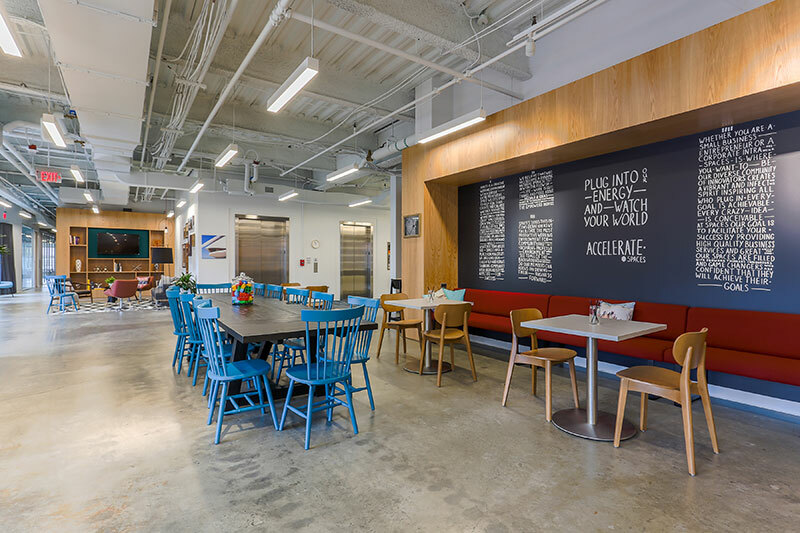 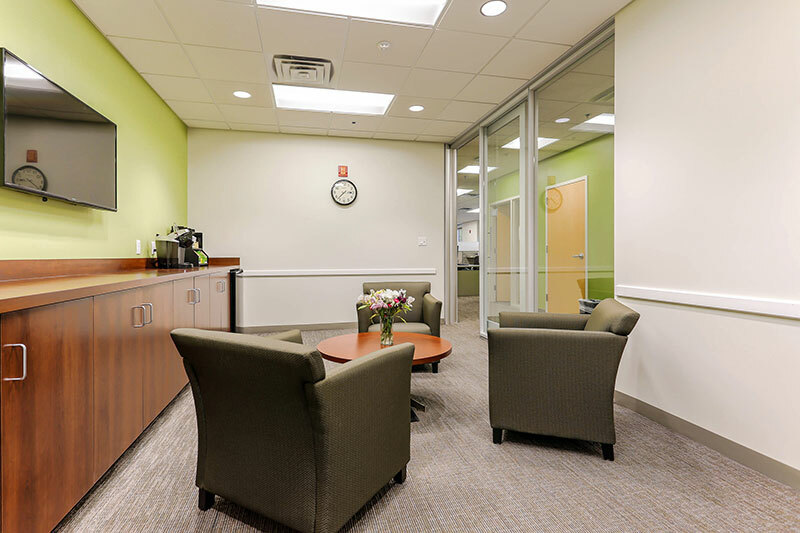 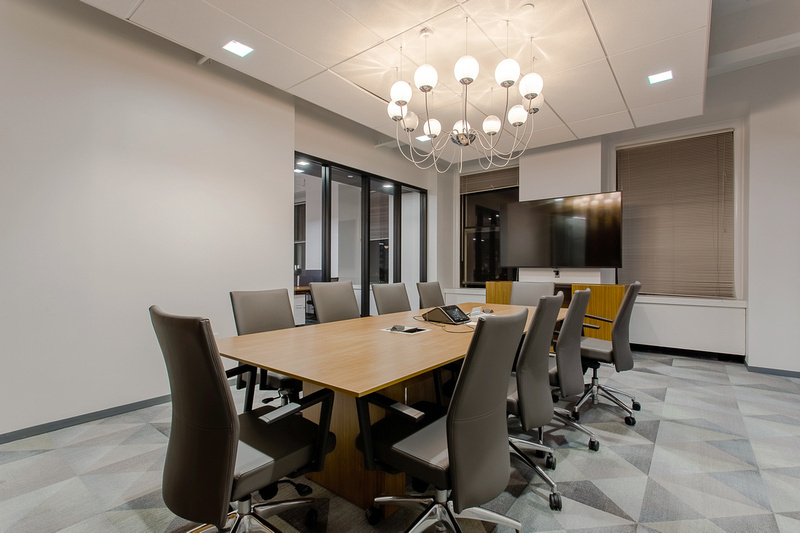 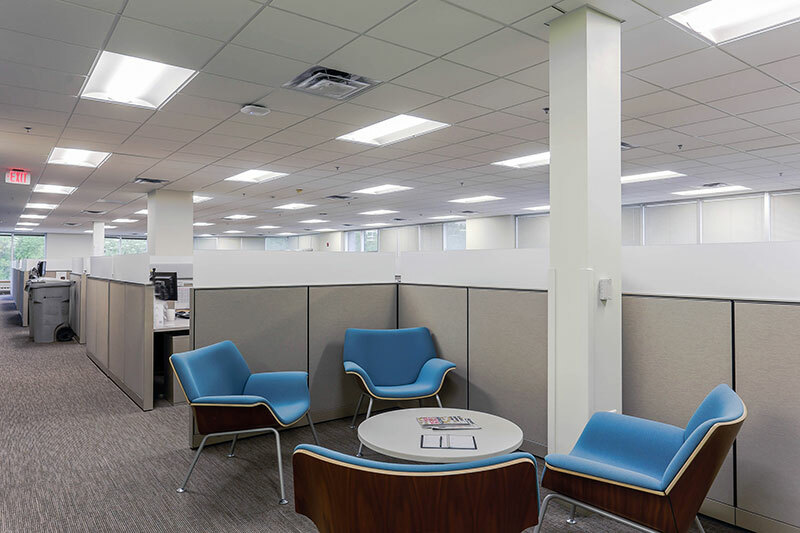 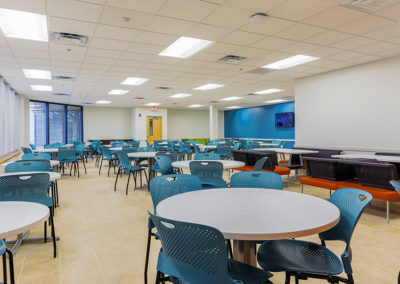 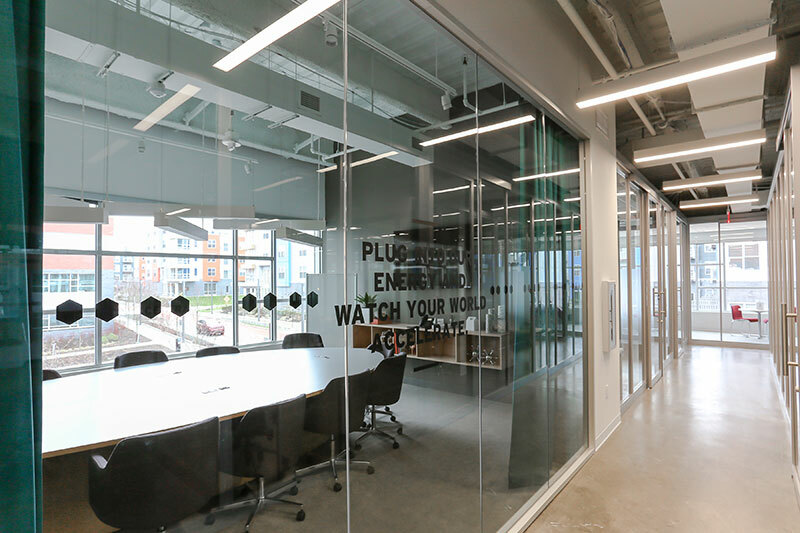 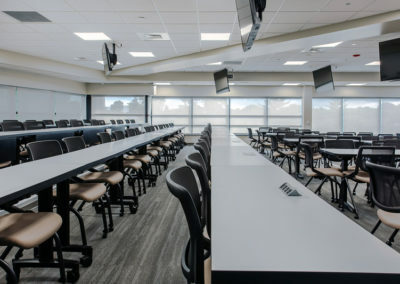 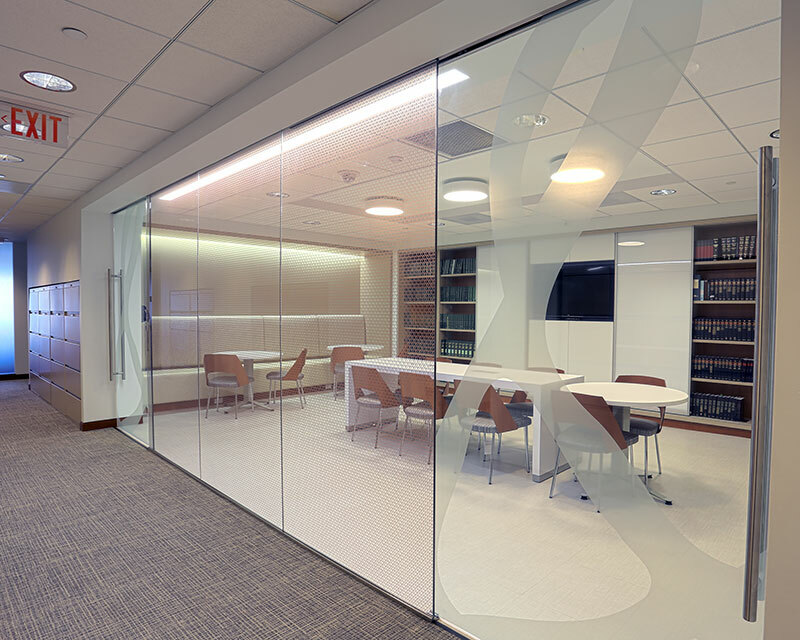 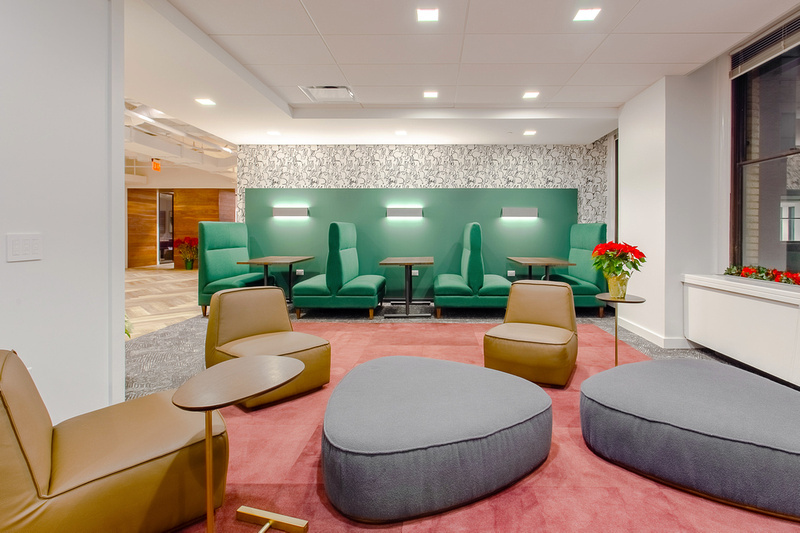 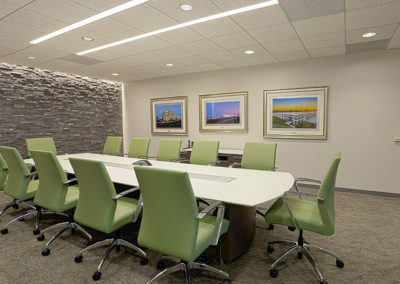 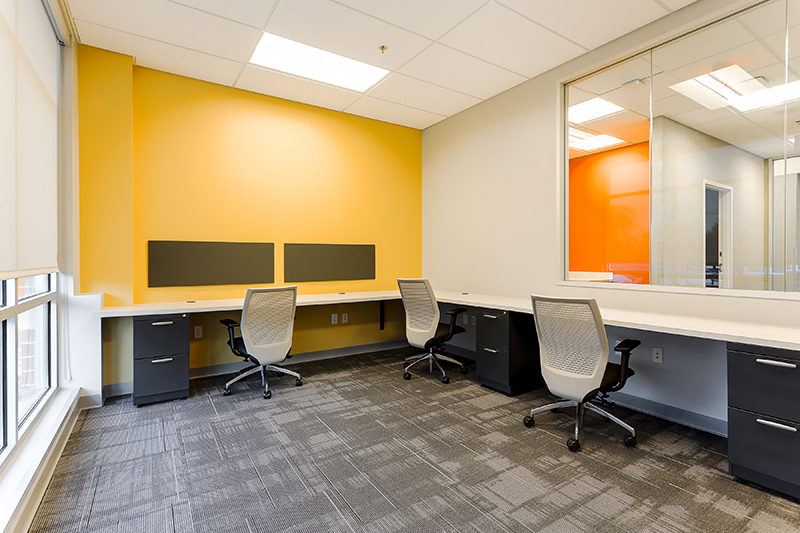 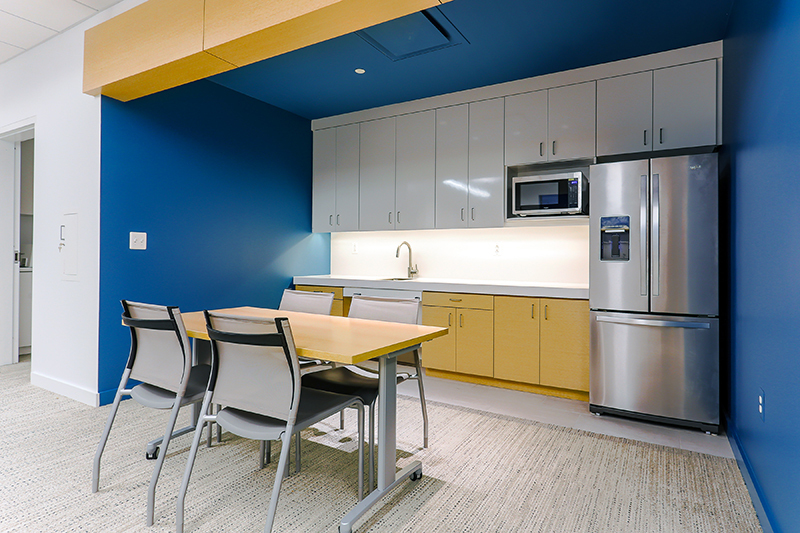 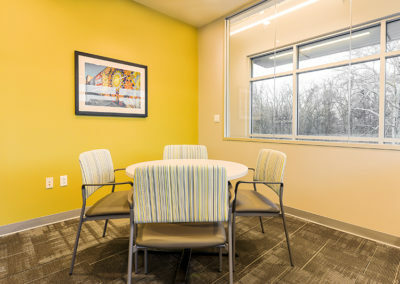 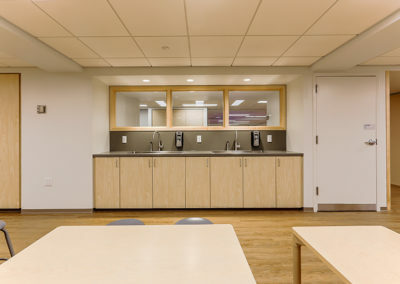 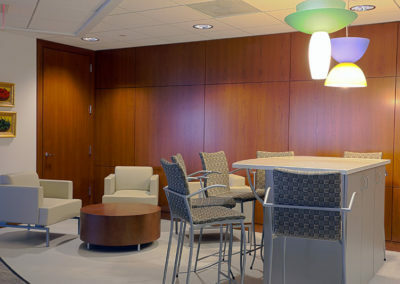 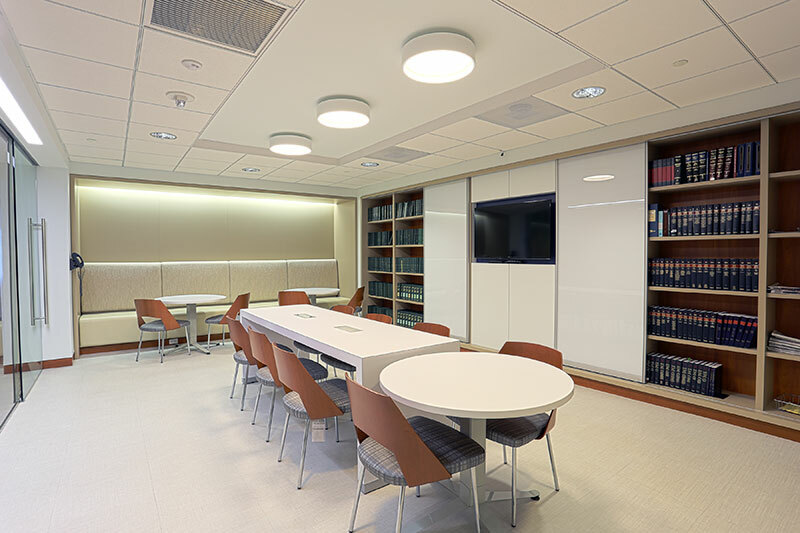 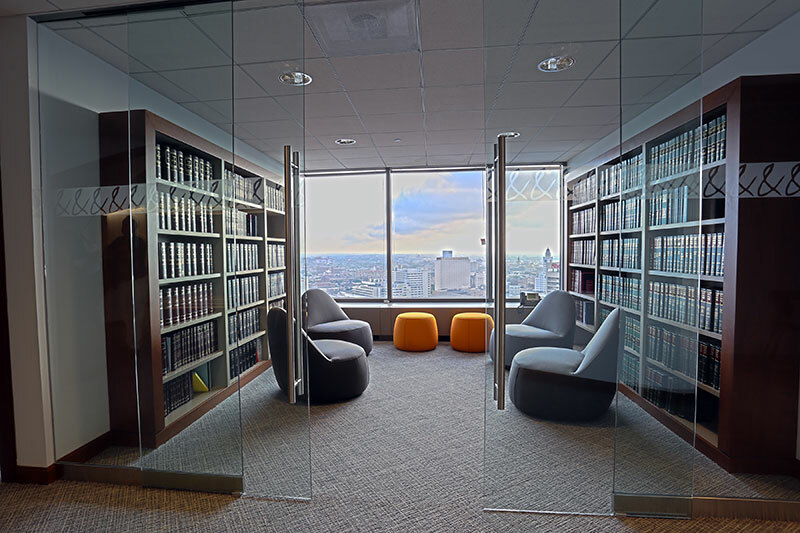 Work consisted of custom built admin stations, conference rooms, and 2 pantry/library areas with custom banquette seating, frameless glass sliding doors and back painted glass. 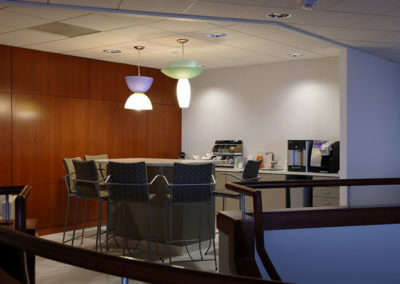 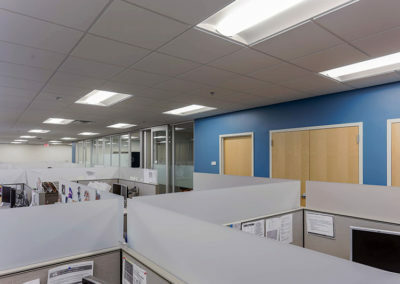 Interior fitout of approximately 70,000sf. 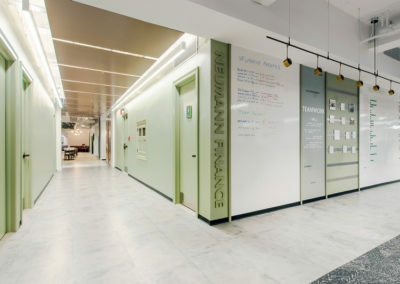 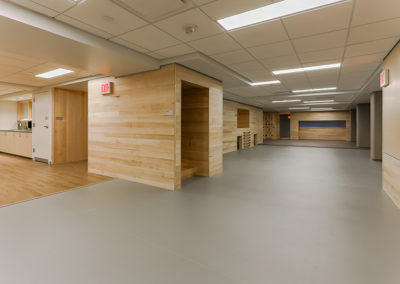 The project involved 4 phases within 2 separate buildings on the campus. 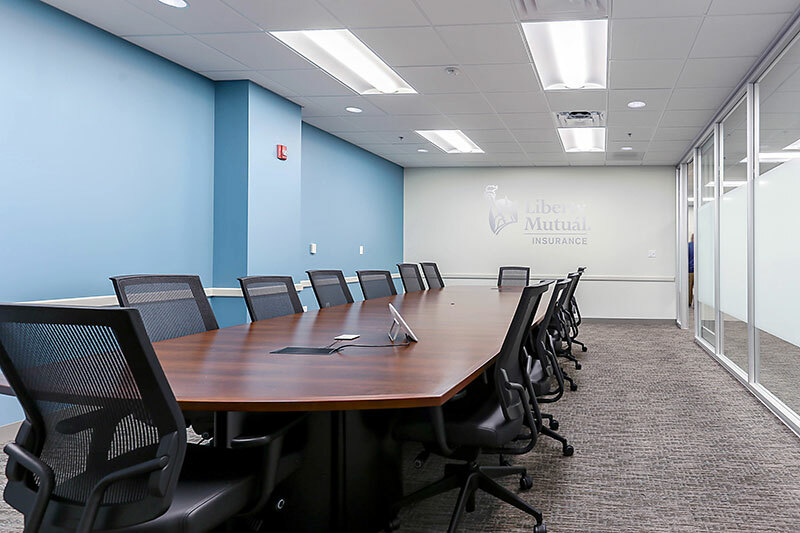 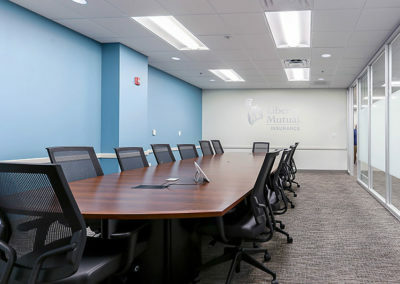 This was one of 15 locations we have completed for Liberty Mutual. 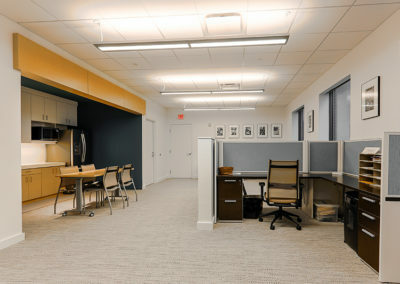 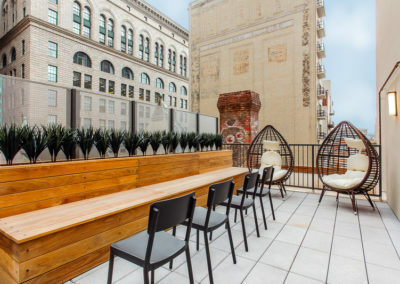 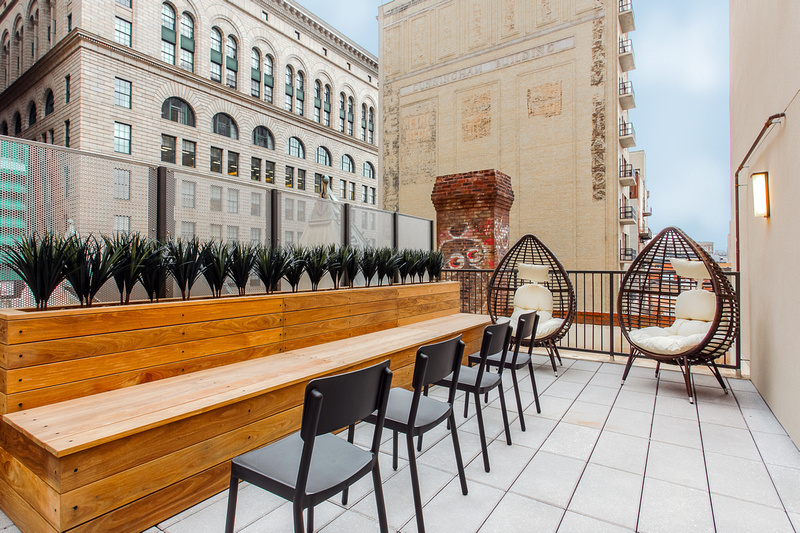 Renovation of 10,000sf of space within the Curtis Center Building at 601 Walnut Street. 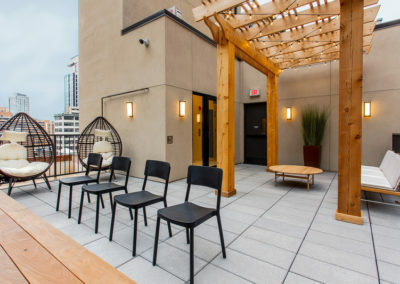 This was a challenging project due to the lower than usual deck height. 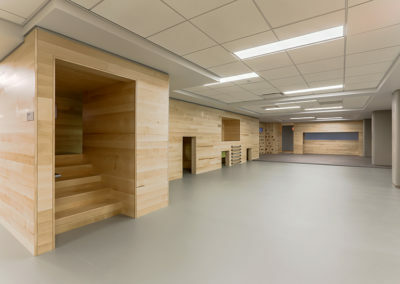 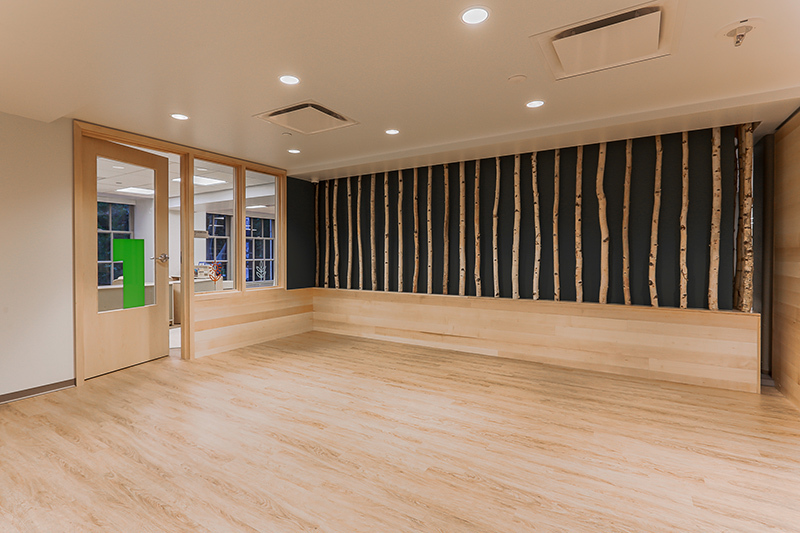 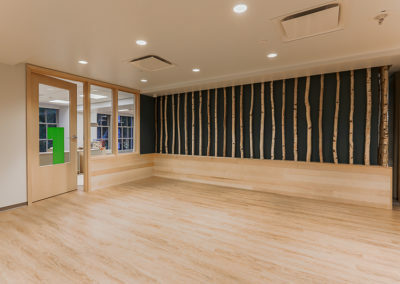 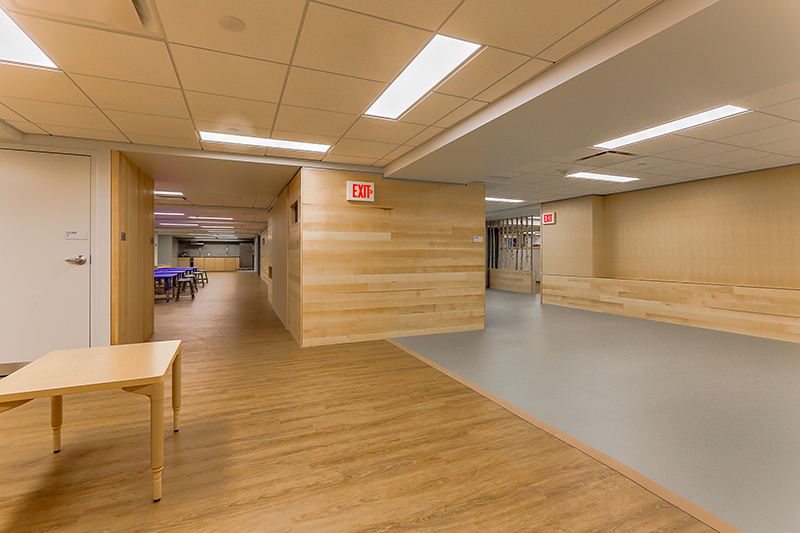 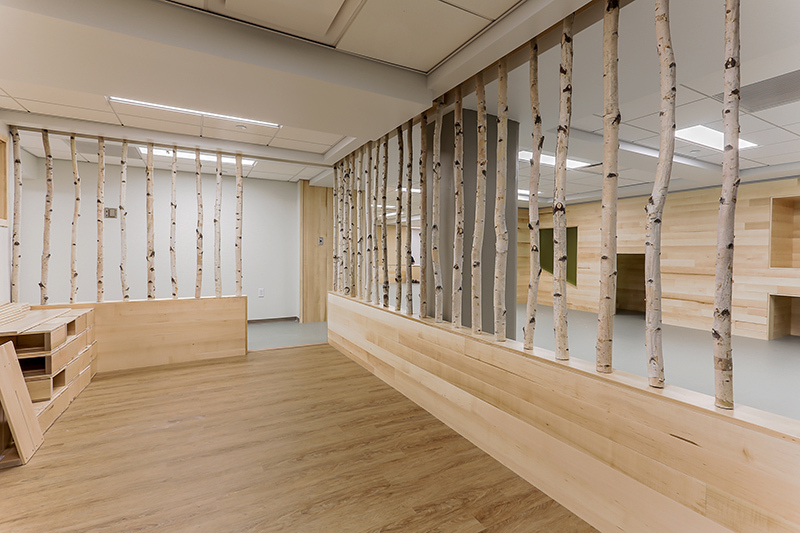 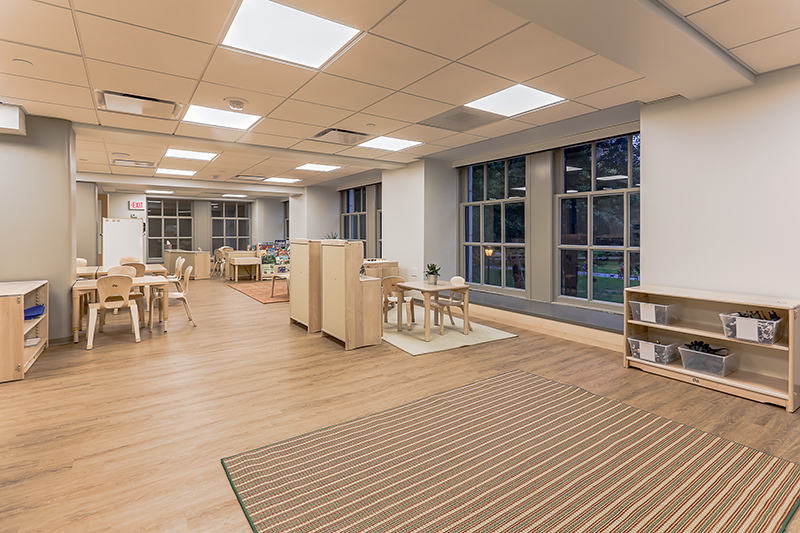 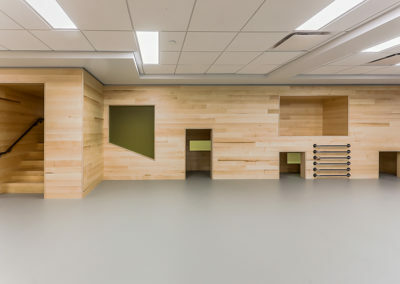 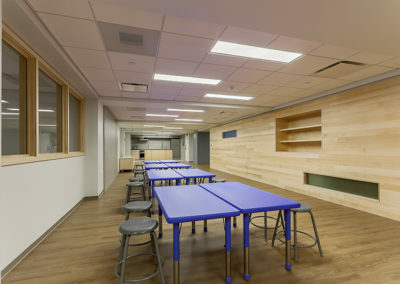 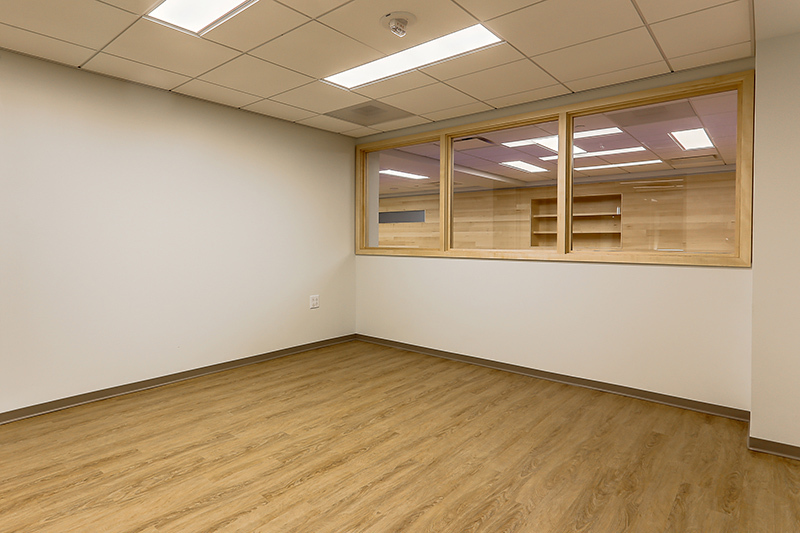 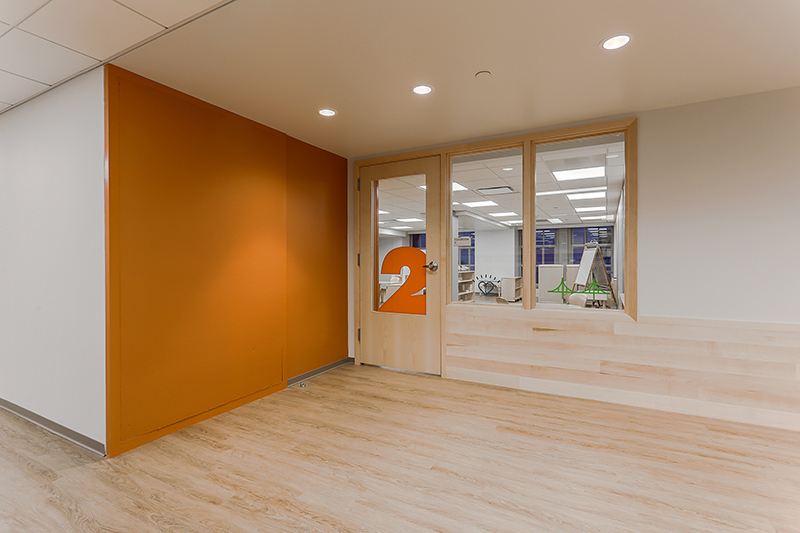 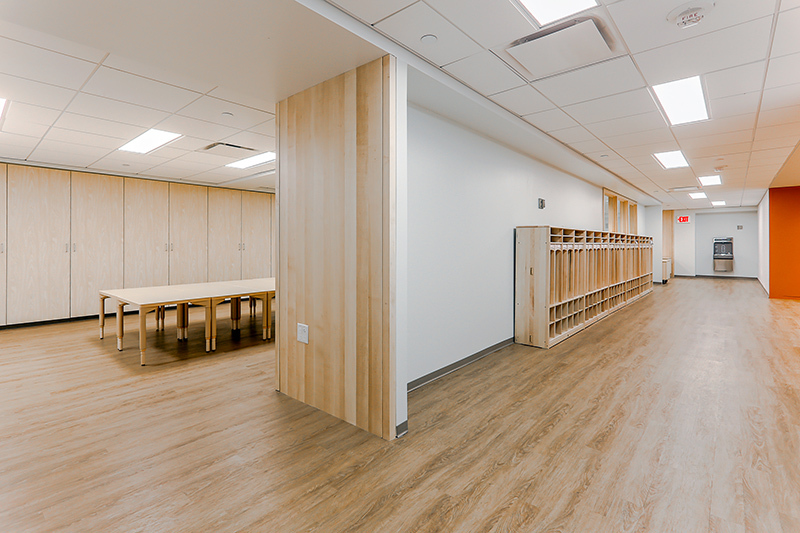 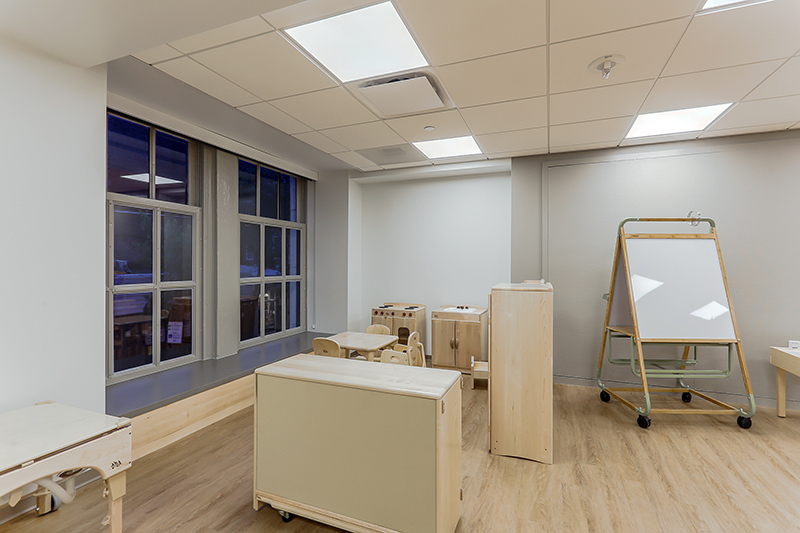 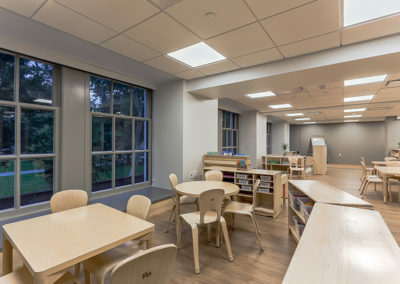 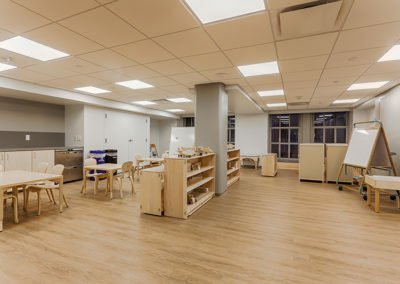 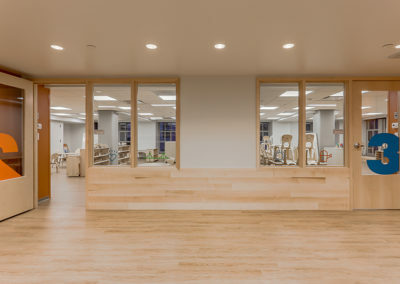 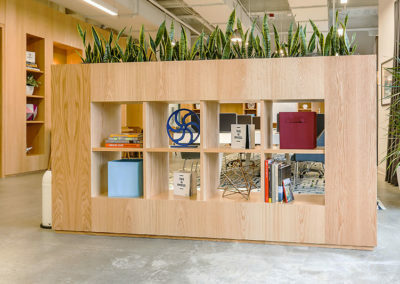 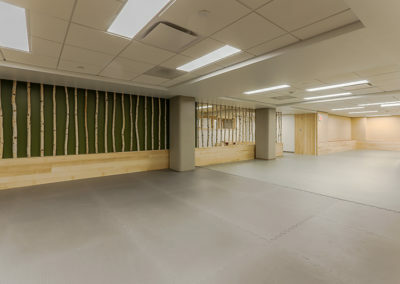 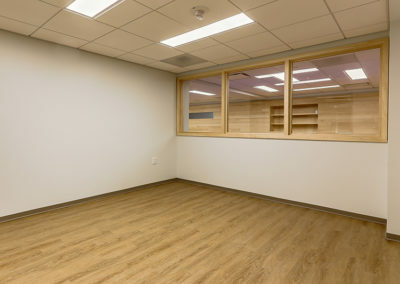 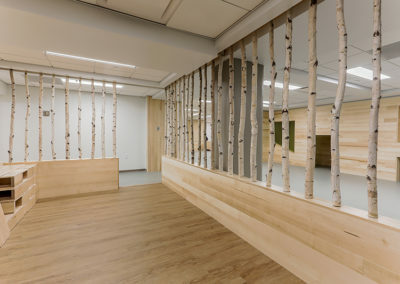 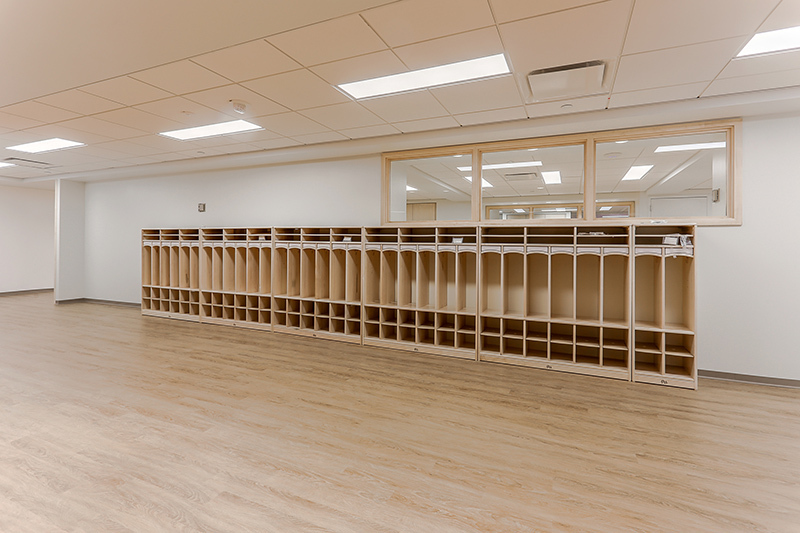 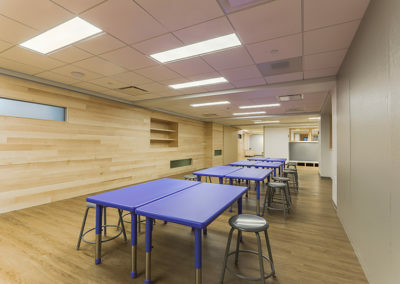 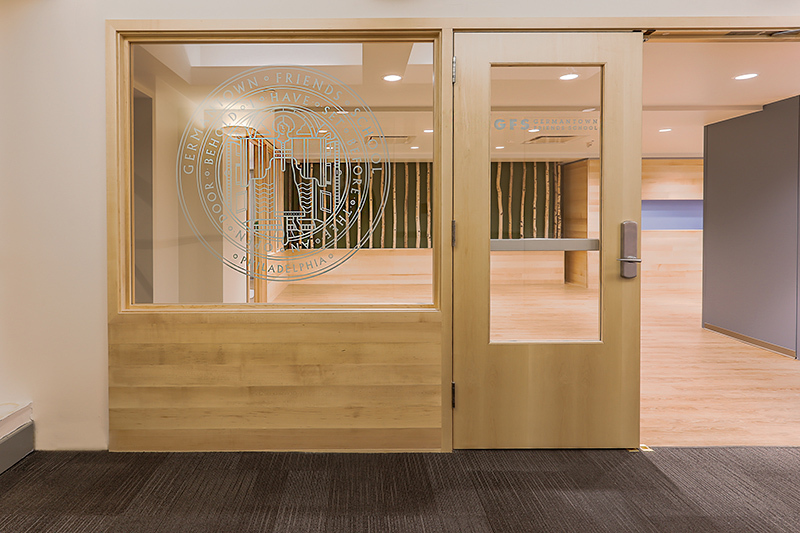 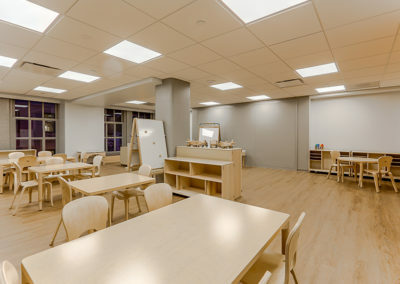 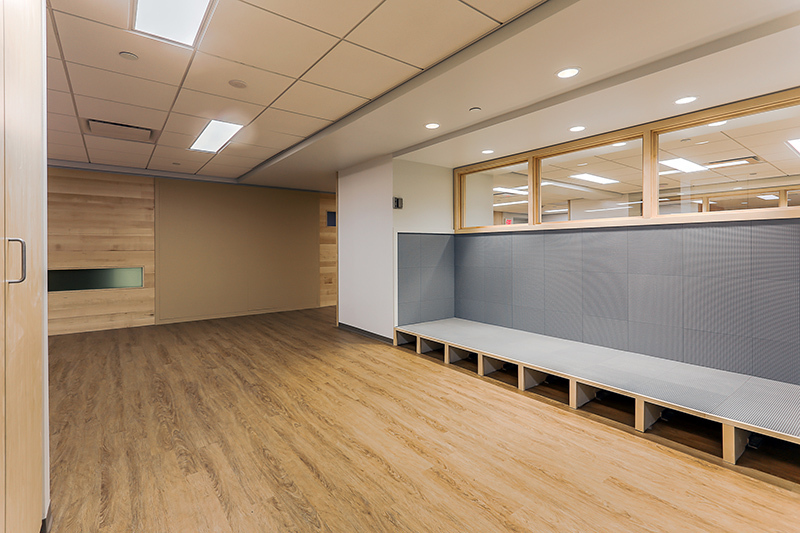 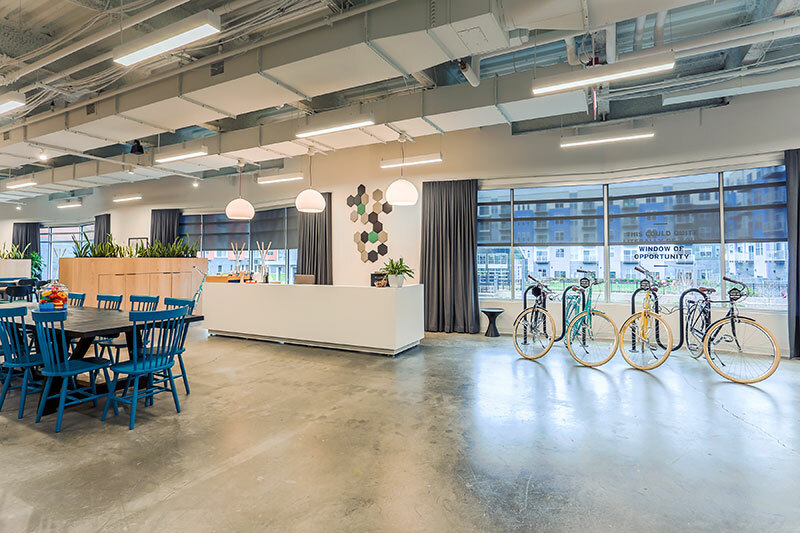 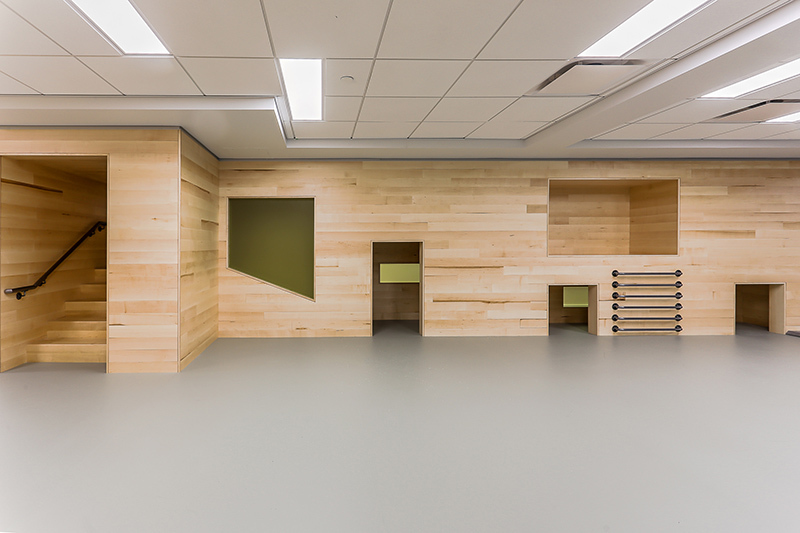 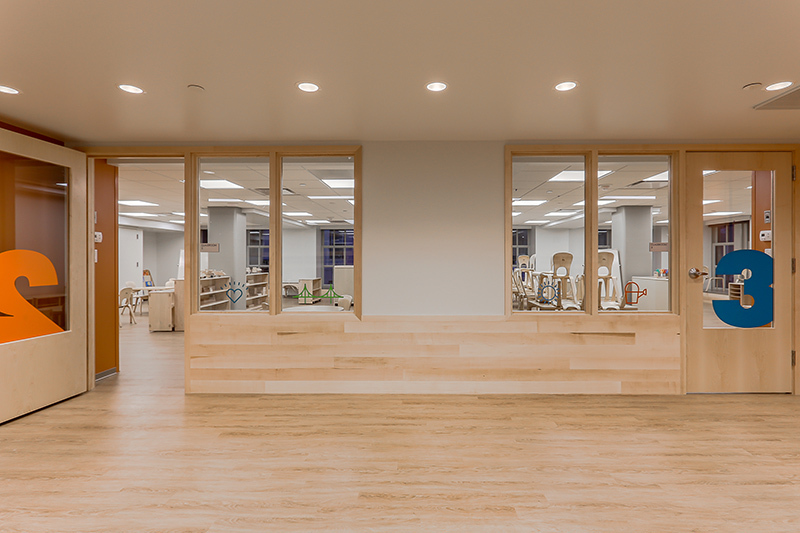 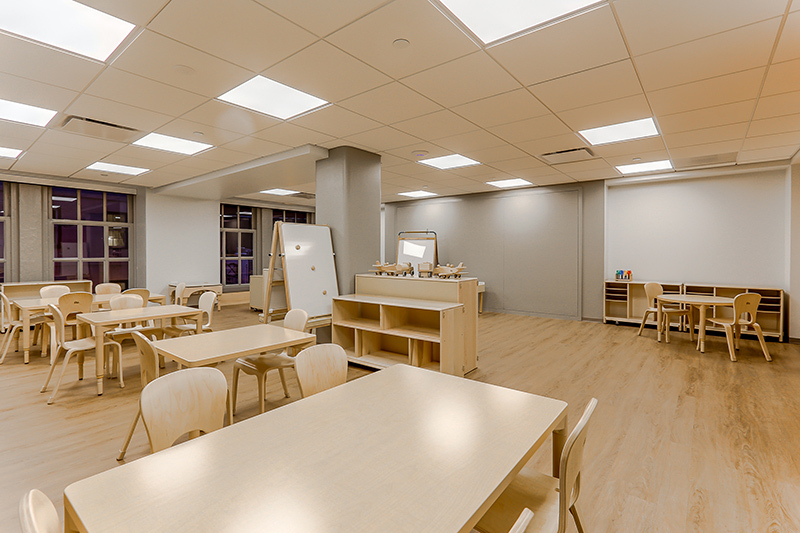 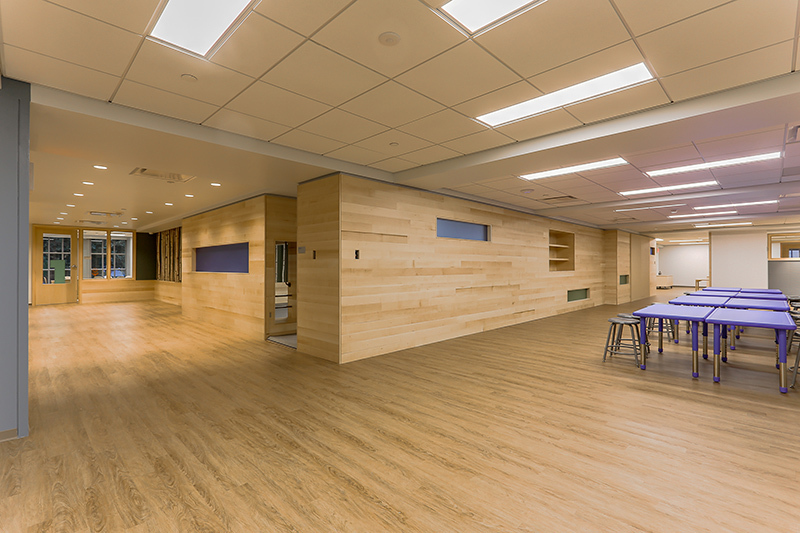 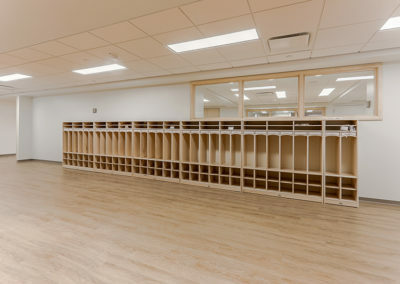 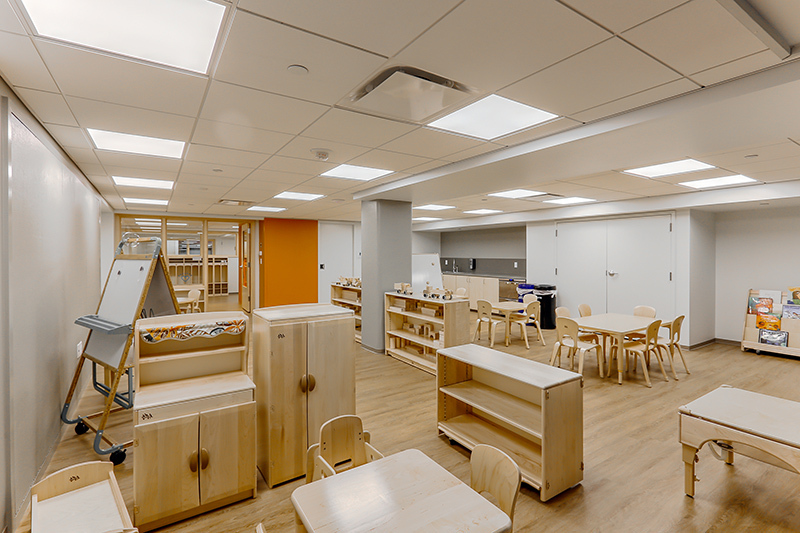 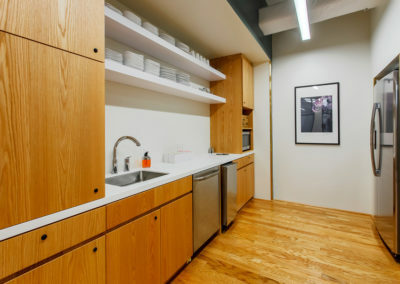 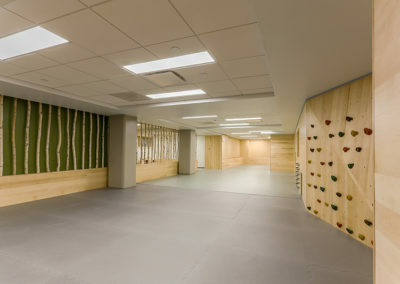 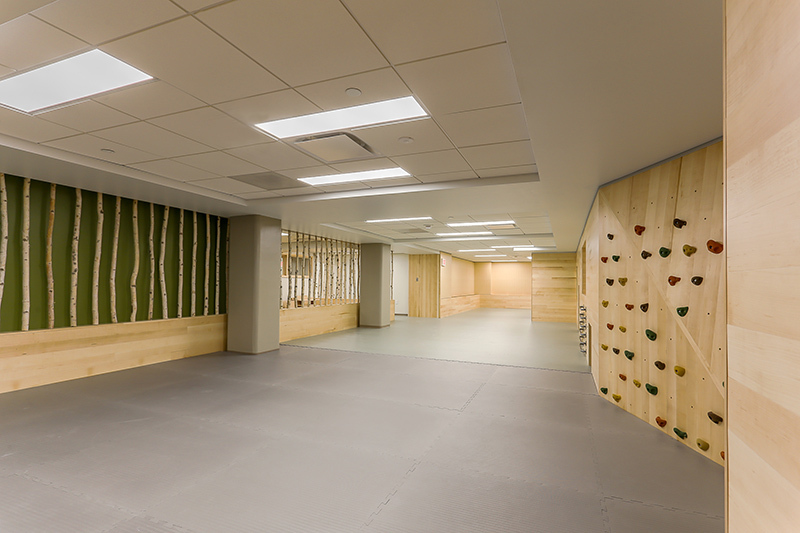 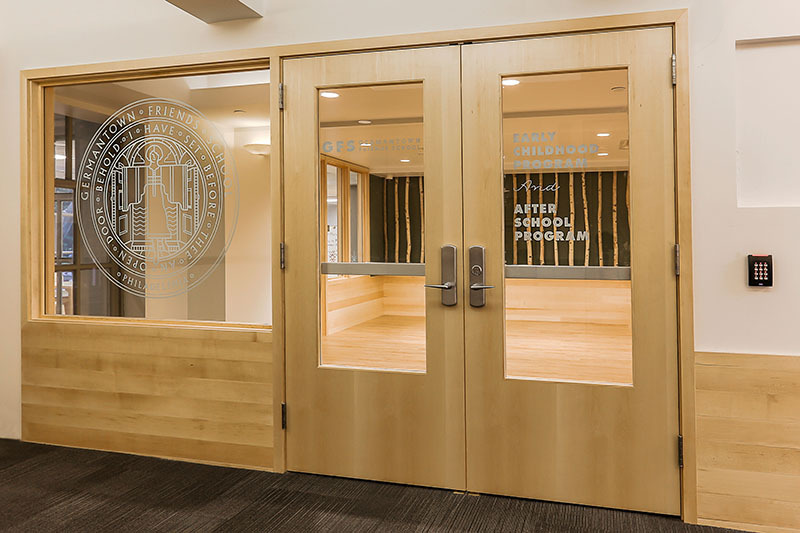 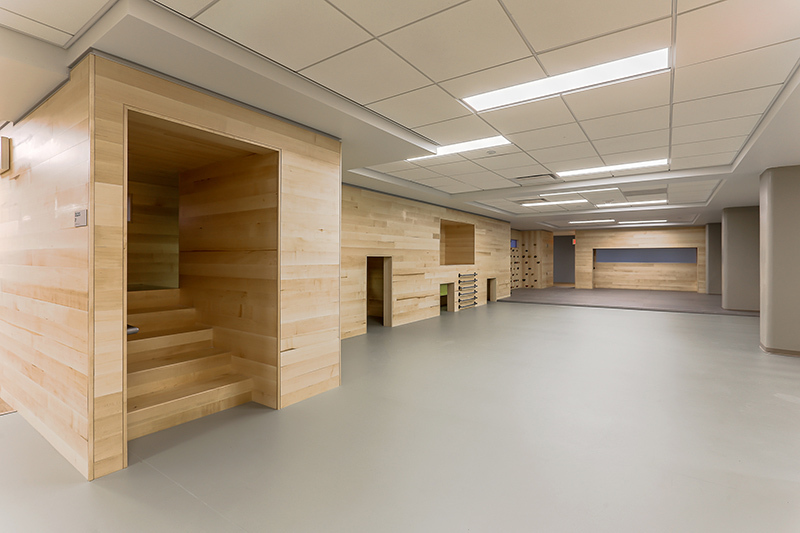 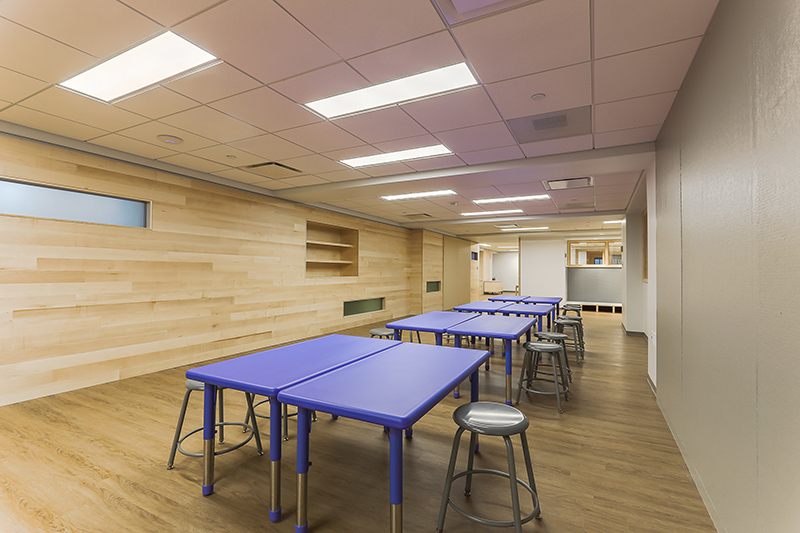 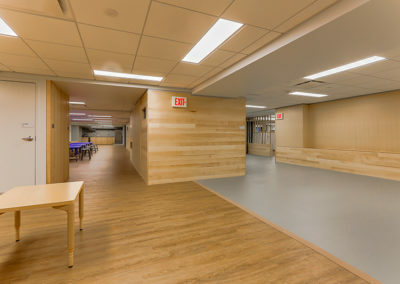 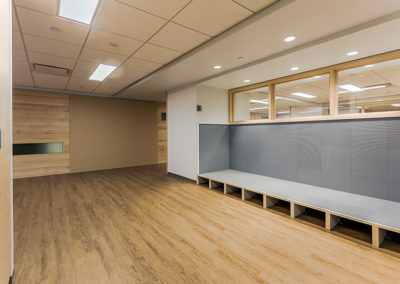 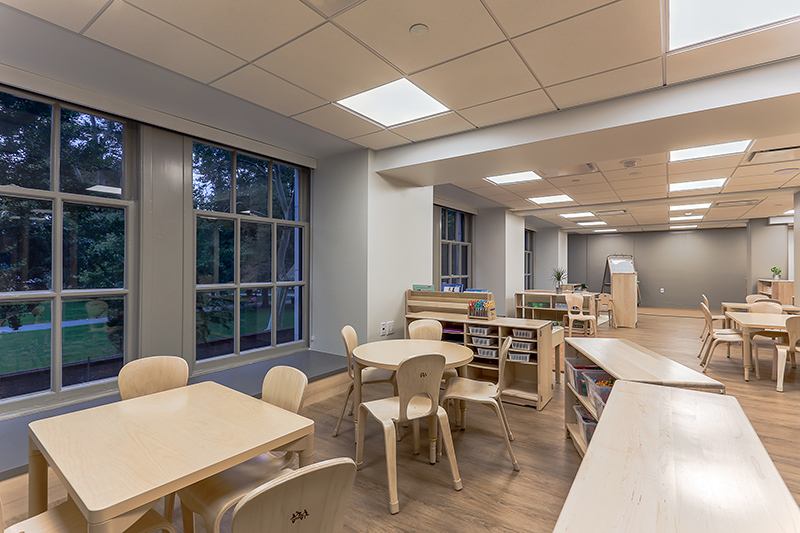 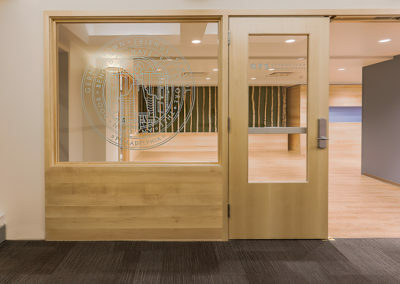 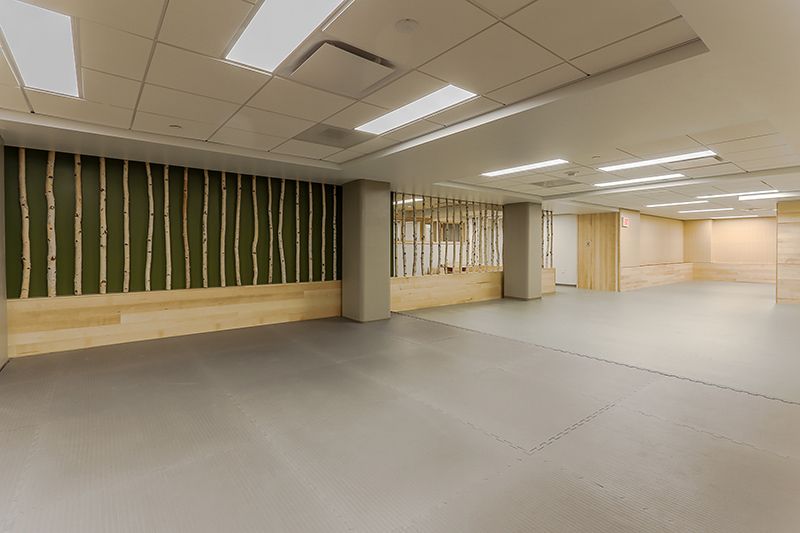 Work included custom millwork in which we used birch pole screening walls, custom maple plank walls and trim throughout as well as an indoor Activity Gym. 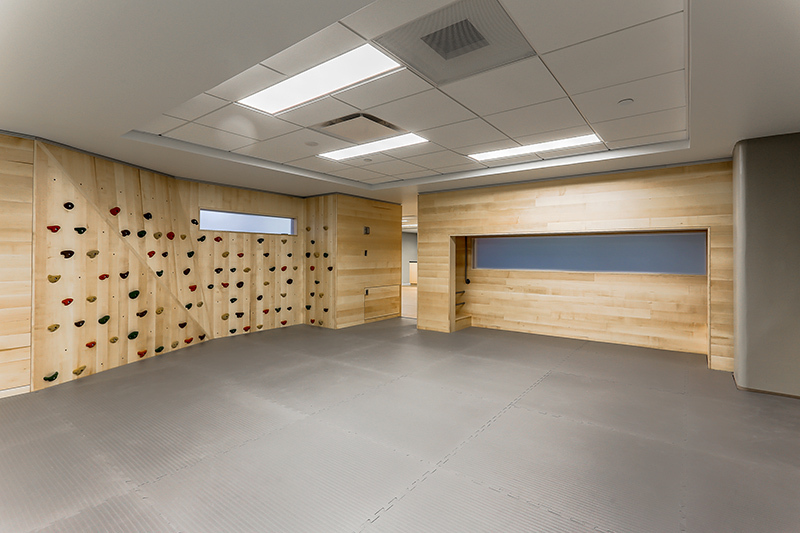 The gym consisted of a sliding board, monkey bars, hiding areas and a rock climbing wall. 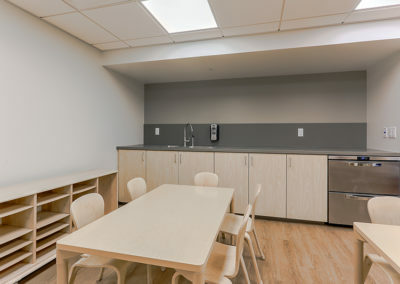 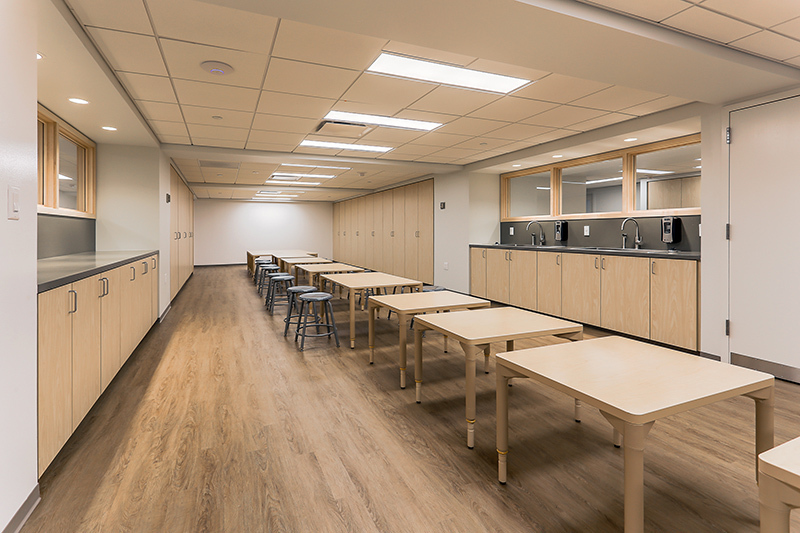 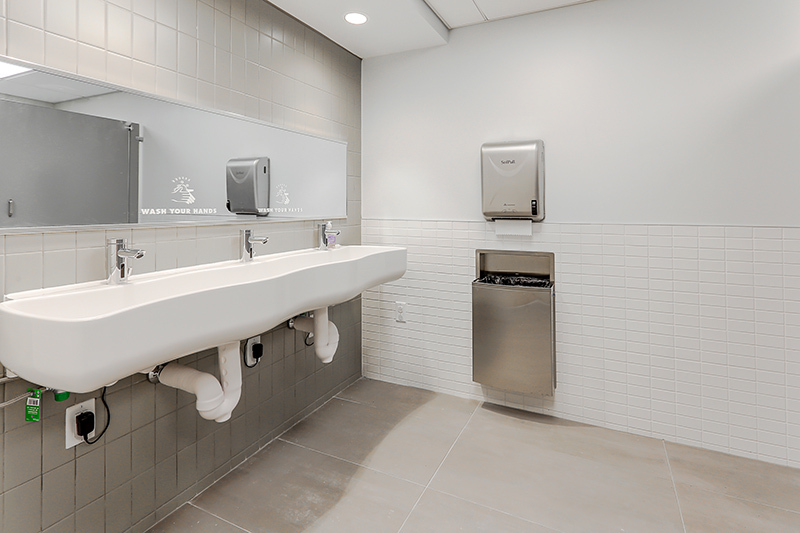 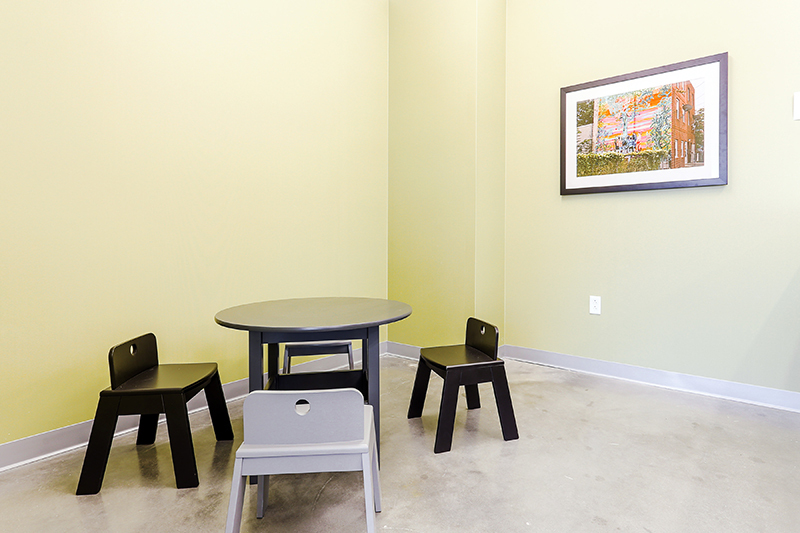 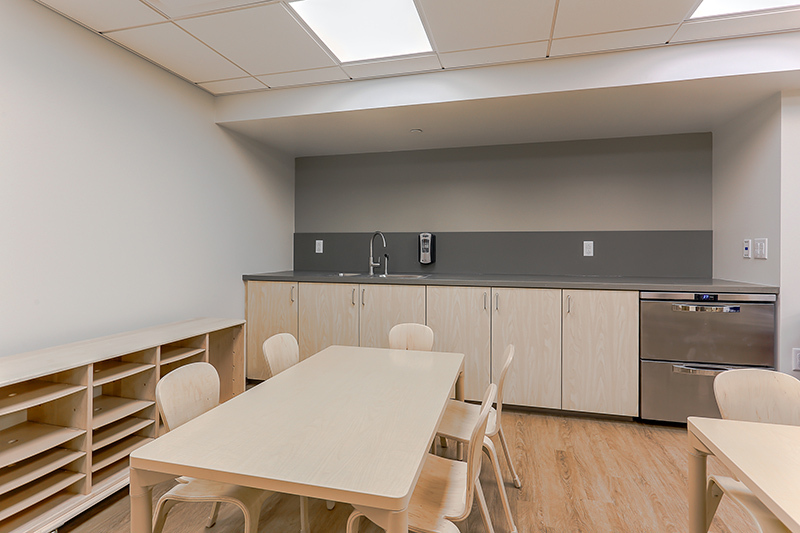 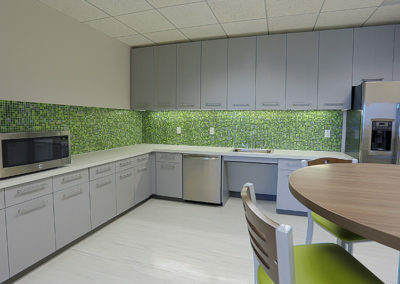 Other work included new restrooms, arts and crafts areas, classrooms and a food prep/lunchroom area.